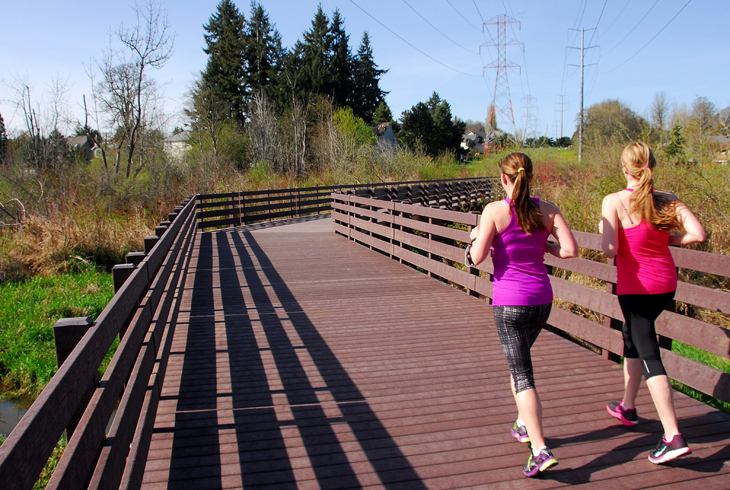 The Tualatin Hills Park & Recreation District (THPRD) is recruiting for a Visioning Task Force. Applications are being accepted now through April 21. THPRD needs a community-supported vision for the future of the District to influence programming, funding, and strategic planning. We are looking for diverse, multicultural, and energetic community liaisons to help get us there. 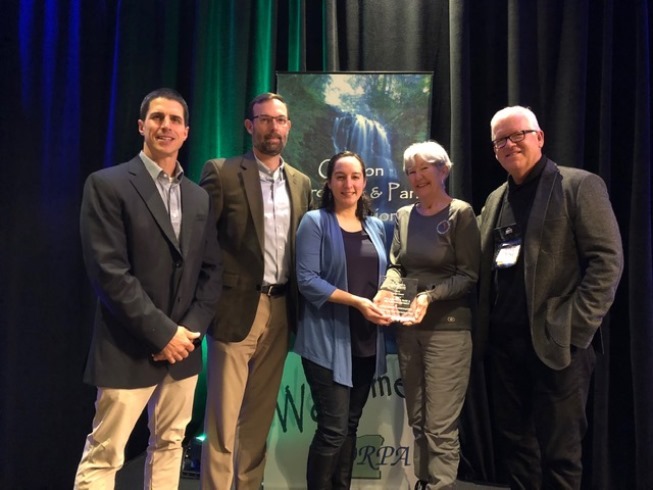 The Tualatin Hills Park & Recreation District (THPRD) was honored today by the Washington County Department of Health and Human Services with the Partner in Public Health Award. On May 21, 2019 an election will be held for the purpose of electing THPRD board members. Board members have called upon district staff to participate in county-wide coordinated discussions that are expected to begin this year. In the meantime, the Board directed staff to develop the next fiscal year budget with funding that benefits affordable housing development. THPRD hopes to make it easier for parents and guardians to attend district board meetings and participate in civic discussions. In-district registration for 2019 winter programs, classes and activities begins Saturday, Dec. at 8 am. 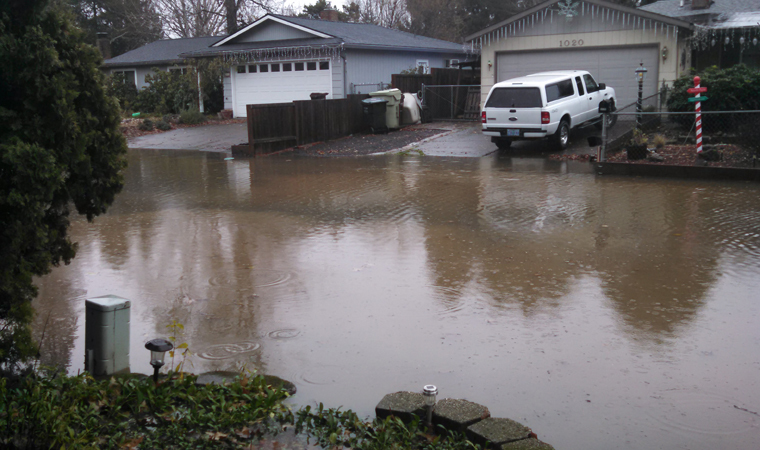 Welcome back the rain at this family-friendly event. 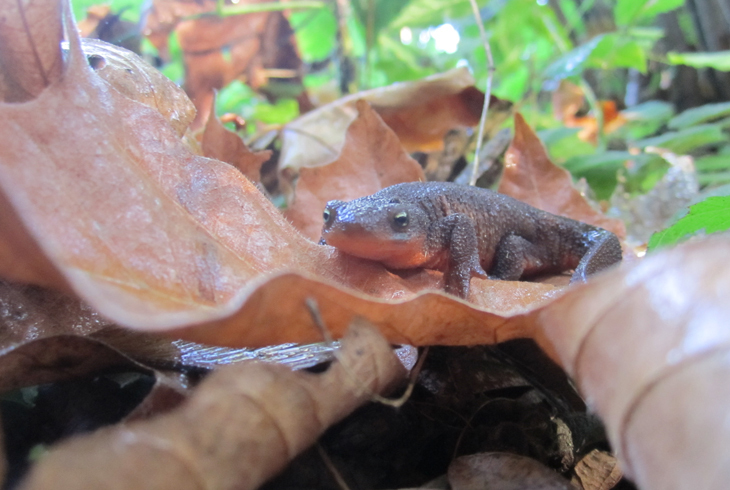 Learn about the healthy habitats that newts, and their fellow forest inhabitants, need to survive. THPRD is encouraging community members to apply for two openings on the district's Budget Committee. The deadline to submit applications is Friday, November 16. Get your gardening gloves out! 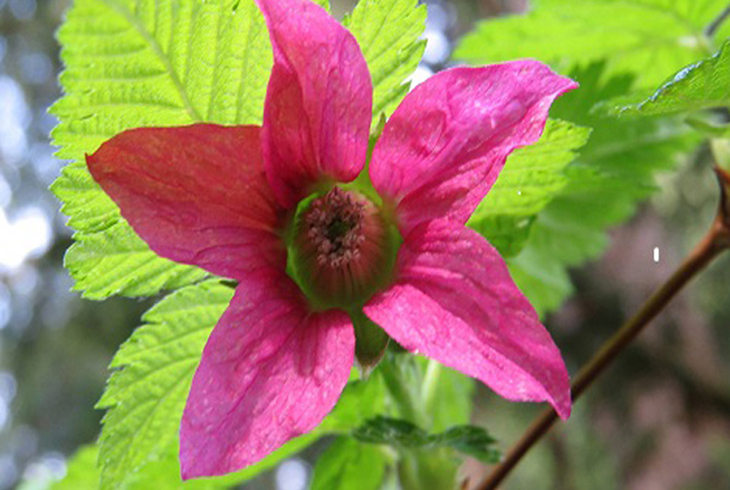 The 18th annual Tualatin Hills Park & Recreation District Fall Native Plant Sale is a great opportunity fill your garden with native trees, shrubs, and flowering plants. 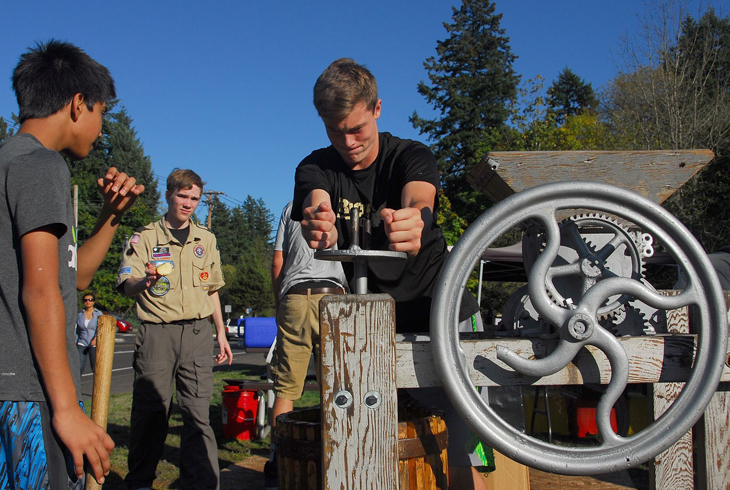 Get ready for history, community, cider, and fun at the 11th annual Cedar Mill Cider Festival on Sunday, Sept. 16. 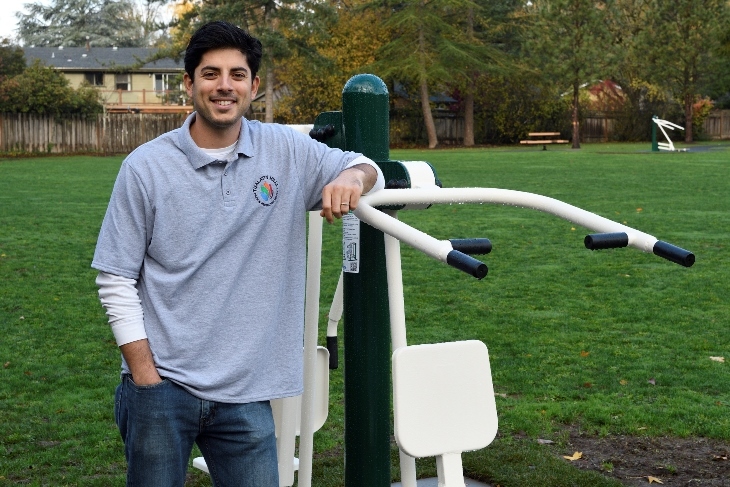 Todd Duwe, a Beaverton resident, has been appointed to the board of directors of the Tualatin Hills Park & Recreation District. 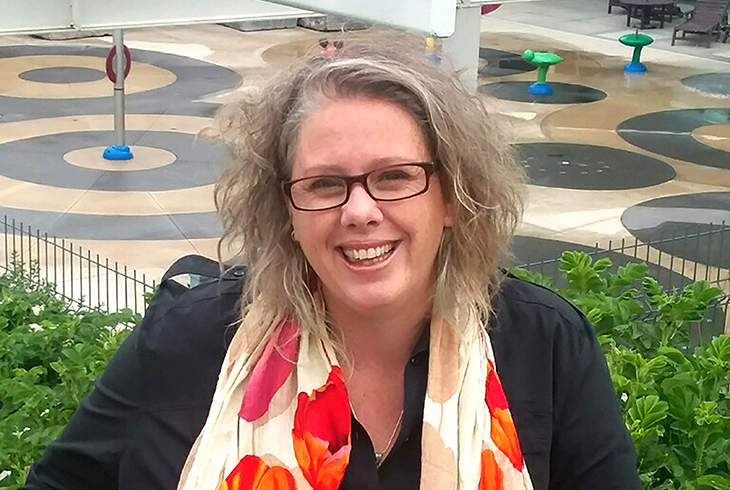 Holly Thompson has been hired as the district's Director of Communications. She replaces the recenly-retired Bob Wayt. With the district since 2005, Sabrina Taylor Schmitt has been promoted to Recreation department manager. 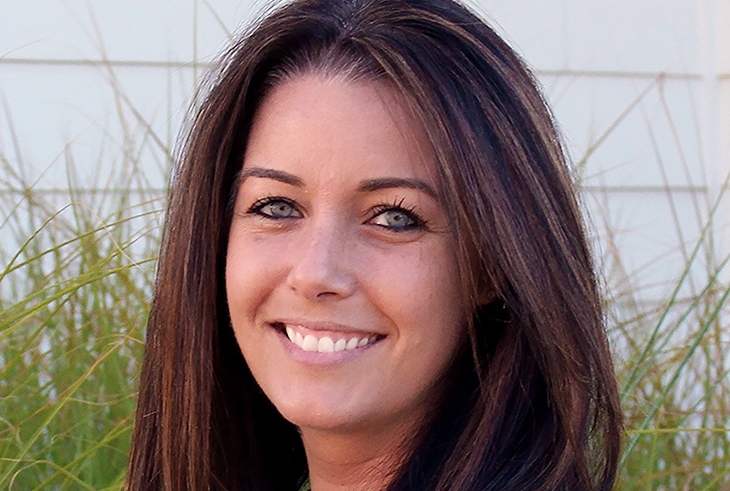 Julie Rocha has been named THPRD's Sports department manager. 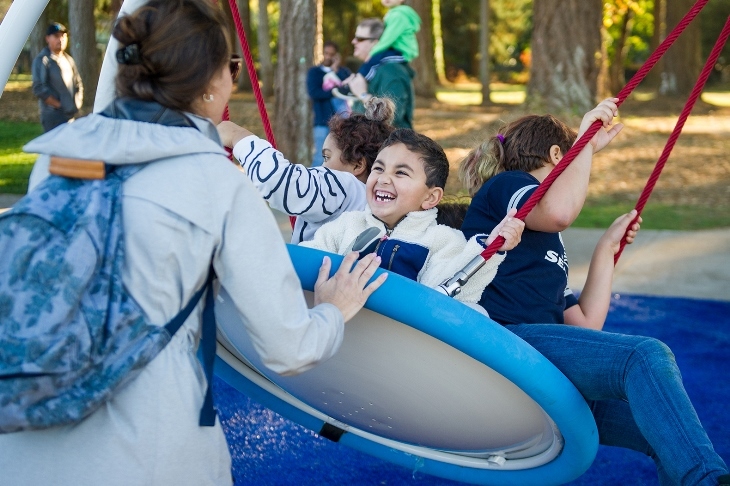 THPRD offers hundreds of fall classes, events, and activities. Registration will begin Aug. 18. 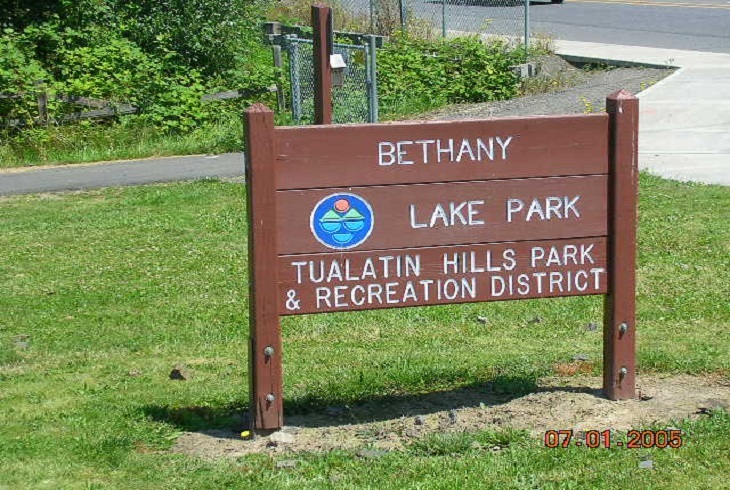 Holly Thompson has submitted a letter of resignation from the Tualatin Hills Park & Recreation District Board of Directors. The board will accept the resignation at their Aug. 7 meeting. 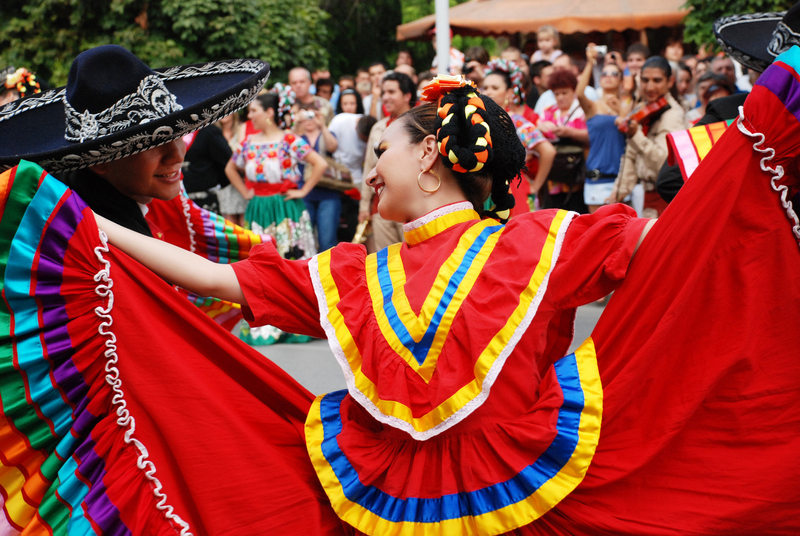 The Tualatin Hills Park & Recreation District will debut a new festival in August with Fiesta en el Parque, a celebration of Latino culture, food, and fun. 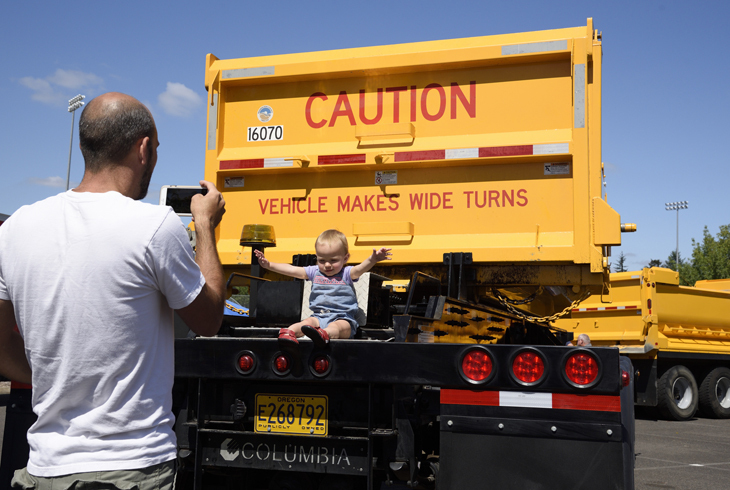 Transportation trucks, tractors, dump trucks, fire trucks and more will be on display during the 20th annual Big Truck Day. 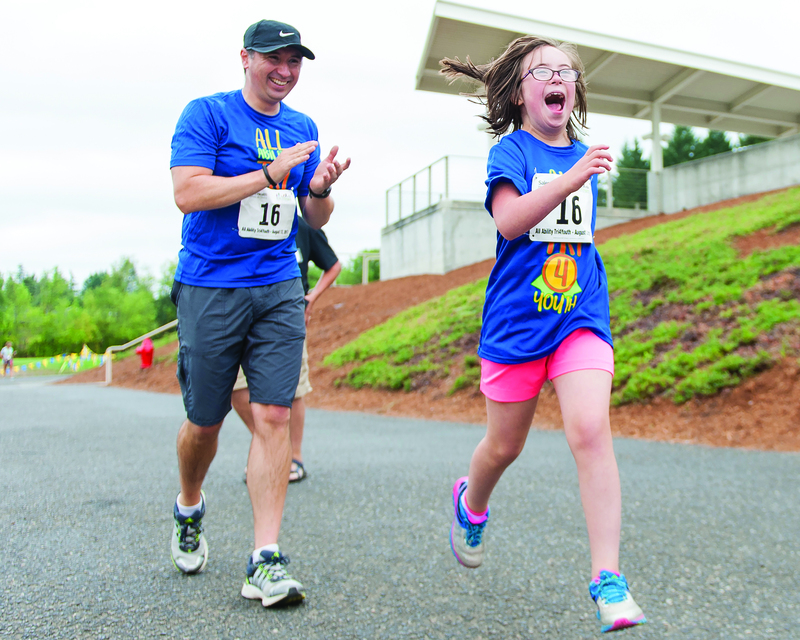 Set for Aug. 4, this is one of the district's most popular events. 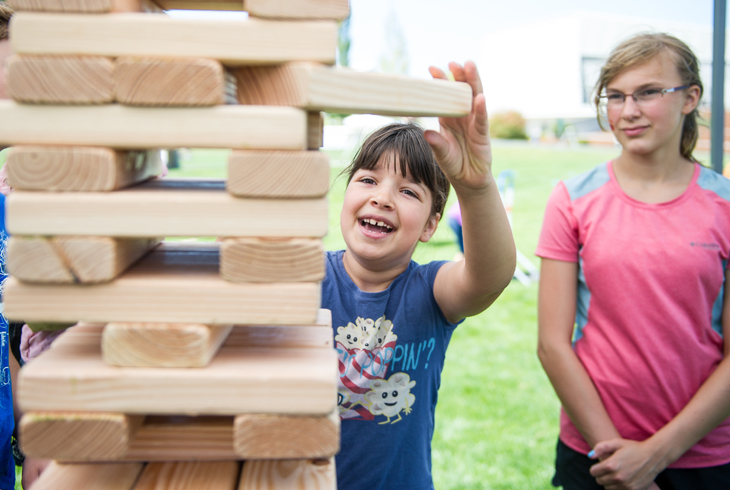 Our signature summer event, the daylong festival is back with a dizzying array of free family fun. 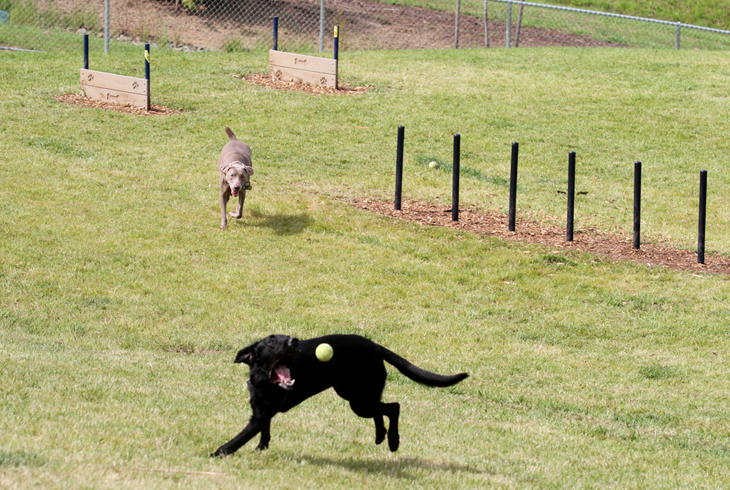 Most activities run from 11 am to 4 pm. 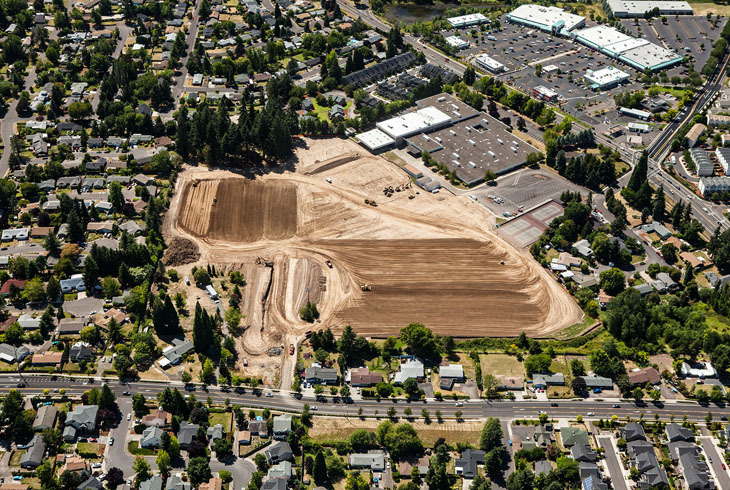 Construction on one of the Tualatin Hills Park & Recreation District’s largest bond measure projects, the redevelopment of Cedar Hills Park, will start on July 9. 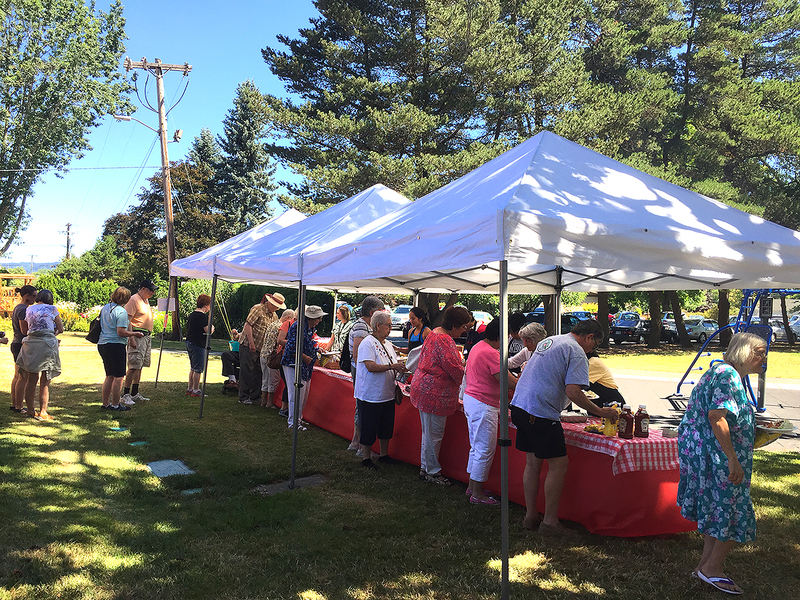 Get ready for food, music and family fun at the Elsie Stuhr Center’s Summertime Patio BBQ on July 6. 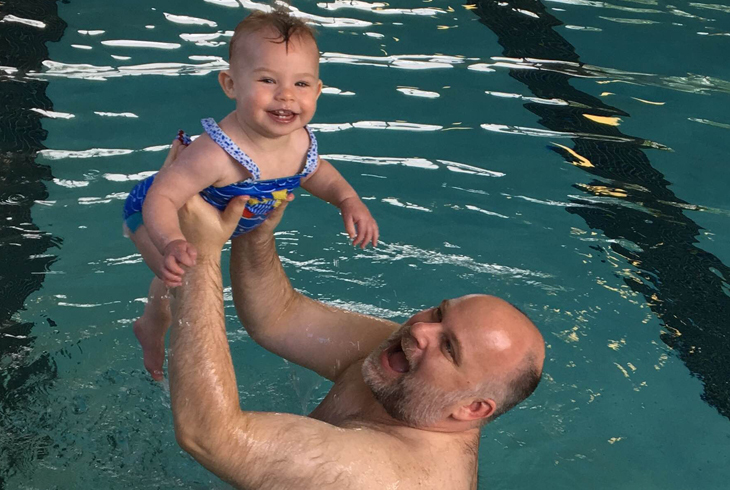 Ben Wu performed compression-only CPR, a skill aquired during lifeguard training, on a teammate stricken with commotio cordis, a rare and often lethal cardiac event. Beat the heat at one of the district's two outdoor pools, set to open June 25. 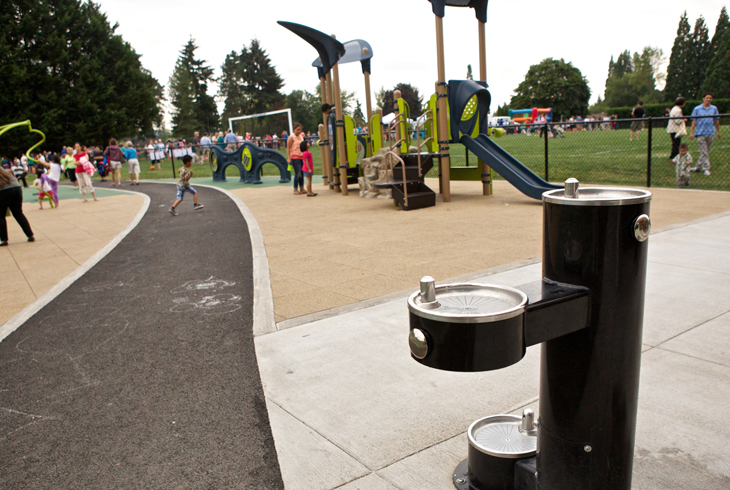 Or head to one of our splash pads today. 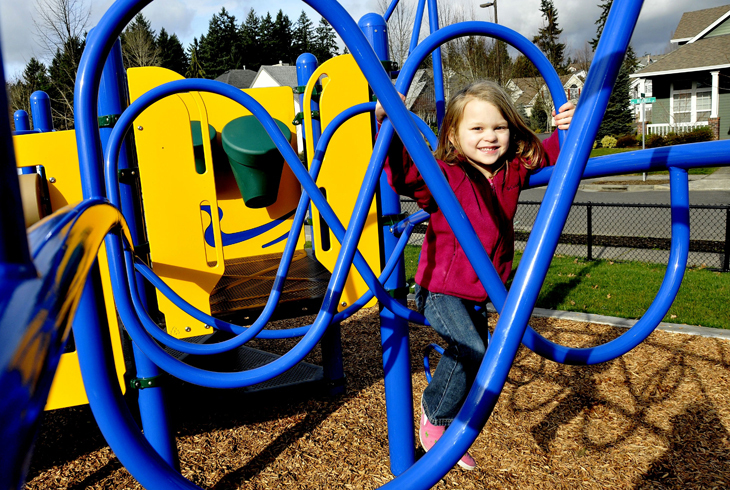 Through a partnership between THPRD and Beaverton Family Promise, the park district will host families for at least 3-4 weeks per year. During a given week, the families will stay overnight in one designated room of a THPRD recreation center. 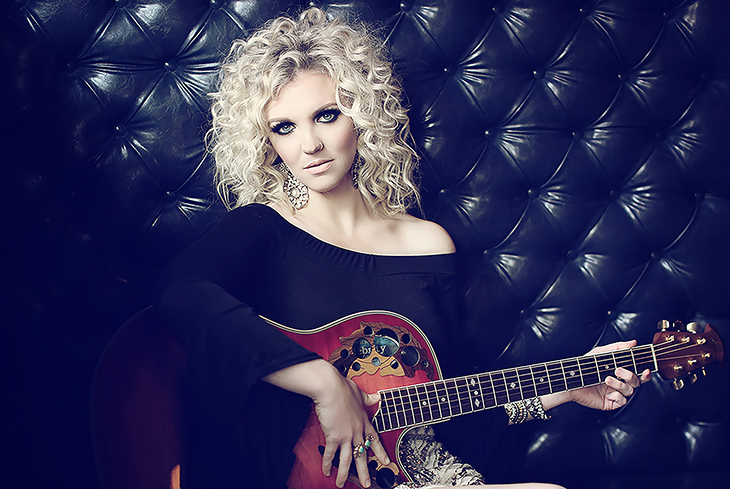 Country singer Britnee Kellog will headline the district's first Independence Day celebration at Veterans Memorial Park. The show kicks off the summer concert season. Looking for family fun this summer? Check out THPRD's entertainment lineup. There's something for nearly every age group and interest and most events are free. 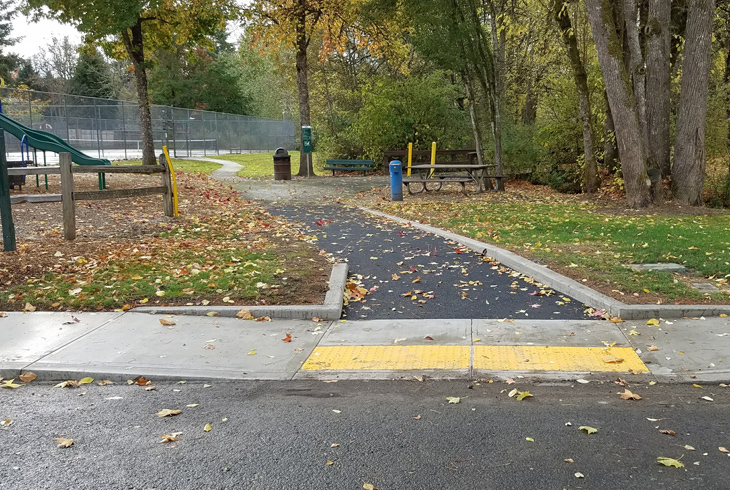 District volunteers joined forces with the City of Beaverton and other partners to help the Five Oaks Triple Creek Neighborhood Association Committee take home first place in the Neighborhoods, USA Neighborhood of the Year Beautification award. 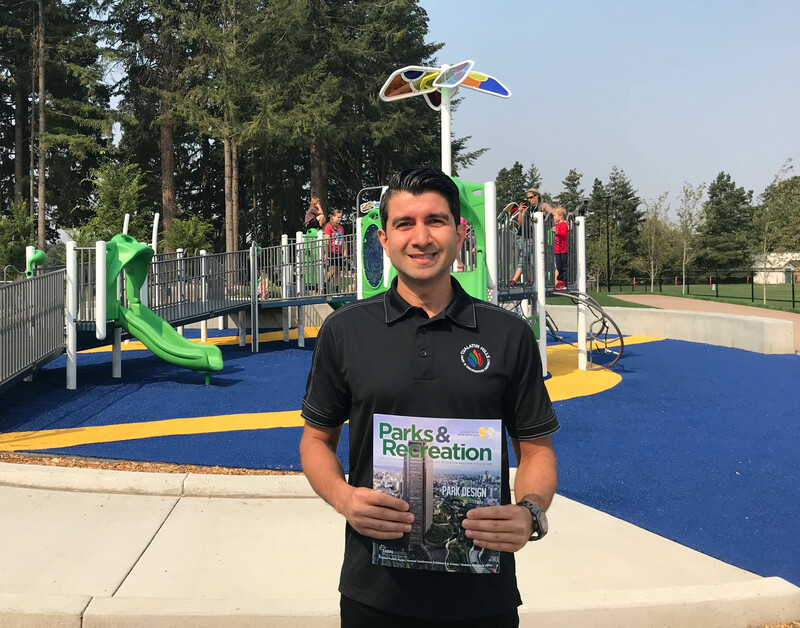 For the third consecutive year, the district has been selected as a finalist for the National Gold Medal Award for Excellence in Park and Recreation Management. 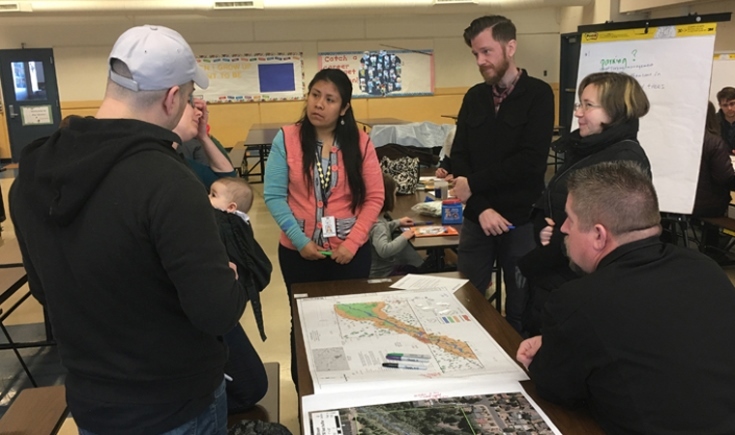 Residents affected by Cedar Mill Creek/North Johnson Creek flooding are invited to review initial remediation strategies and ask questions during a self-guided tour on Thursday, May 10, from 3-7 pm. THPRD is now taking applications for the Audit Committee's citizen postition. Applications for this position are due on Friday, May 25. 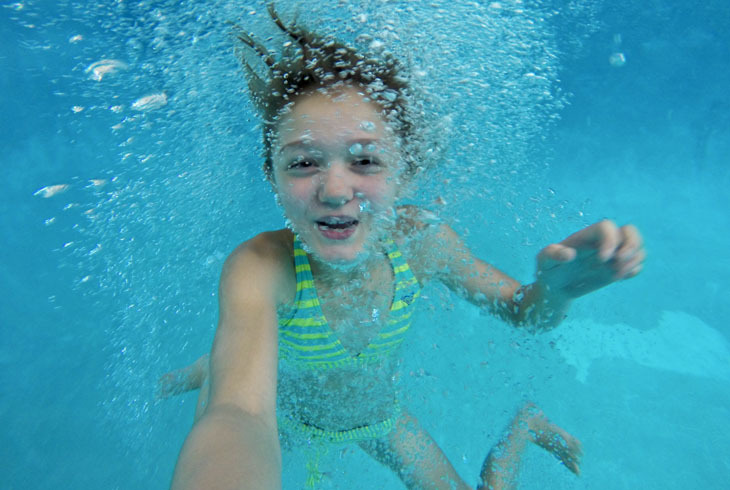 May is National Water Safety Month and THPRD plans special events all month long. This new option lets patrons make secure payments in person or over the telephone. 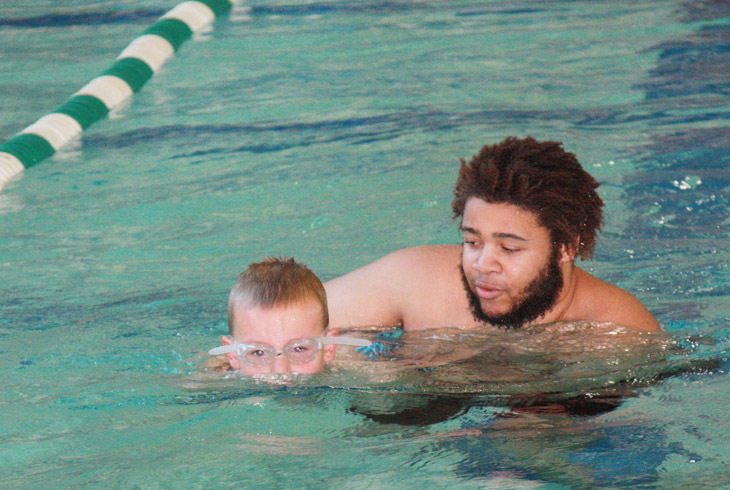 For the fourth consecutive year, THPRD will offer free swim lessons through USA Swimming Foundation's "Make a Splash" initiative. 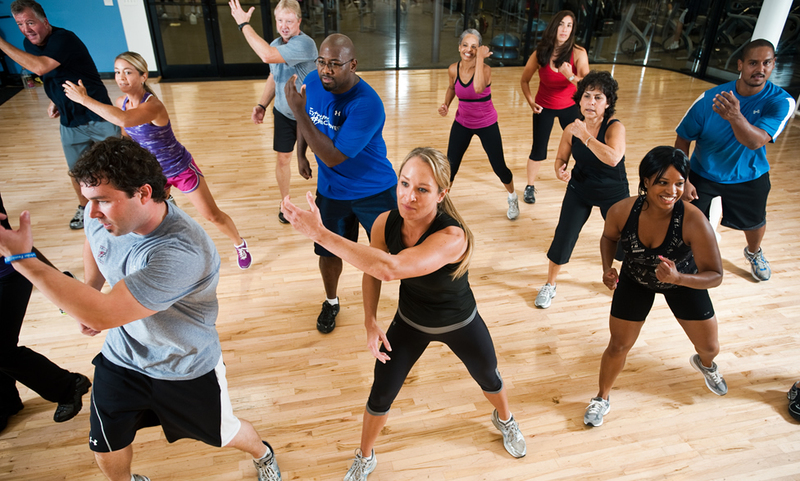 Get fit, make friends and enjoy the outdoors at THPRD's free Fitness in the Park and Walk With Me opportunities. The assessment wil gauge functional fitness through simple tests of strength, endurance and flexibility. Registration is required. Earning a CPRP is a, "pledge to our patrons and colleagues that we follow nationally established best practices," says Cathi Ellis, CPRP, supervisor, Garden Home Recreation Center. THPRD summer 2018 registration set to begin Saturday April 21. 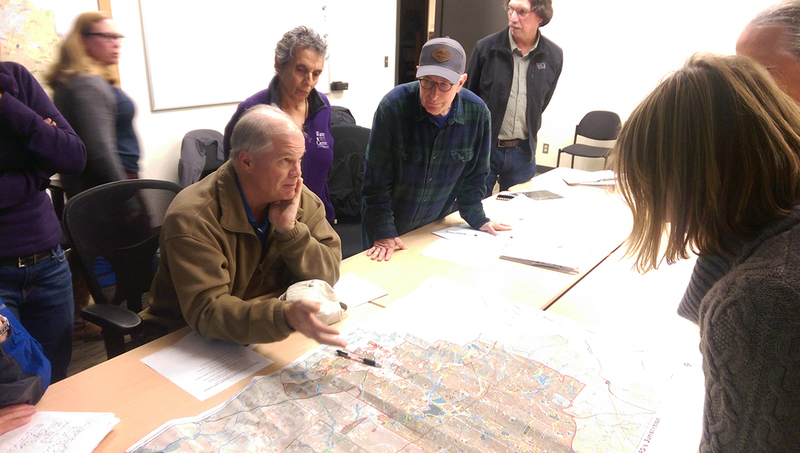 Ten community volunteers, out of a pool of 80, were appointed to THPRD advisory committees. Each person will serve a two-year term. 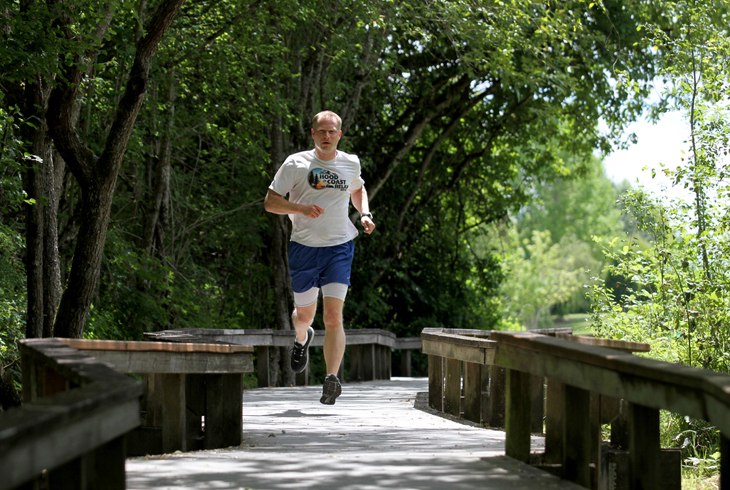 The new THPRD Nature & Trails Map is now available--for free--at many locations. 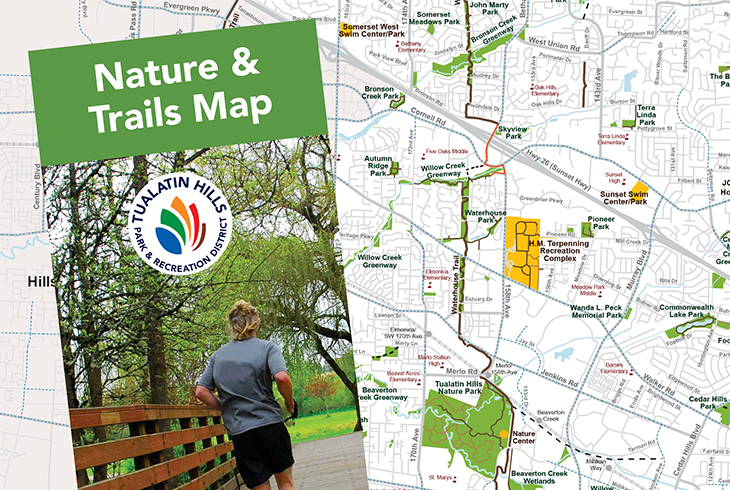 The map displays the district's growing trail network along with parks, natural areas, facilities, class information, and more. 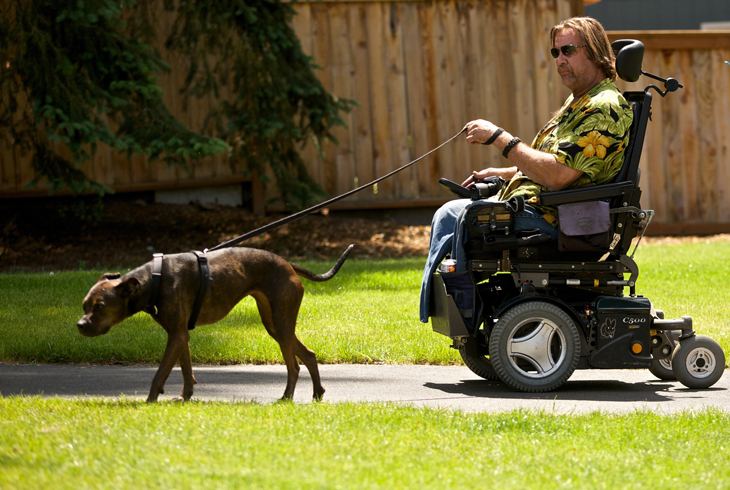 Lyme disease left Beverly Drottar depressed and unable to work. Volunteering brought her life back into balance. The installation is the first of its kind in THPRD's 50-square-mile service area. All signs gone as of 3-27-18. Morrison has been a volunteer coach at THPRD for two seasons. 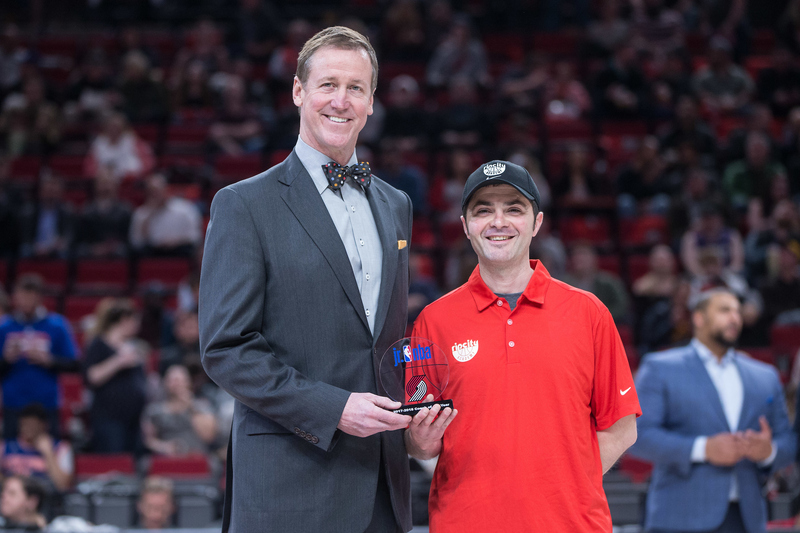 The award – which automatically entered him in the running for national Jr. NBA Coach of the Year – has not surprisingly given him extra incentive to continue. THPRD Board appoints Wendy Kroger as a fifth member. 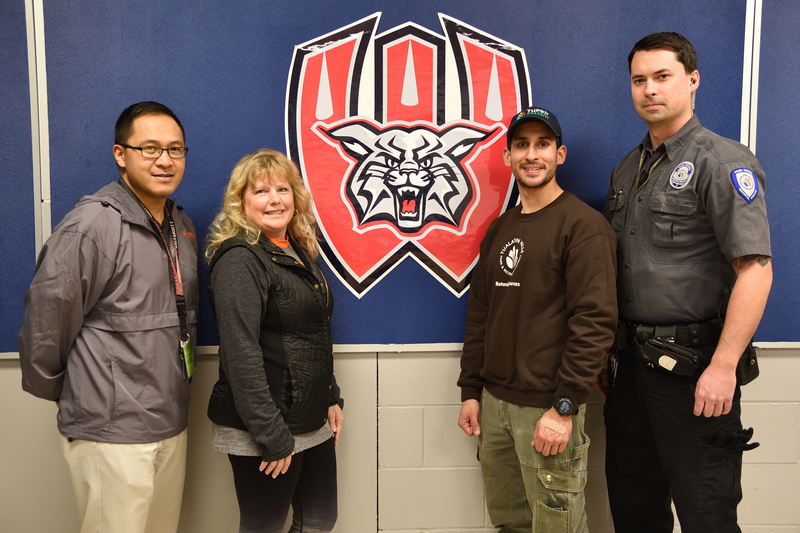 Westview officials thank THPRD staff for returning stolen iPads to the school. 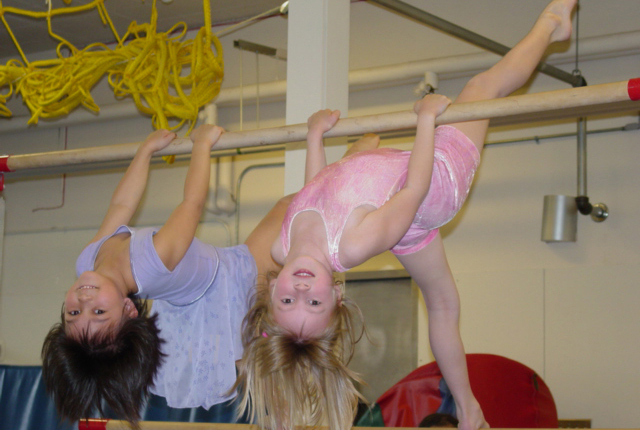 Hundreds of classes, spring break camps and lots of activites are available. 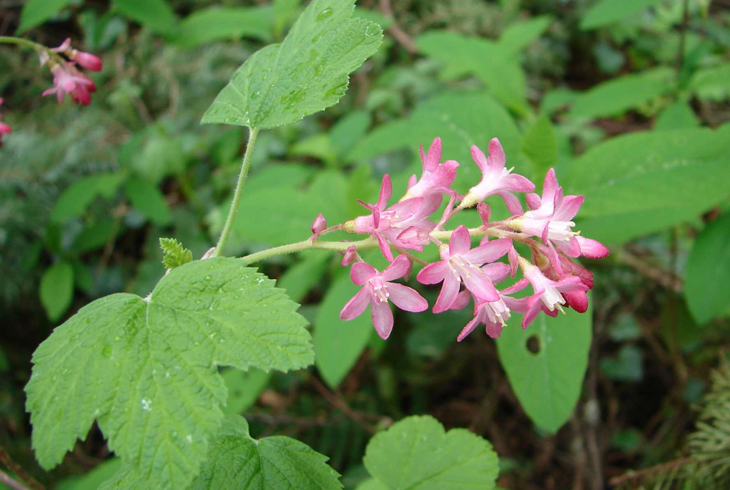 Get the dirt on native plants at The Tualatin Hills Nature Center's Spring Native Plant Sale on April 28. The current board will make a decision and announce the appointee at their regularly scheduled meeting on March 12. 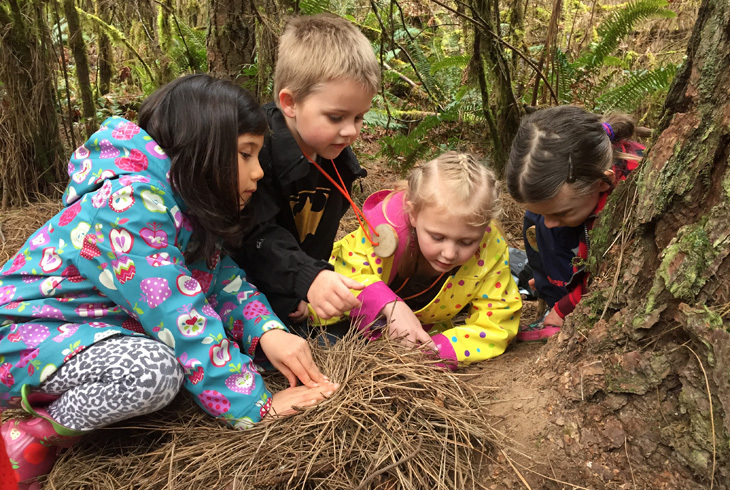 The Tualatin Hills Nature Center will host a Nature Kids Preschool Open House to preview its nature-based preschool programs on Jan. 27 from 10 am to noon. THPRD is now accepting applications for a vacant position on its five-member elected board of directors. The application deadline is Feb. 7. Board members plan to announce their appointee on March 12. 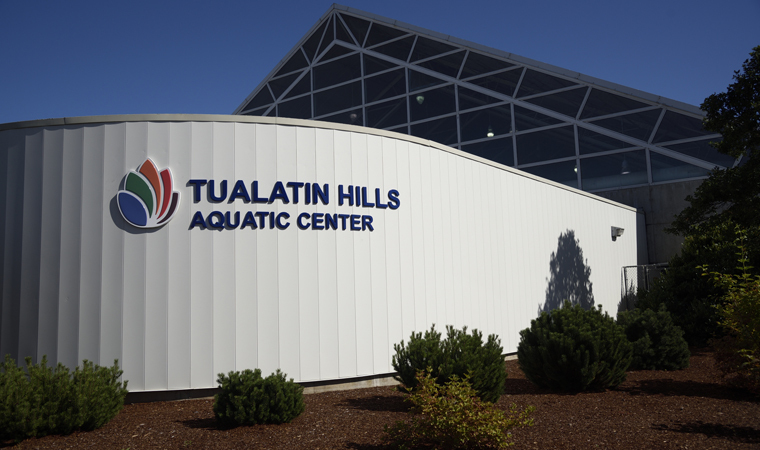 The Tualatin Hills Aquatic Center will reopen for regular programming on Jan. 16 following a major renovation that will provide multiple improvements for the public. 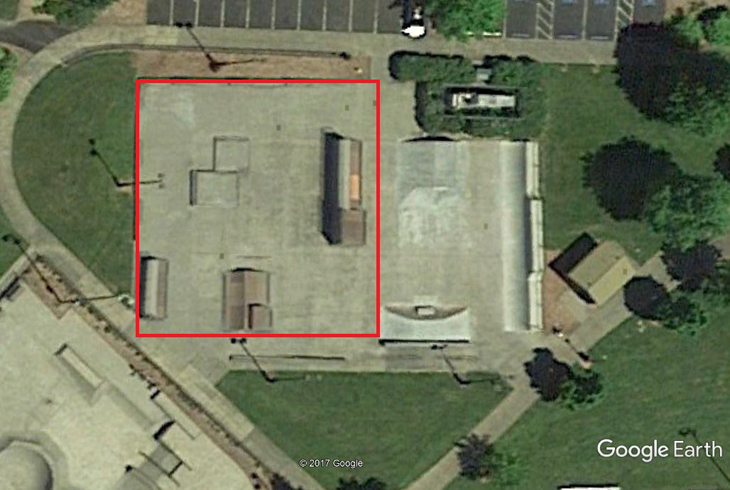 On January 8, 2018, THPRD will begin renovating the remaining wooden ramps at the Howard M. Terpenning Recreation Complex skate park. The project is scheduled to be completed by February 28th. Citizen Science – research conducted by non-professional scientists – is a practice that THPRD’s Natural Resources staff is successfully utilizing to keep track of regionally important animal species and pollinators. Volunteer opportunities are now available. 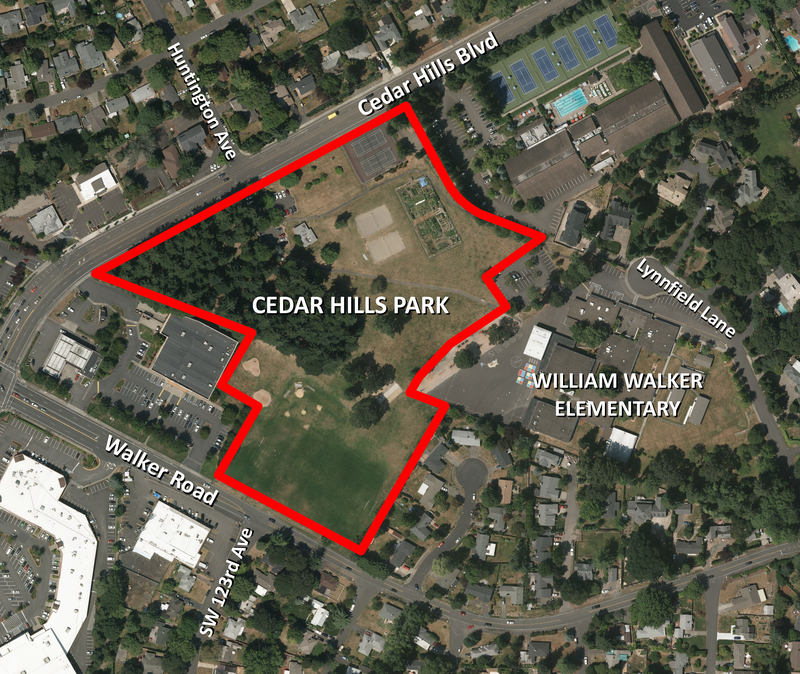 Como parte de un proyecto importante de construcción que llevará una variedad de mejorías al parque Cedar Hills, el parque estará cerrado a partir del 8 de enero de 2018, excepto por una vía peatonal de la escuela primaria William Walker (Lynnfield Lane) hasta el bulevar Cedar Hills. Jerry Jones Jr. has resigned from the THPRD Board of Directors. The board will invite applicants from within THPRD’s service boundaries to serve the remainder of his term, which ends June 30, 2021. Registration for THPRD's winter term will be open to district residents starting at 8 am on Saturday, Dec. 9. Out-of-district registration begins Monday, Dec. 11. Online registration will be available 24 hours a day at www.thprd.org. A project to repair a cracked sidewalk at Hazeldale Park unearthed a golden treasure that had been buried in the asphalt for 35 years. 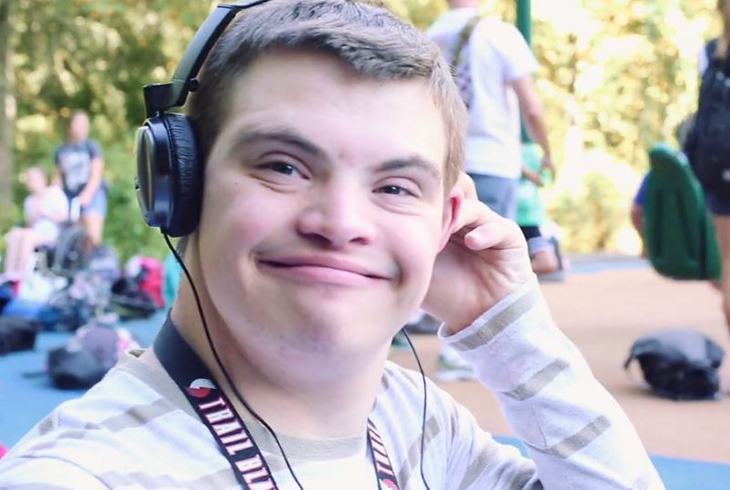 THPRD has been honored with the Edwards Center’s Employment Award for more than three decades of providing job opportunities to adults with developmental disabilities.The accolade was presented in Portland as part of the Edwards Center’s 11th annual awareness-building and fundraising luncheon. Newt Day is back! 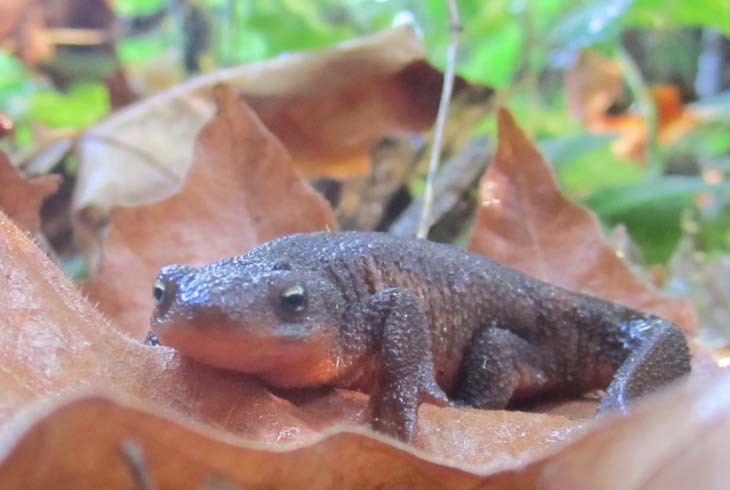 THPRD’s celebration of the rough-skinned amphibian returns on Saturday, Nov. 4, noon to 4 p.m. at the Tualatin Hills Nature Center (15655 SW Millikan Way, Beaverton). 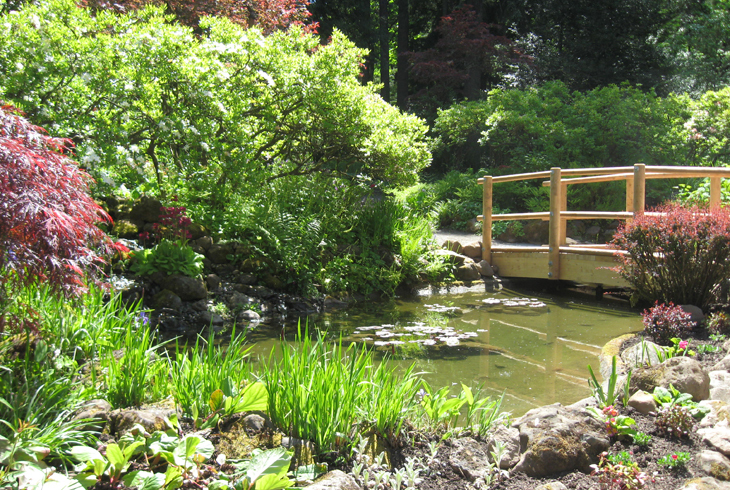 Visitors will learn about the amazing adaptations of newts and other forest inhabitants. 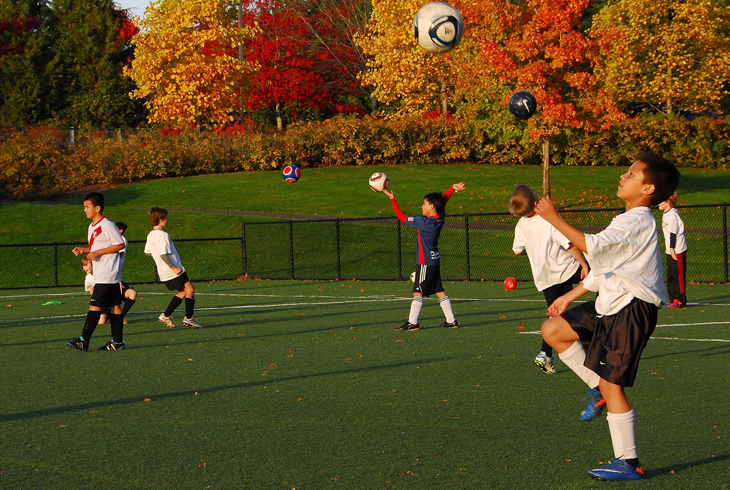 Fewer than 2% of park and recreation agencies nationally are CAPRA accredited. THPRD's successful accreditation is a big deal, says Jerry Jones, president of the district's Board of Directors. 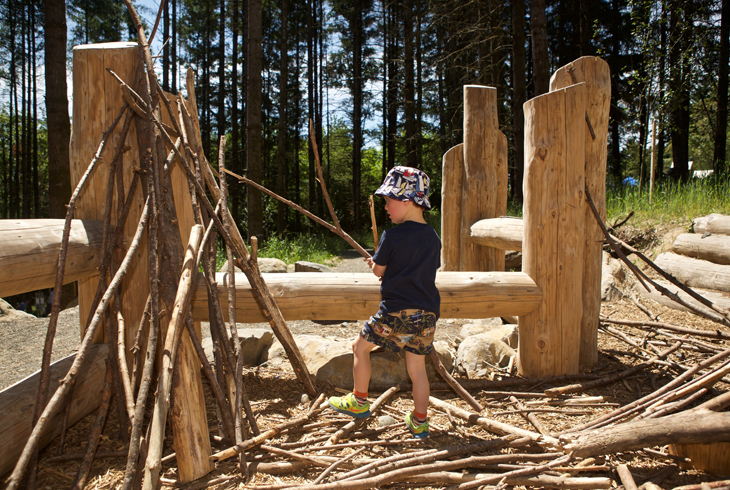 THPRD has successfully become just the fourth Oregon agency -- and one of just 155 nationwide -- to earn accreditation from the Commission for Accreditation of Park and Recreation Agencies (CAPRA). 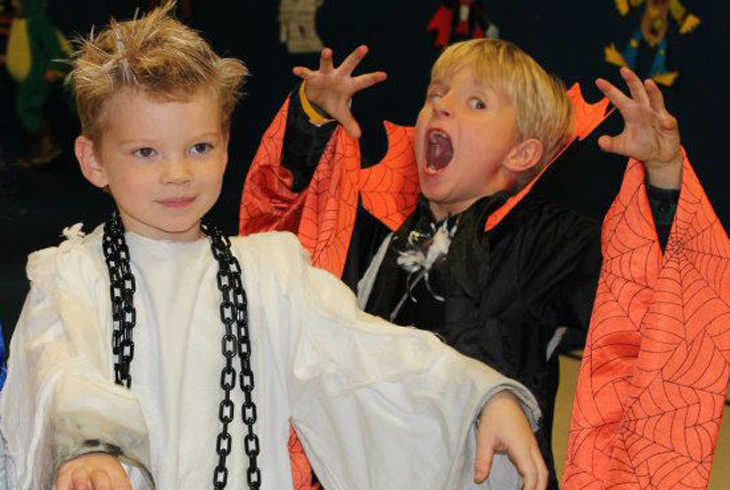 Families wishing to get an early start on their Halloween celebration may want to stop by THPRD's annual Fall Festival. 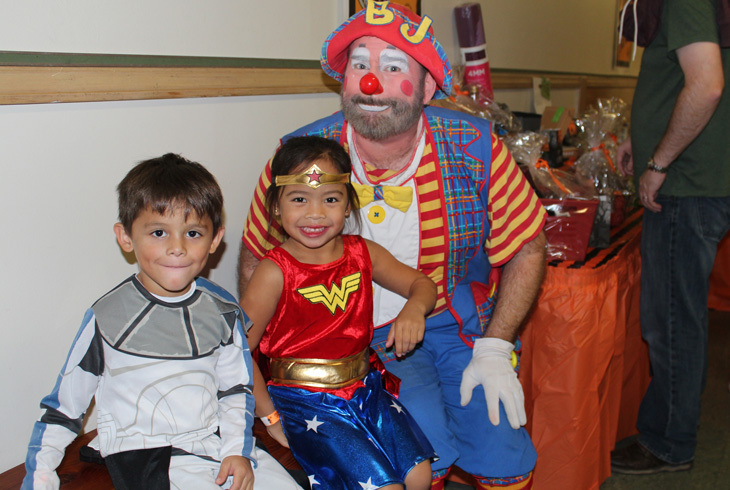 This costume-friendly event will be held at Cedar Hills Recreation Center on Saturday, Oct. 21, from 11 am to 3 pm. 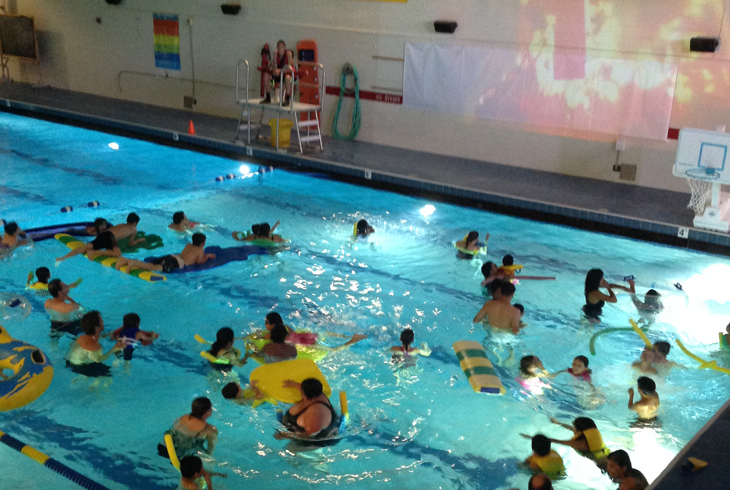 The Aloha Swim Center is the site of THPRD's next Dive-In Movie on Saturday, Oct. 7, at 5:30 pm. 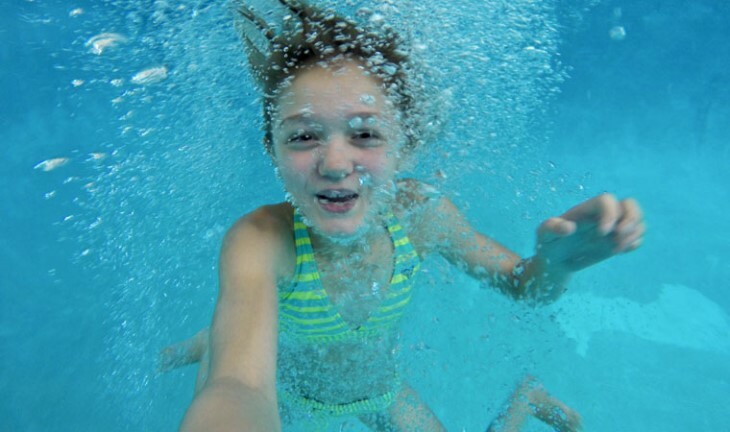 Dive-In Movies combine two great pastimes – swimming and a trip to the movies – all for the cost of a drop-in swim. 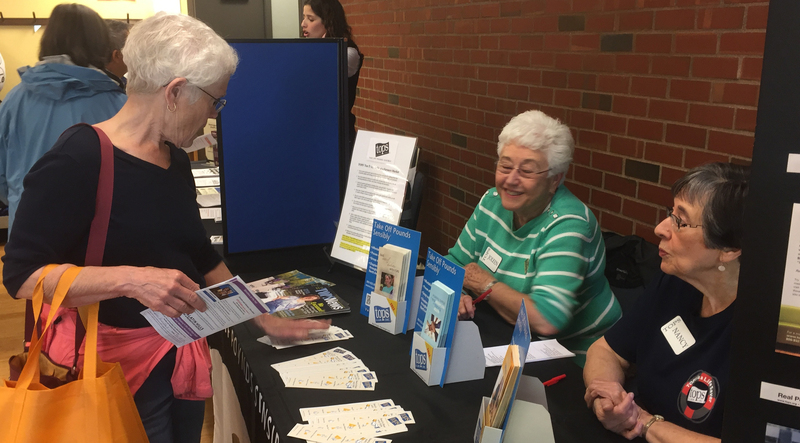 On Saturday, Oct. 7, the Elsie Stuhr Center will host a free Health and Wellness Resource Fair to provide activities and information that address health topics relevant to Beaverton’s aging adult population. 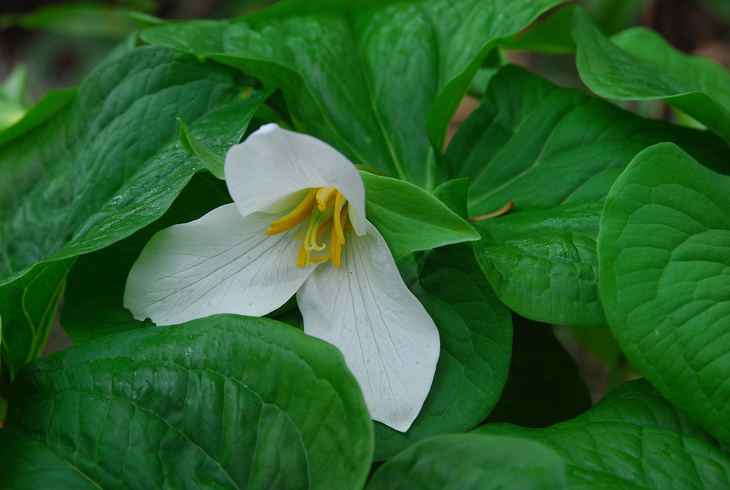 Get ready for fall and planting season with THPRD’s 17th annual Fall Native Plant Sale. 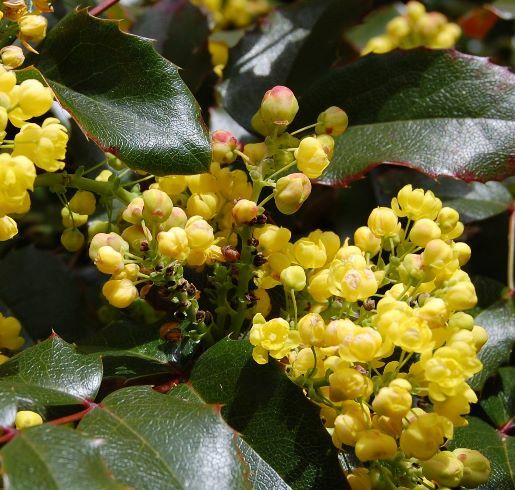 A wide variety of shrubs, ground covers, perennials and trees will be available for purchase at the Tualatin Hills Nature Center, 15655 SW Millikan Way, Beaverton, on Saturday, Oct. 7, from 10 am to 2 pm. 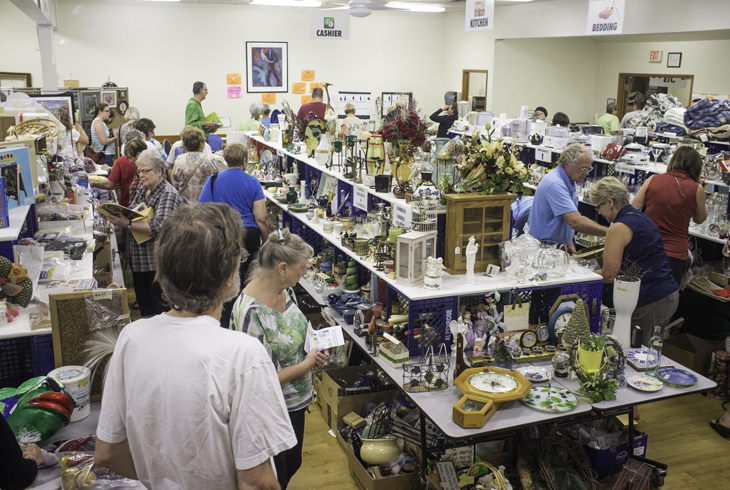 Shoppers of all ages will delight in the broad array of treasures, collectibles, antiques, clothing, furniture and home goods available at the Elsie Stuhr Center’s annual Harvest Bazaar on Sept. 7 and 8. 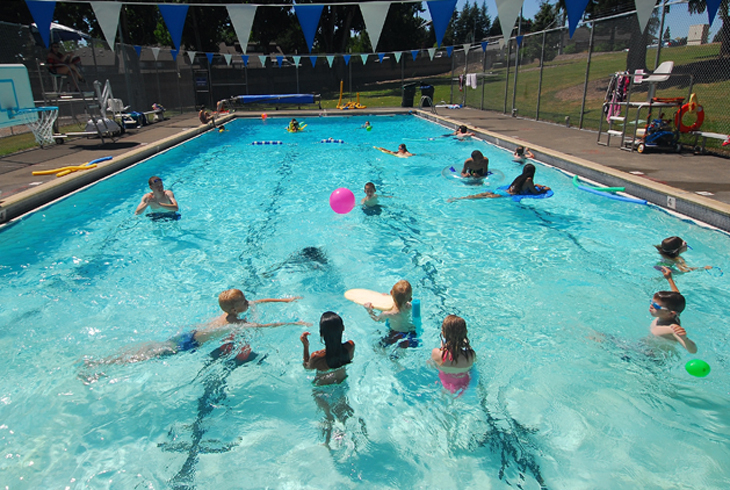 Before the Tualatin Hills Aquatic Center closes for its second phase of scheduled renovations, the pool will host just the third installment ever of THPRD’s popular Doggie Paddle. 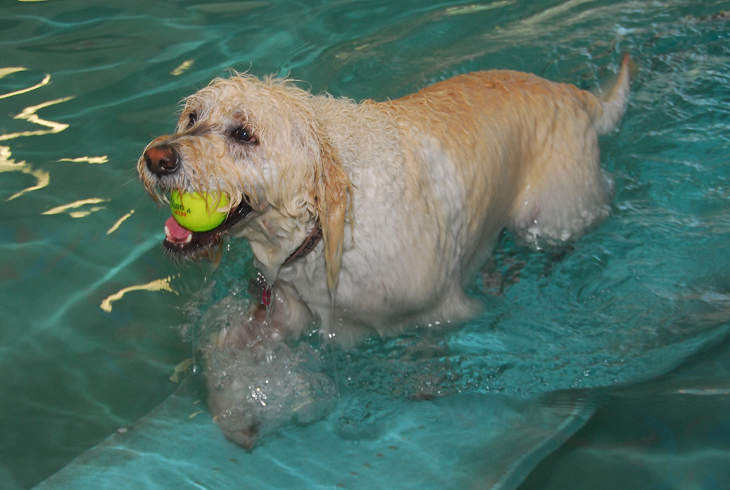 The canine-only open swim will be held on Sunday, Aug. 20, 4-6 pm. 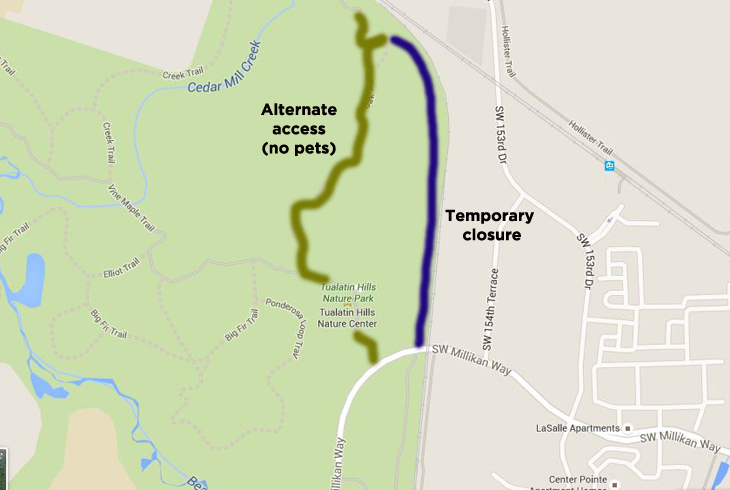 Construction on SW 175th Ave. will restrict access to Winkelman Park, July 5-Aug. 25. 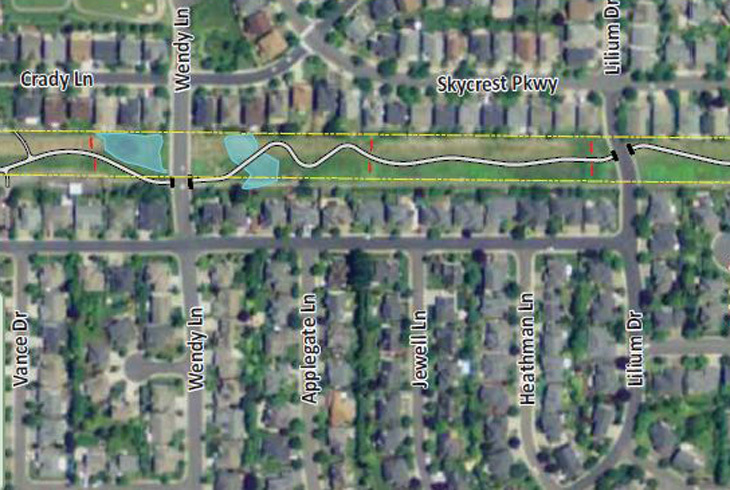 The road will be open to neighborhood residents and Winkelman Park users, but traffic delays may be lengthy. Registration for THPRD's fall classes, programs and activities will be open to in-district residents starting Saturday morning, Aug. 19, at 8 am. 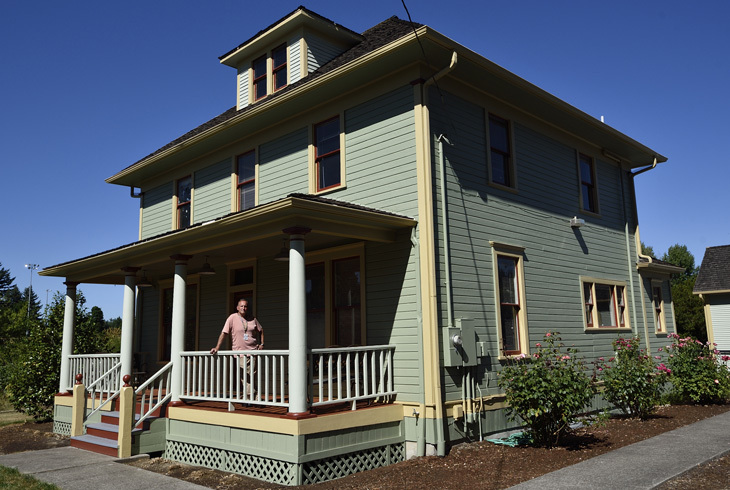 With THPRD’s historic Schlottmann House on SW 158th Ave. in need of a fresh coat of paint, the district turned to its resident history buff, who happens to have an office in the building. 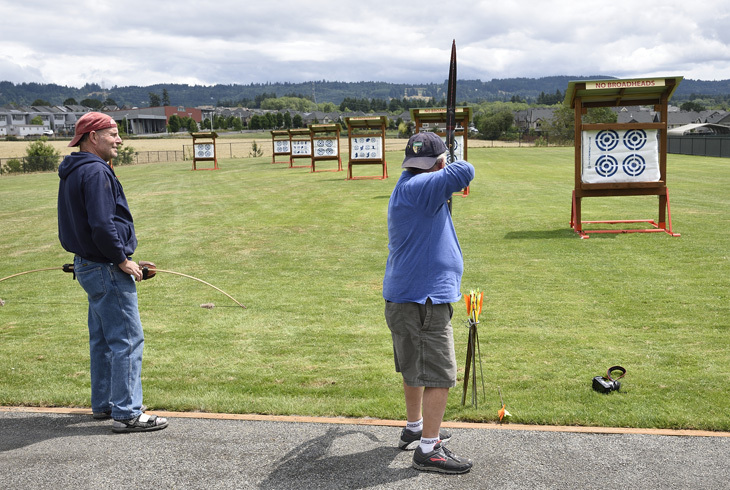 THPRD is hoping to hit a bullseye with archery enthusiasts. 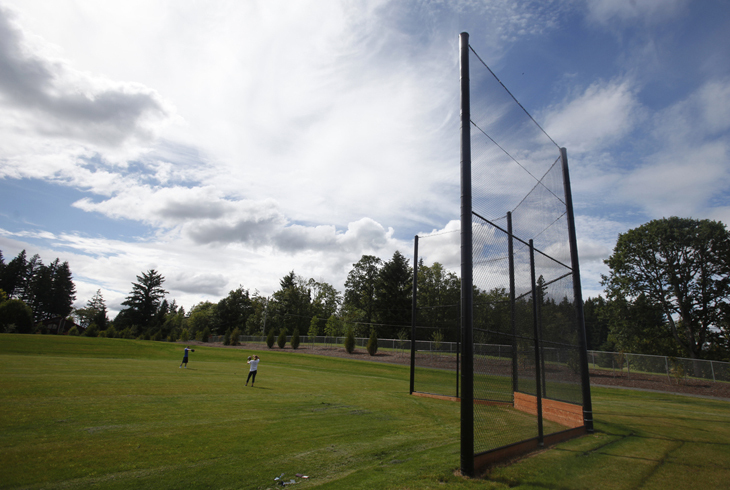 A new range at the PCC Rock Creek Campus is now open daily, from dawn to dusk. There is no cost to use the site, which includes targets set at lengths ranging from 10 to 60 yards. 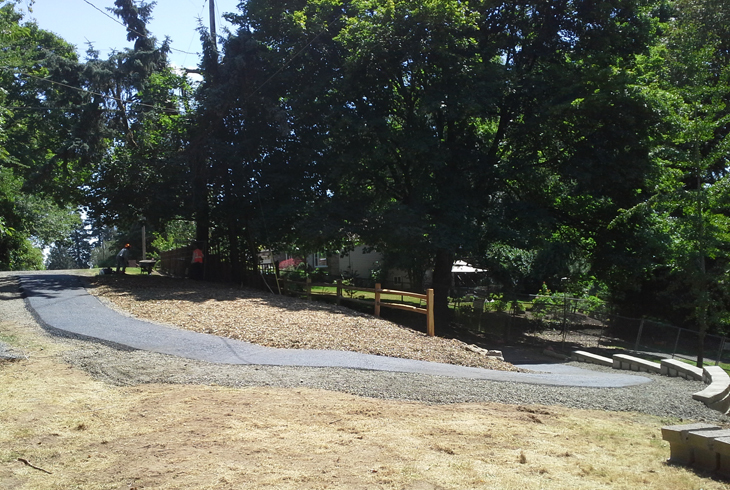 Fanno Creek Trail users in the Garden Home neighborhood will notice a recent change in the landscape. 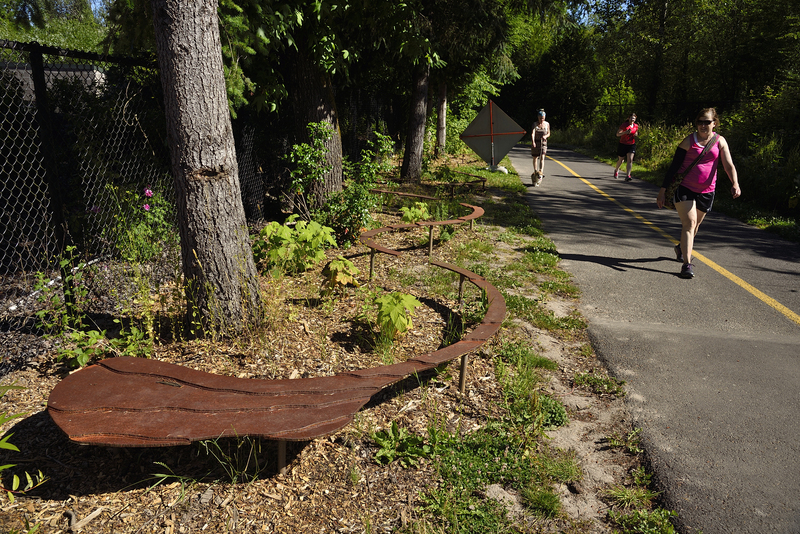 Several weathered steel sculptures were installed, just above the ground, along a 120-foot section of the trail near SW 86th Avenue. 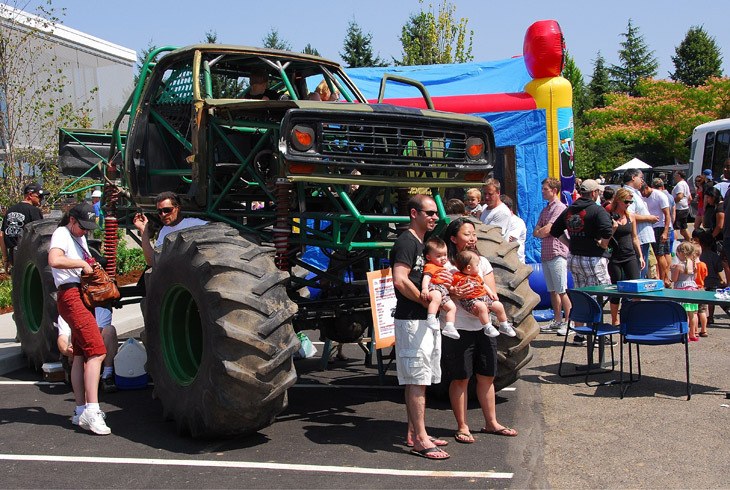 Big Truck Day, one of THPRD's most popular annual events, returns to Conestoga Recreation & Aquatic Center on Saturday, Aug. 5, 10 am-2 pm. THPRD's Party in the Park returns on Saturday, July 29, from 11am-4pm. 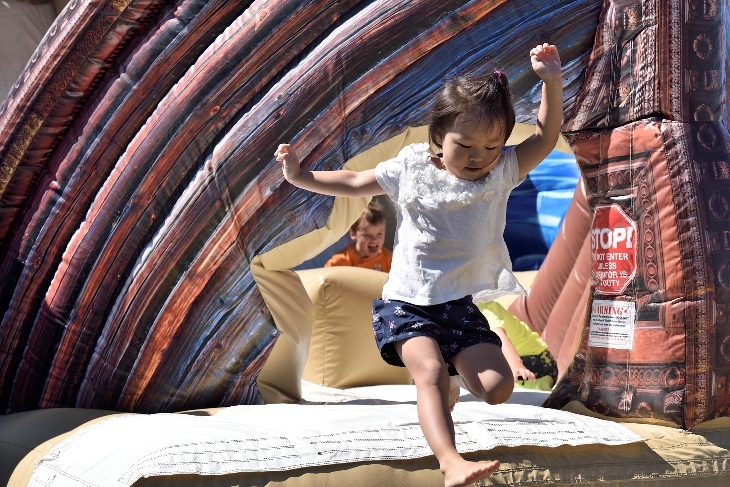 The event will feature an array of activities, including bounce houses, climbing walls, drop-in sports and more. THPRD is now accepting applications to fill two citizen positions on its Budget Committee. The deadline is Thursday, July 27. 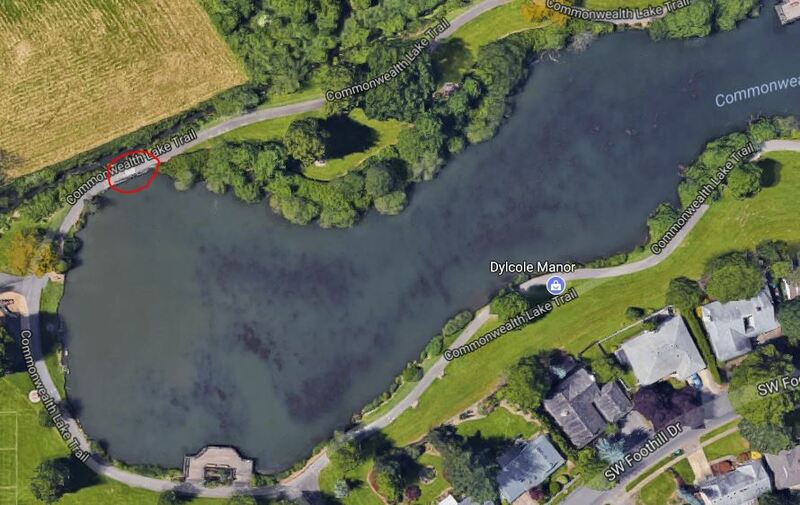 Maintenance on the west end bridge at Commonwealth Lake Park will occur July 17-28. During the project, the park and the loop trail remain open, but the bridge will be closed; visitors will be unable to walk the loop. 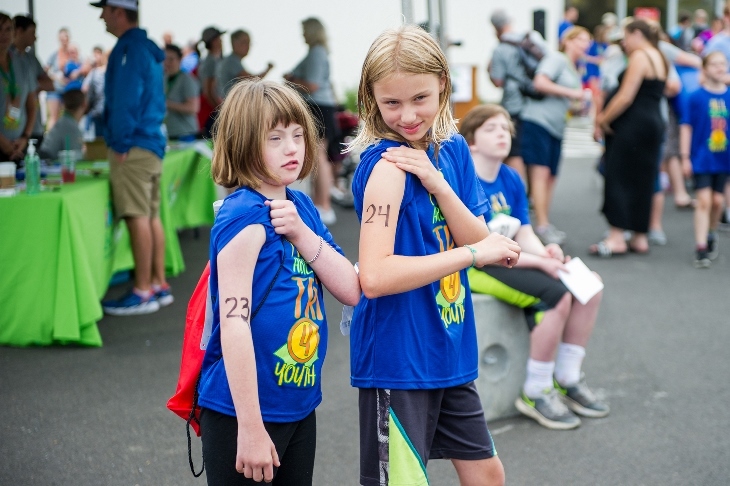 This summer, THPRD is hosting an inclusive new triathlon for Oregon youth. 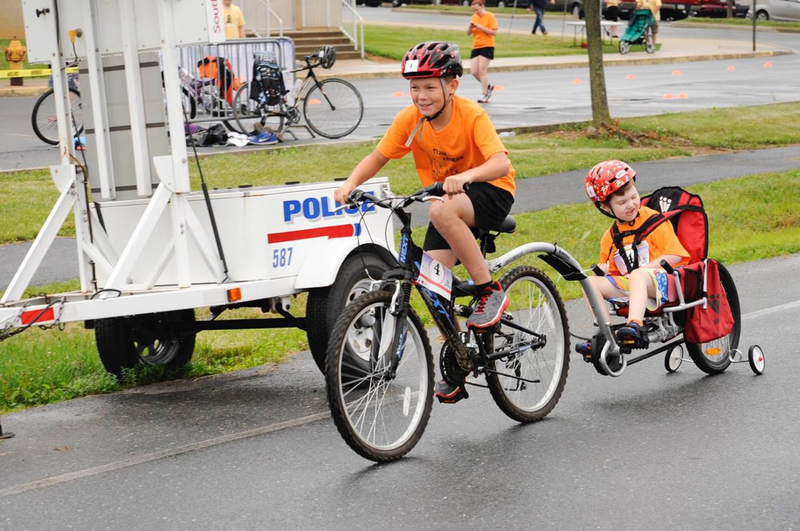 Competitors will swim (50 yards), bike (two miles), and run (half-mile) on a fully accessible course. 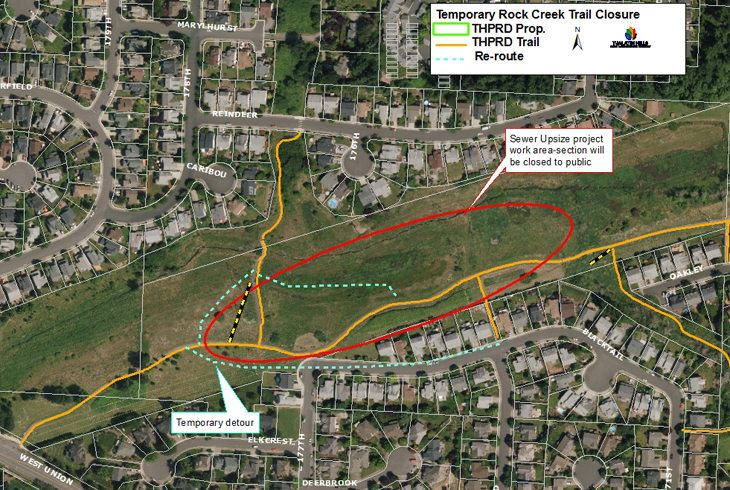 On July 7, THPRD will close a portion of the Fanno Creek Trail to allow PGE to remove a dead poplar tree. 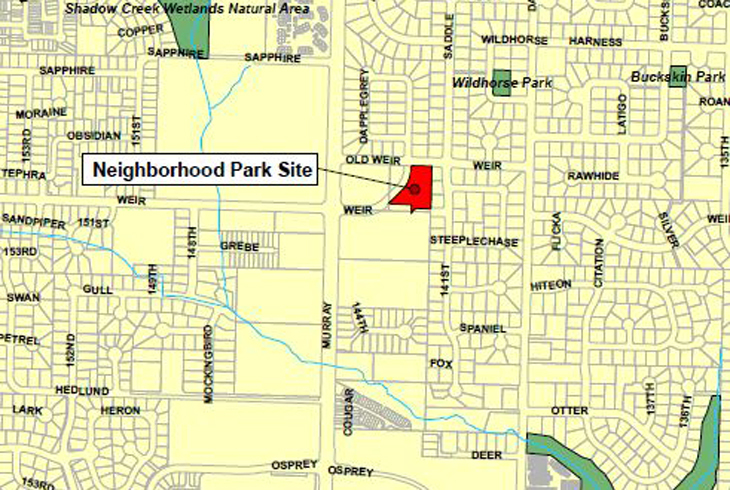 The path will be closed between Garden Home Recreation Center and SW 76th Ave. from about 8 am to 1 pm. Looking for free summer fun? For the 13th consecutive summer, THPRD will stage free concerts at neighborhood parks across its 50-square-mile service area. The first of four shows is Thursday, July 6, at Bethany's Pirate Park. 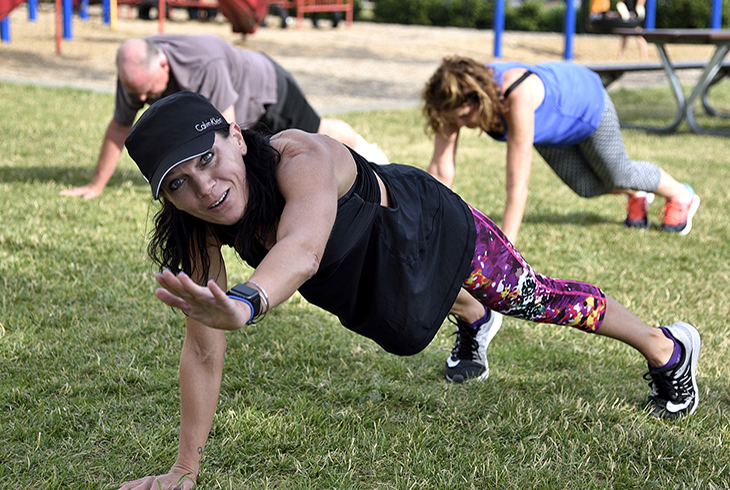 A new program is bringing free group fitness classes and guided group walks to THPRD parks and trails this summer. 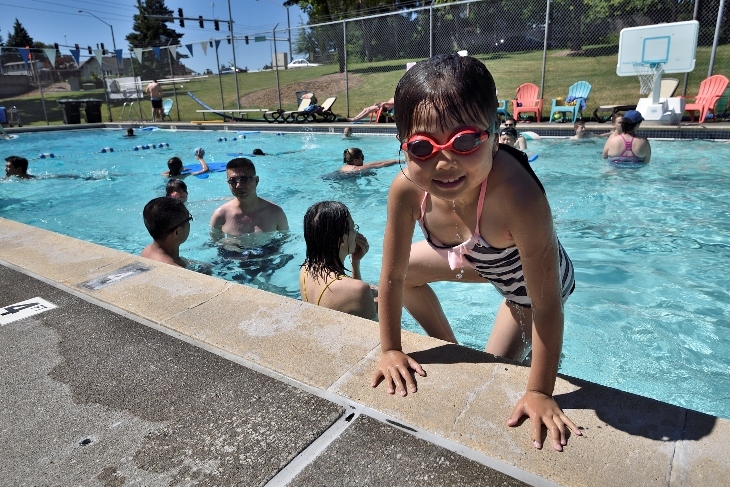 THPRD's two outdoor pools are set to open on June 24. 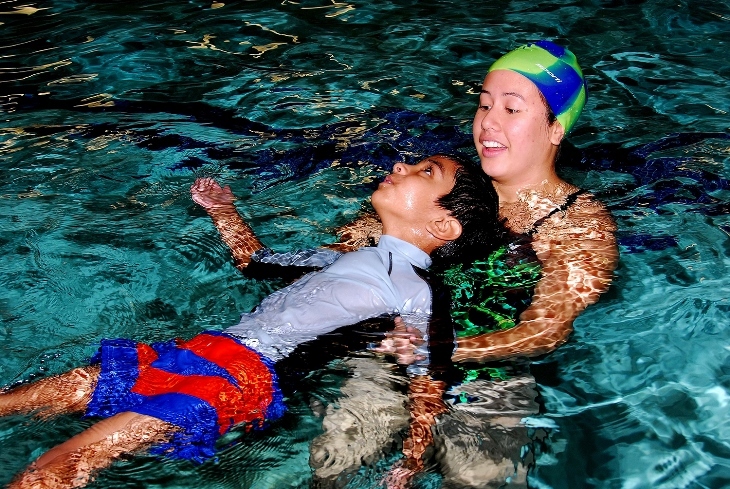 Somerset West Swim Center and Raleigh Swim Center will host children’s lessons, adult classes, lap swimming, and open swim. 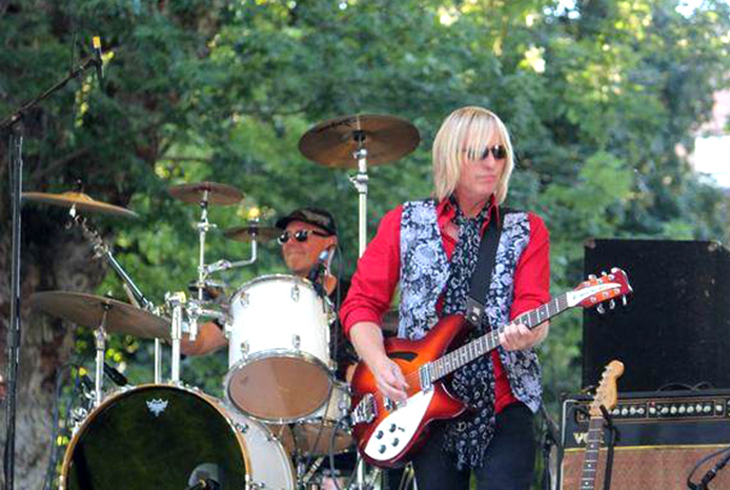 THPRD’s seventh annual Groovin' on the Grass show returns to Beaverton on Saturday, Aug. 19. 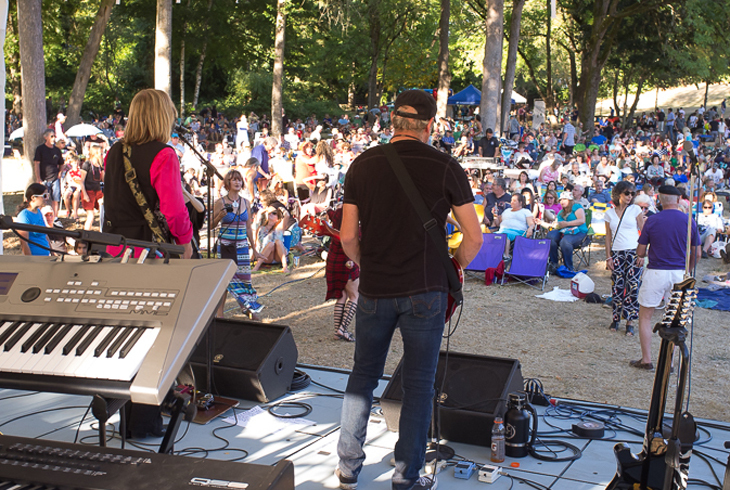 This outdoor concert event features a trio of iconic Northwest acts -- Quarterflash, The Curtis Salgado Band and Nu Shooz -- sharing the stage for the first time. Gates will open at 4 pm for the 5 pm show. 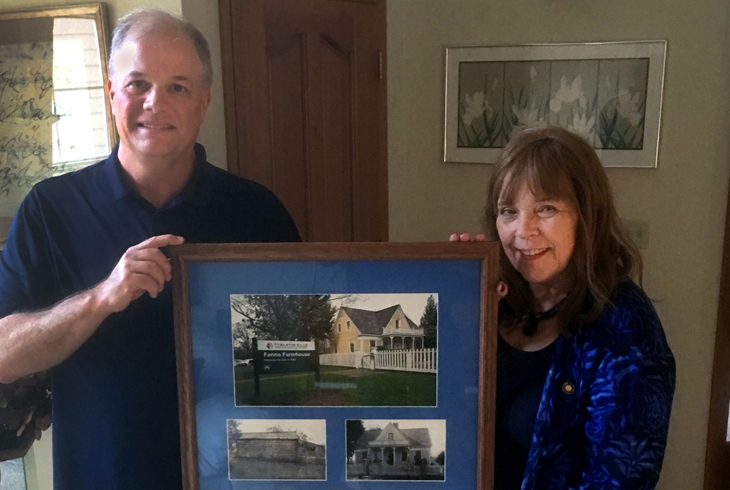 John Griffiths of THPRD's Board of Directors recently presented Oregon State Representative Sheri Malstrom with a framed photo montage of Washington County’s first registered home, THPRD's historic Fanno Farmhouse. 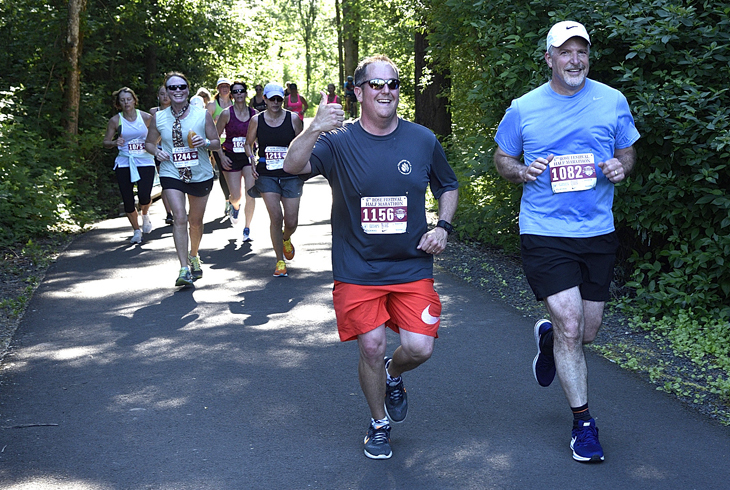 Congratulations to the City of Beaverton for its part in helping the Rose Festival complete the first-ever Rose Festival Half Marathon in Beaverton on Sunday, May 28. You may have experienced trouble mowing your own lawn. 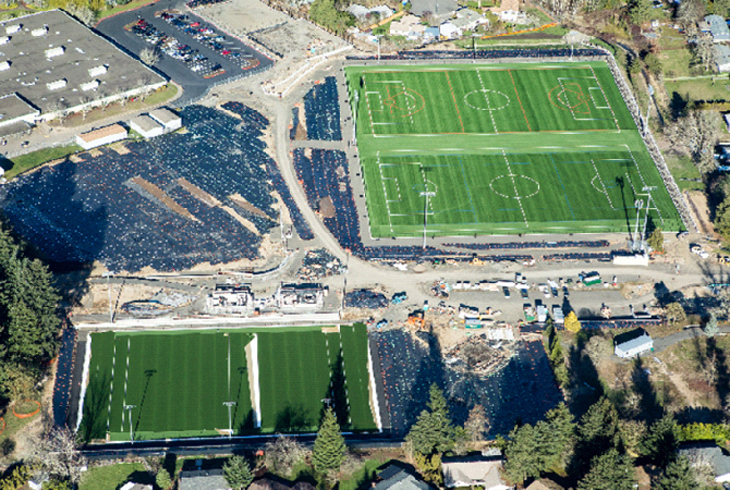 If so, you can probably better understand the challenge THPRD has faced with dozens of sports fields across the district’s 50-square-mile area. A Washington County construction project on and around SW 175th Ave. is now underway. 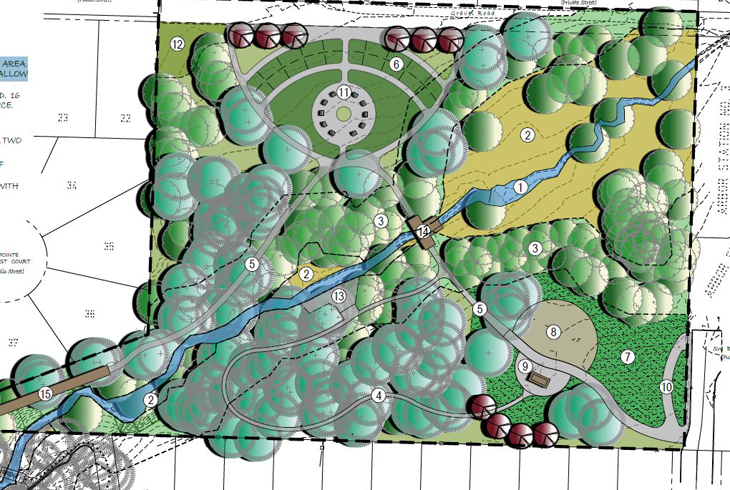 This project will include moving the Winkelman Park entrance to the North end of the park. Access to the park will be challenging, but the park will remain open. 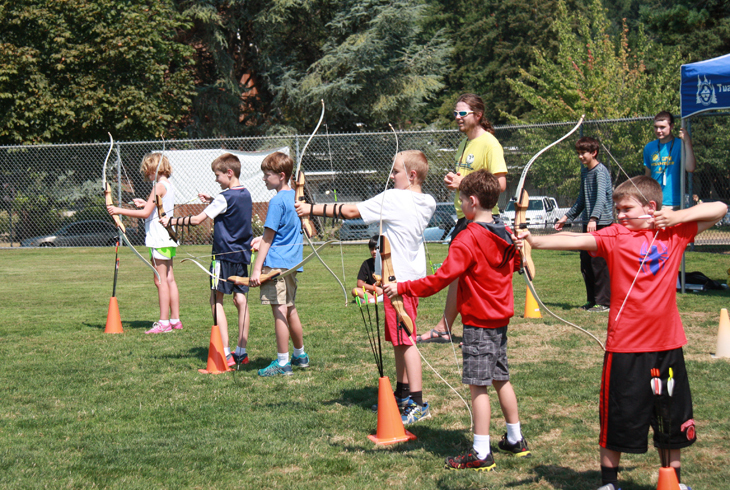 THPRD is excited to announce a partnership with the Oregon Department of Fish & Wildlife to build an archery range at the north end of the PCC-Rock Creek Sports Complex. The range will open this summer. 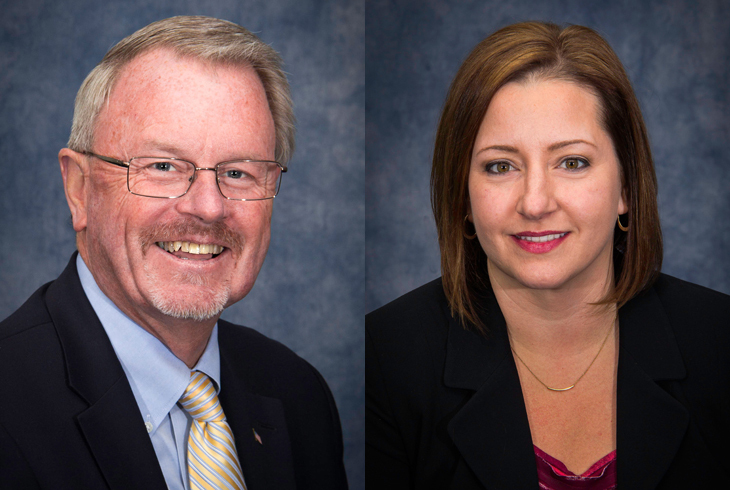 THPRD's Board of Directors will have two new members starting July 1. 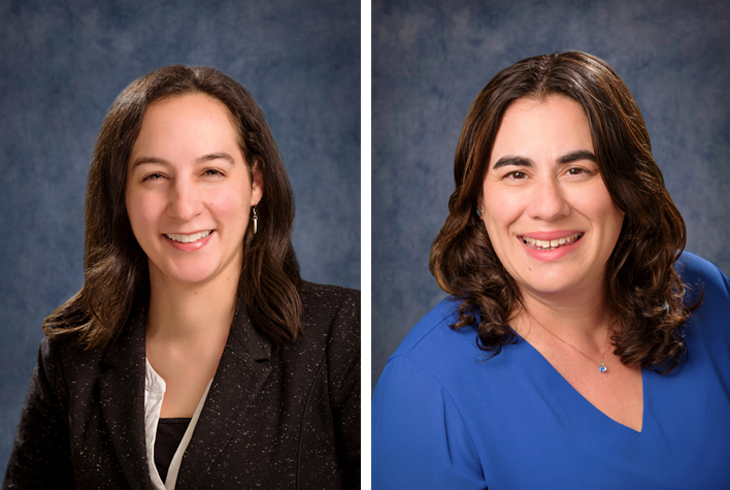 On May 16, voters in the district elected Felicita Monteblanco and Holly Thompson to the board; Jerry Jones was re-elected. For the second consecutive year, THPRD is a finalist for the prestigious National Gold Medal Award for industry excellence. The district is one of four Class II finalists nationwide. Effective June 1, THPRD will no longer accept credit card payments over the phone. Patrons will still be able to register for classes and activities over the phone, but payments will have to be made through the online registration system or in person at a THPRD site within two days. 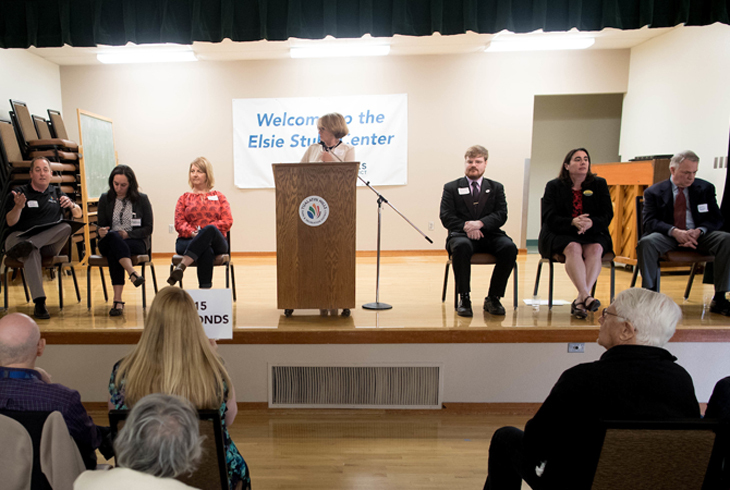 Six candidates for three open positions on the THPRD Board of Directors participated in a public forum at the Elsie Stuhr Center. The candidates summarized why they are running and the priorities they would pursue if elected. Online and phone registration for THPRD's summer classes, camps and other activities will be open to in-district residents starting this Saturday, April 22, from 8 am to 6 pm. 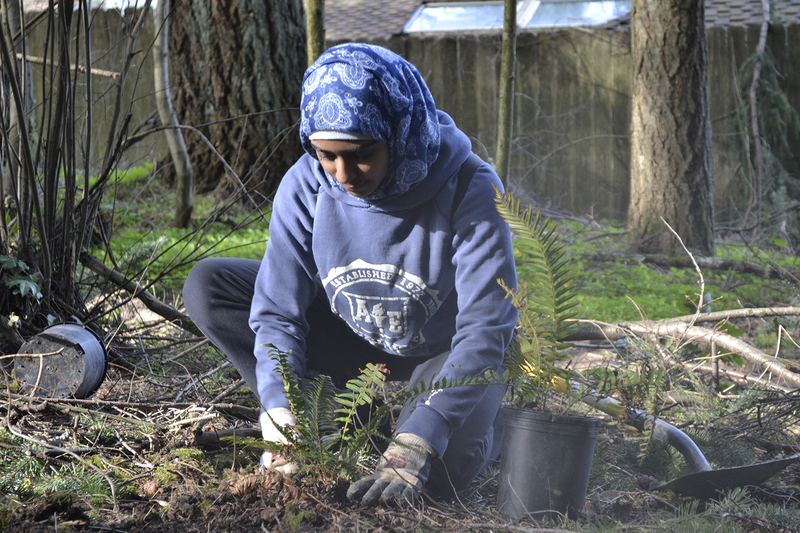 THPRD hosts its annual Spring Native Plant Sale on Saturday, April 29, at the Tualatin Hills Nature Center from 10 am to 2 pm. 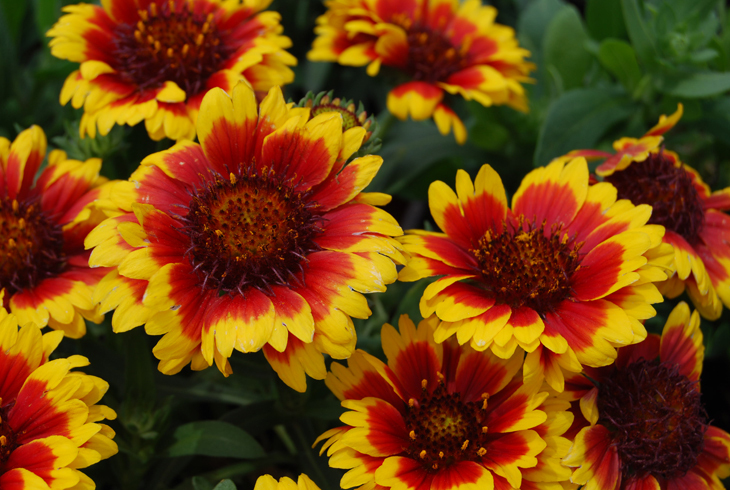 This year, the sale will highlight plants that attract native pollinators such as birds, bees, and butterflies. Blue skies and sunny days are just around the corner! 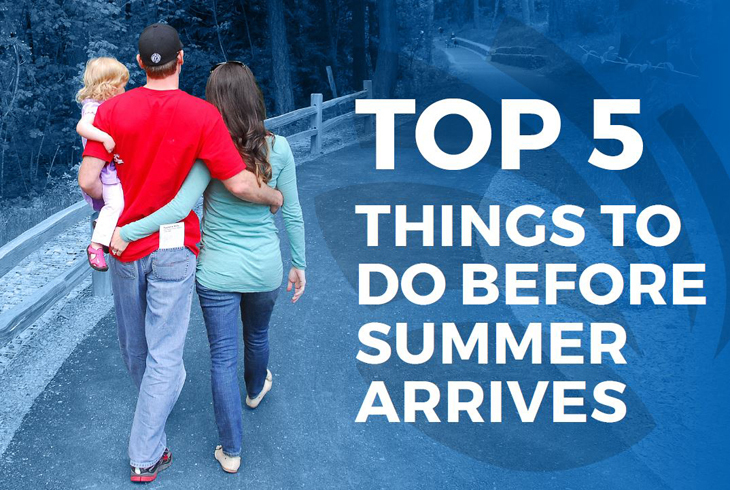 THPRD has a five tips to help get you ready to enjoy the warmer weather that’s headed our way. 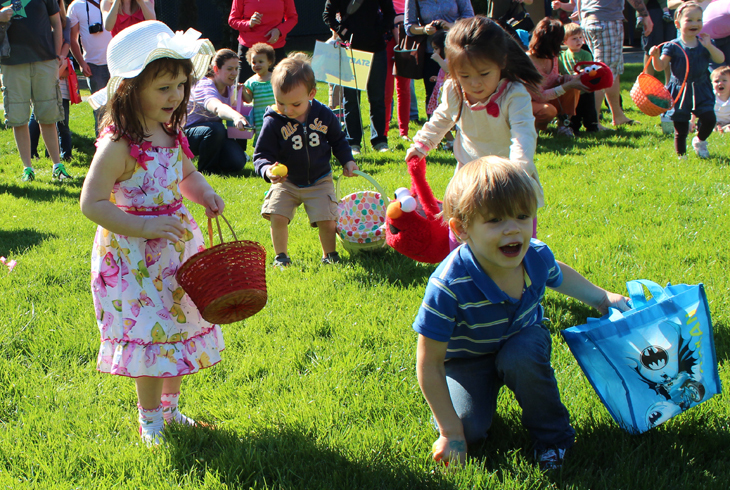 What sort of spring egg hunt excites you? The traditional kind? One that’s paired with a pancake breakfast and artisan bazaar? Or one that invites the kids to go into the water? THPRD has them all in April. The public is invited to a forum on April 29 at Elsie Stuhr Center featuring all candidates for open positions on the THPRD Board of Directors. The election is May 16. 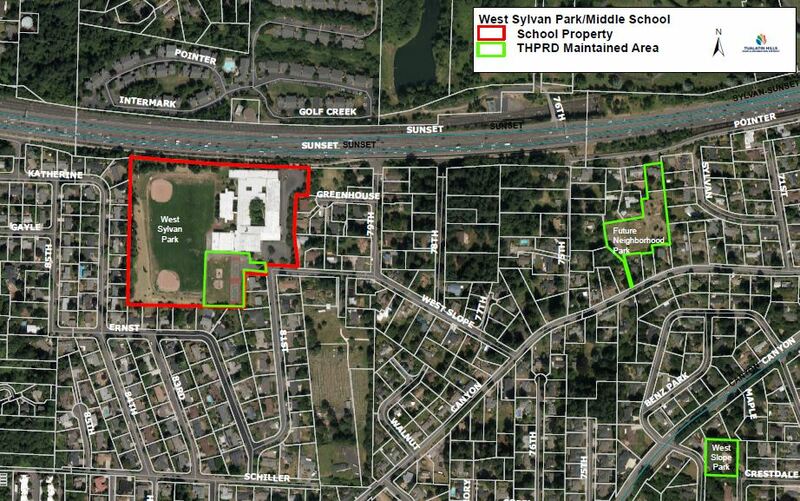 THPRD is seeking public feedback from visitors to West Sylvan Park, a site owned by Portland Public Schools and maintained by THPRD. Inform our plan by taking a brief survey. 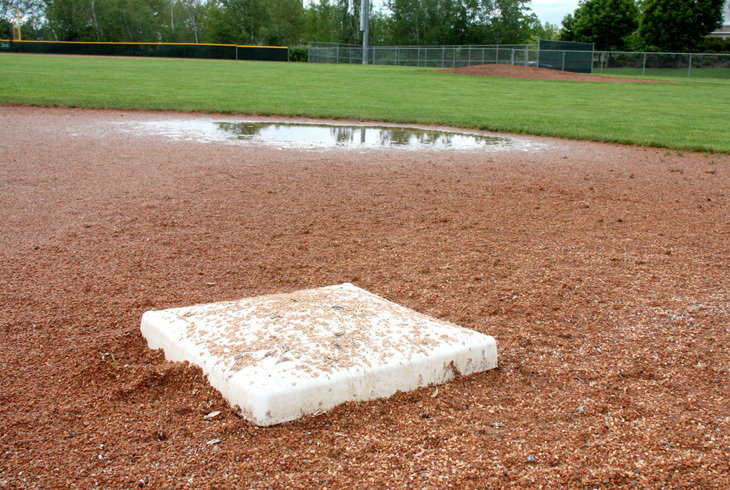 Due to continued wet weather, all grass fields will remain closed through April 2. Beginning on Monday, April 3, staff will assess each site individually to determine playability. 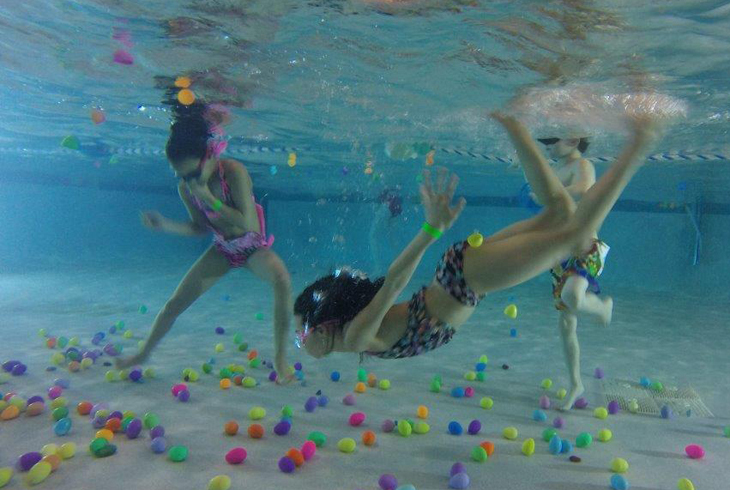 Conestoga Recreation & Aquatic Center will celebrate spring with its annual Underwater Egg Hunt, an unusually fun (and wet!) 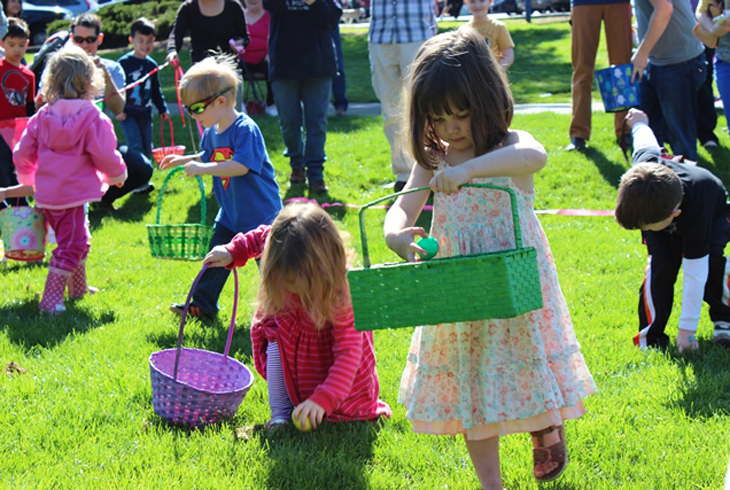 twist on spring egg hunts, on Friday, April 7, from 5:25 to 8:30 pm. 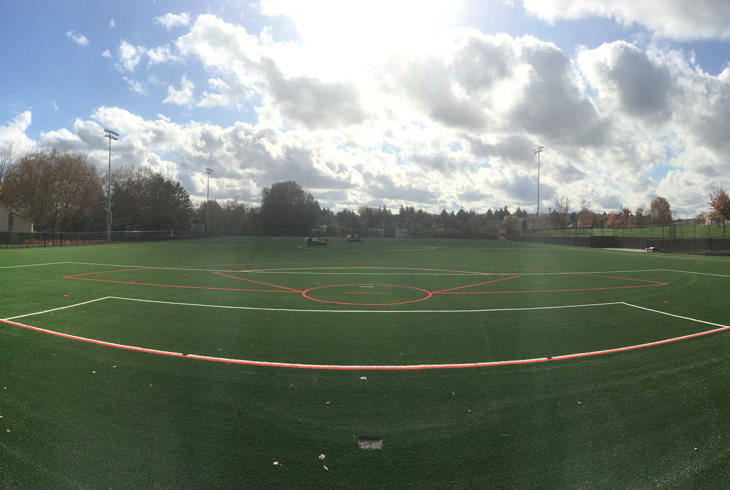 Crews are doing everything they can to get saturated, unplayable grass fields ready for the upcoming season; all grass fields remain closed through Sunday, March 26. If you have opinions about THPRD, we want to hear them. 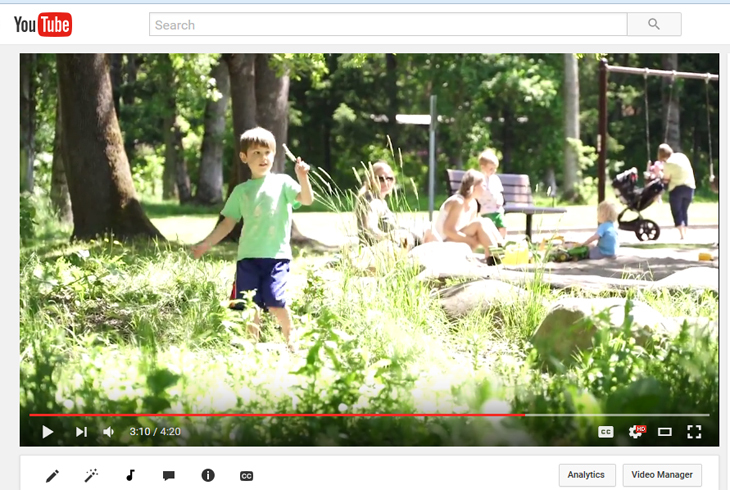 Take a brief survey designed to gauge public satisfaction with our services and help us determine how we can better serve our community. Online and phone registration for THPRD's spring classes, activities and events will be open to in-district residents starting Saturday, March 4, at 8 am. 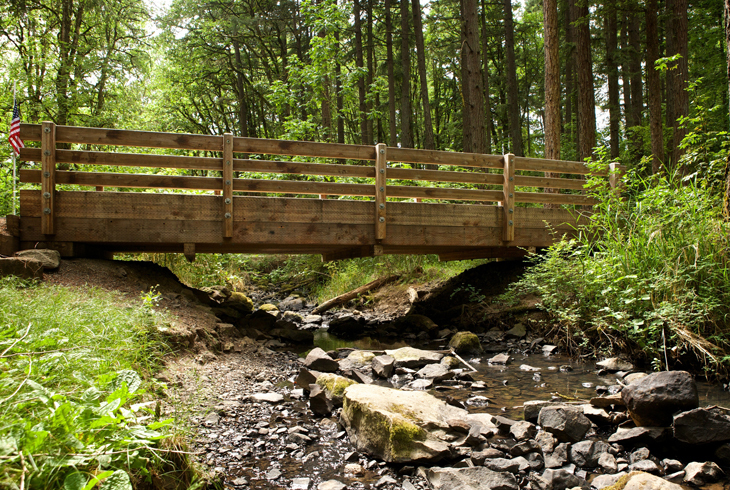 Upcoming scheduled maintenance at Willow Creek Boardwalk may force temporary closures or restricted access during mid-February. THPRD is testing a new deck surface, and will replace the existing decking in four test areas. 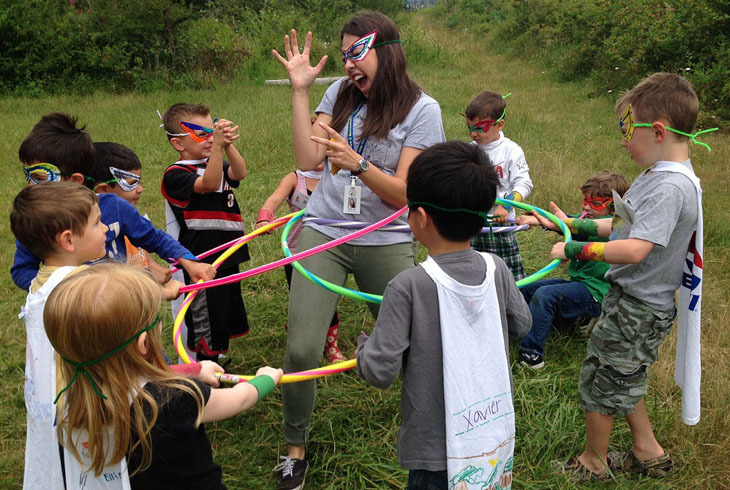 Following a global trend, the Tualatin Hills Park & Recreation District’s Natural Resources Department is offering more one-time, short-term volunteer opportunities. 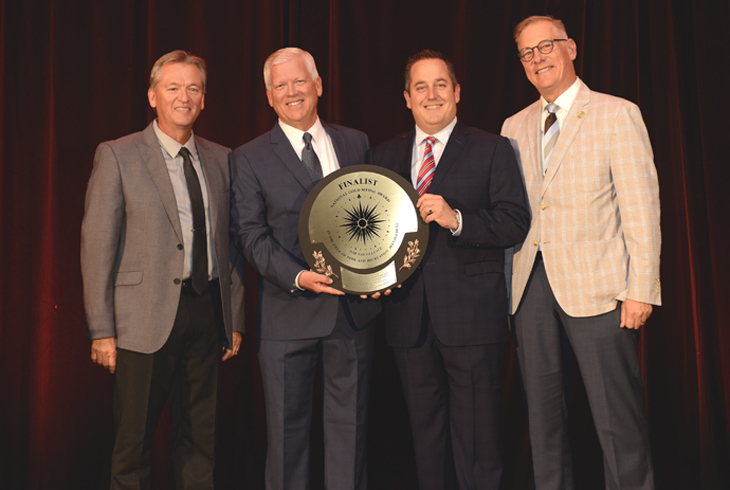 THPRD has been honored for the quality of its budgeting process for the 13th consecutive year, once again receiving the Distinguished Budget Presentation Award from the Government Finance Officers Association of the United States and Canada (GFOA). 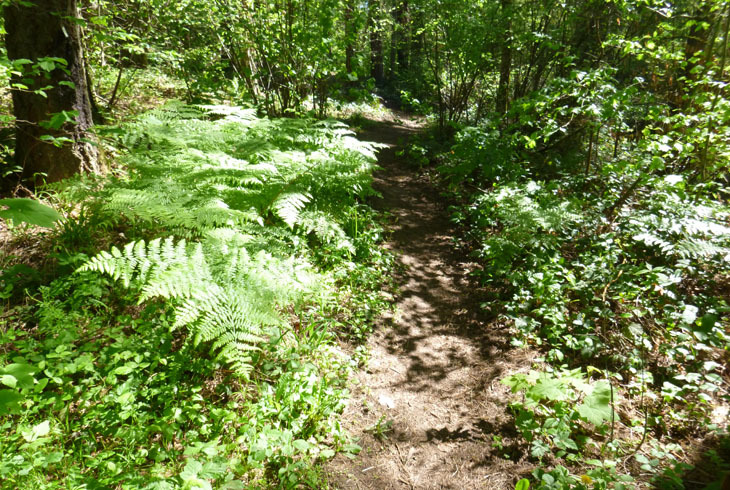 The Metro Council has approved a $3.7 million federal grant to THPRD for construction of a new, 1.5-mile trail that will connect Hocken Avenue in Beaverton to the Westside Trail at the Tualatin Hills Nature Park. 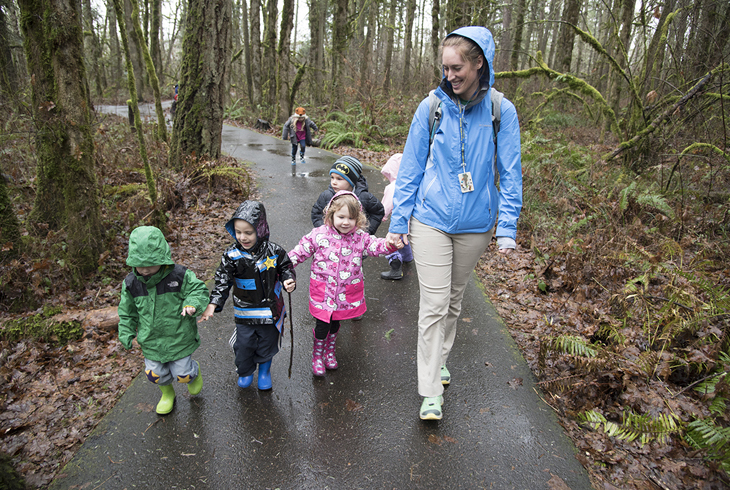 The Tualatin Hills Nature Center (15655 SW Millikan Way, Beaverton) will host an open house to preview the park district’s only nature-based preschool program on Saturday, Feb. 4, from 10 am to noon. 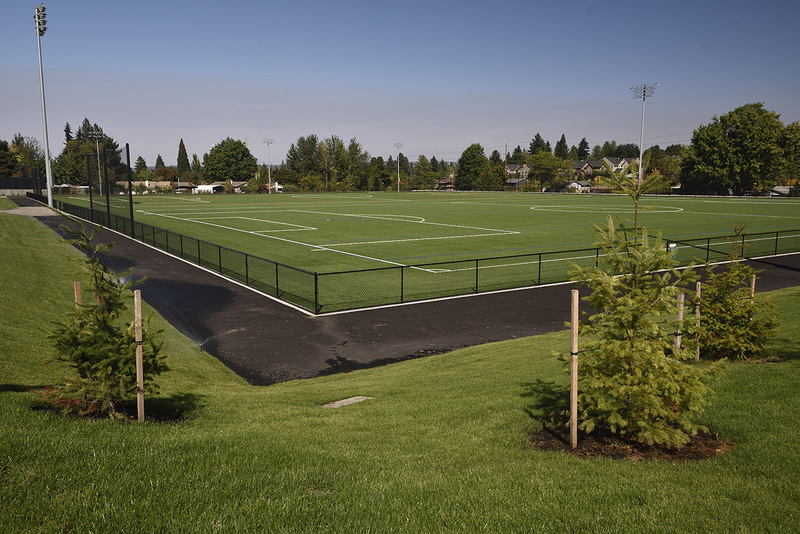 Beginning on January 9, soccer field 2 at THPRD's HMT Recreation Complex will be closed for the scheduled replacement of the field's synthetic turf. For the safety of park visitors, crews will fell two deteriorating fir trees at Lowami Hart Woods Natural Area on Tuesday, Dec. 27. 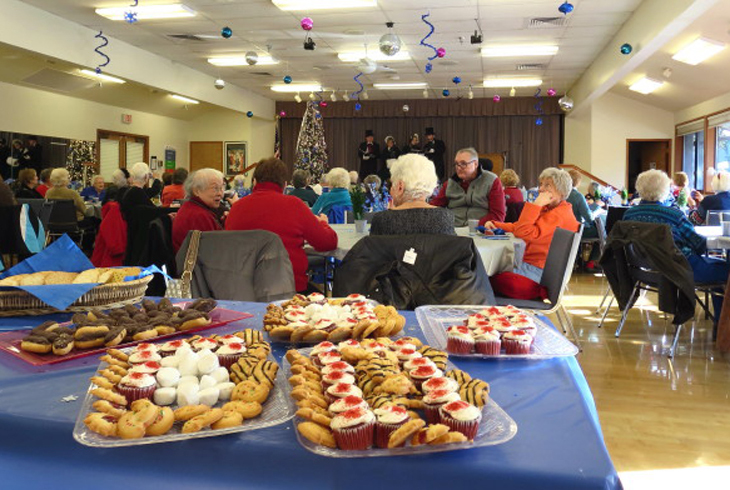 Guests 55 and older are invited to Elsie Stuhr Day, a holiday party that honors the countless contributions of the district’s most celebrated founder. 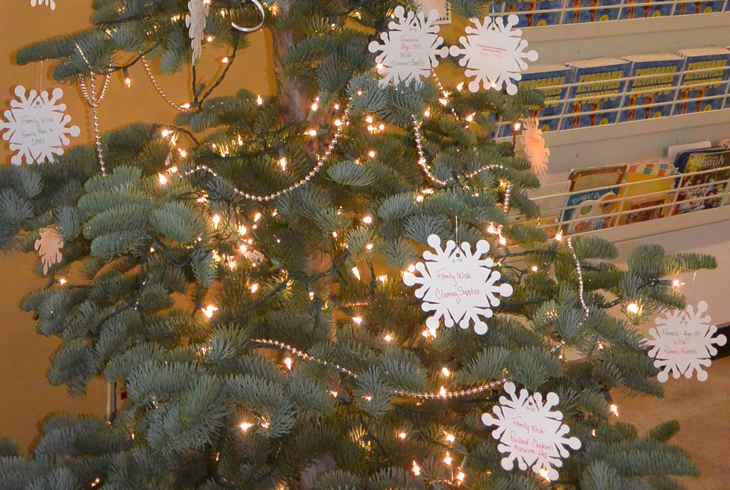 The annual event will take place on Dec. 16, 1:30-3:30 pm. 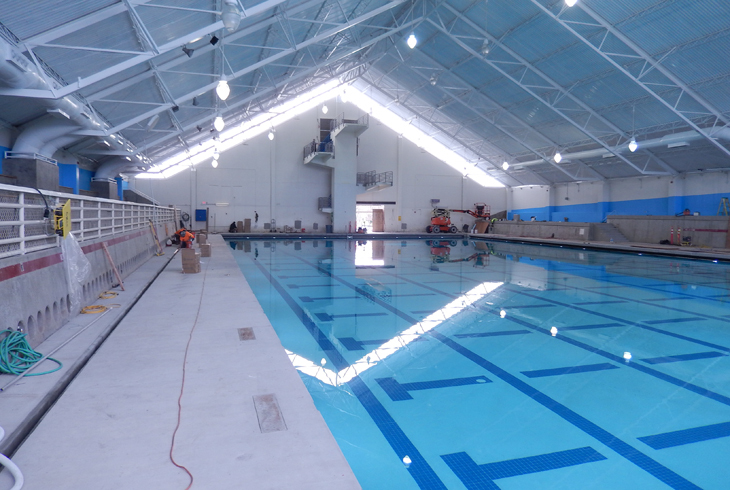 A variety of improvements have been made to the Tualatin Hills Aquatic Center, most notably a new roof. The center reopens to the public on Dec. 5 after a four-month closure. 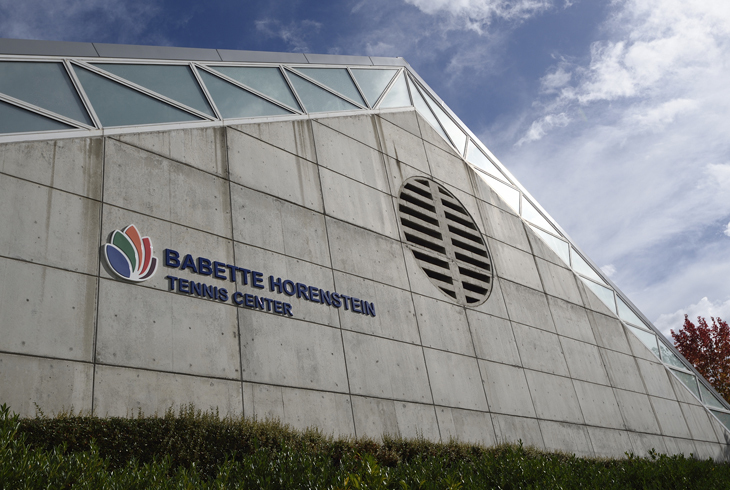 Staff at the Babette Horenstein Tennis Center will host a public event on Sunday, Dec. 11, (1-4 pm) that will celebrate the center’s namesake and the game she loved. 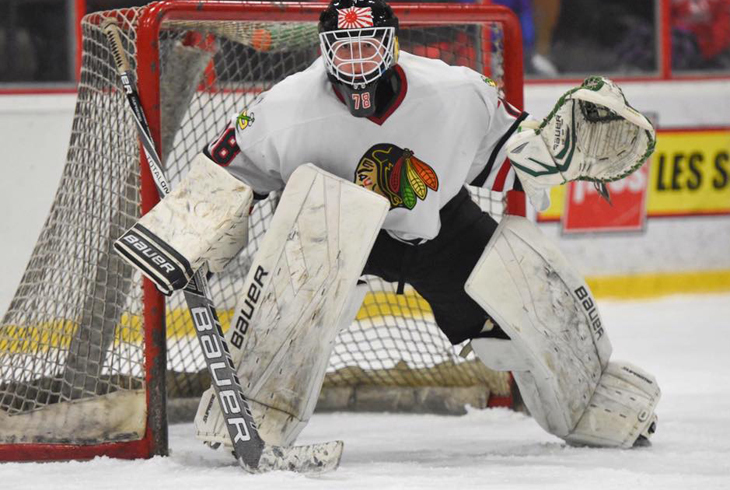 The Portland Winterhawks have approached THPRD with a public/private partnership proposal that would entail building an ice rink facility at THPRD’s HMT Recreation Complex in Beaverton. Discussions are ongoing, but no decisions have been made. 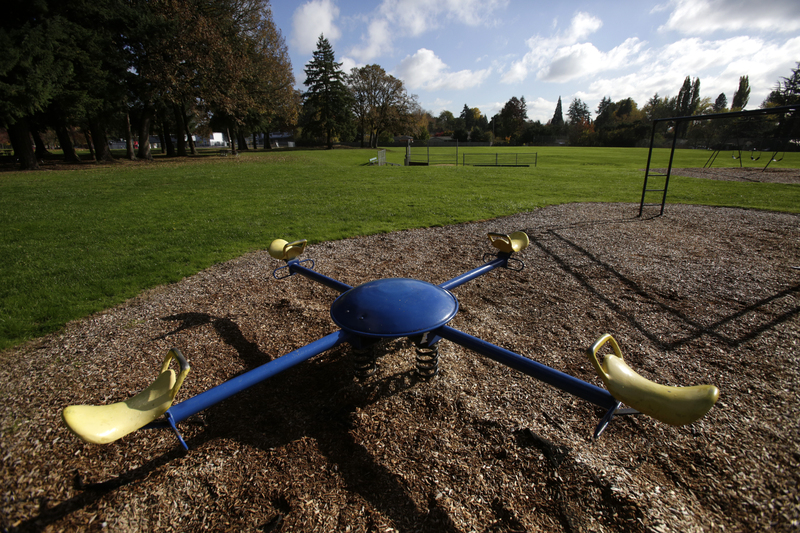 THPRD is making plans to remove an aging playground from Burntwood Park. 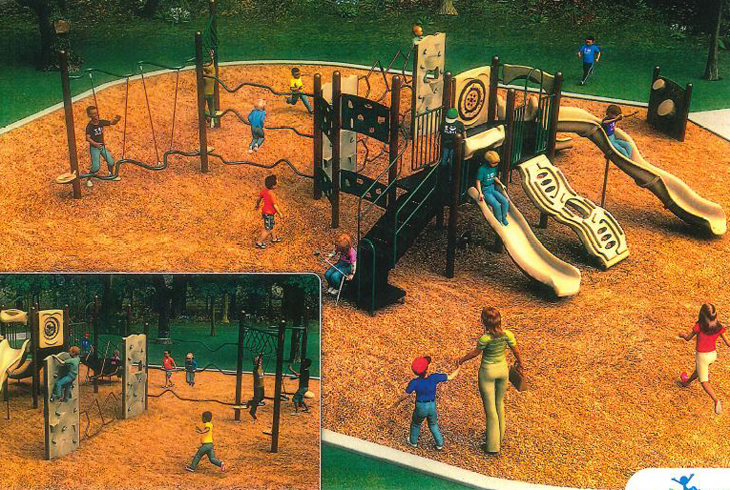 This playground, which is about 30 years old, is in a state of disrepair and no longer meets the current safety standards of the Consumer Product Safety Commission. 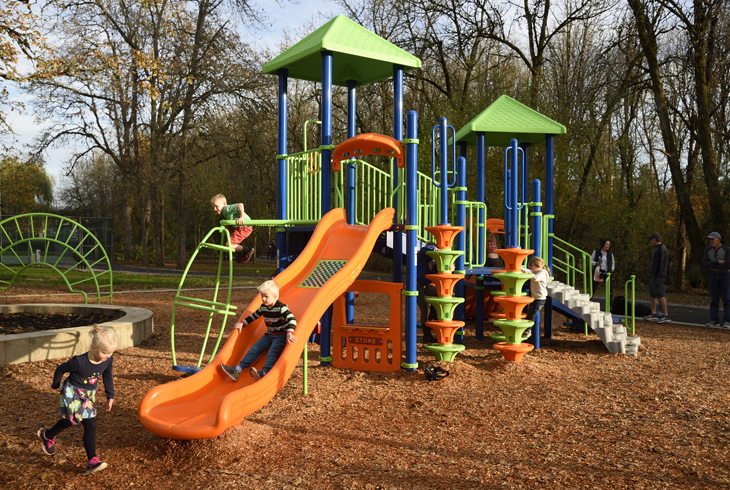 Residents of the Raleigh Hills neighborhood have some new reasons to visit McMillan Park. 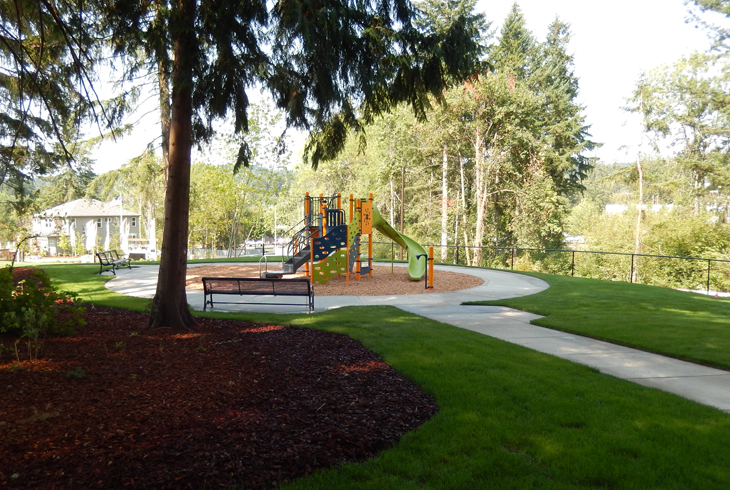 THPRD has completed several improvements to the 3.67-acre site at SW Chestnut Place and SW Cypress Street. 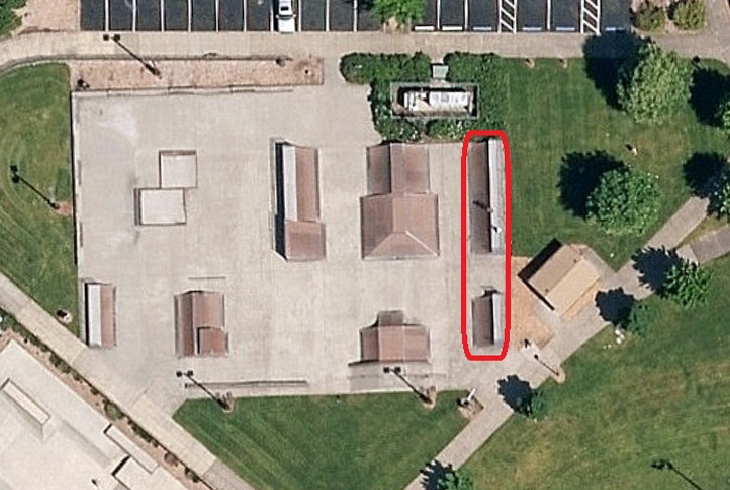 On December 1, THPRD will begin renovating two of the wood ramps at the Howard M. Terpenning Recreation Complex skate park. The project is scheduled to be completed by December 22. In observance of the Veterans Day holiday, THPRD's administrative office and many other sites will be closed this Friday, Nov. 11. 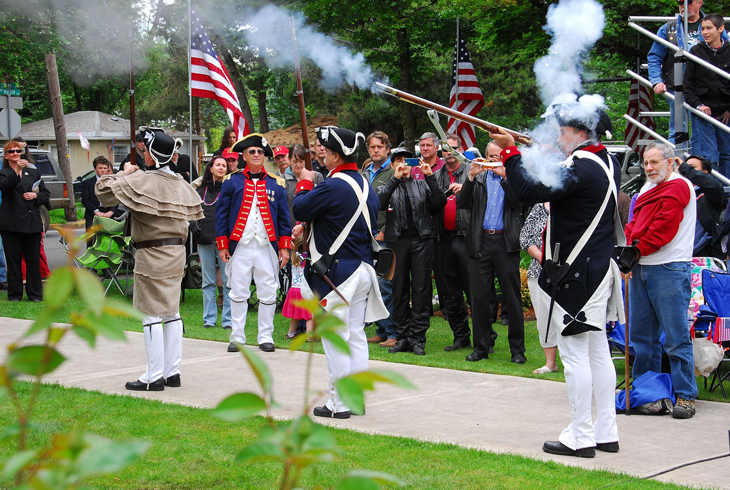 Join THPRD in celebrating those who have served at two Friday events. 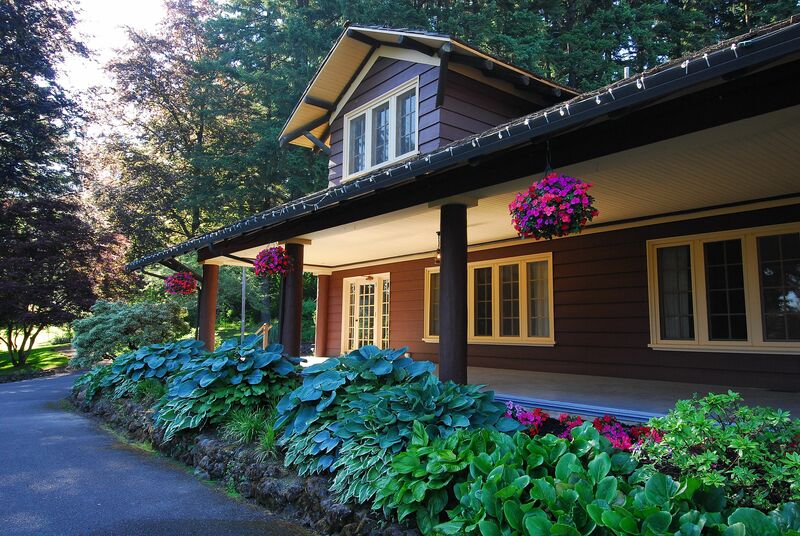 THPRD is now accepting applications to fill one citizen position on its Budget Committee. The deadline is Wednesday, Nov. 16. Applicants serve a three-year term and must live within district boundaries. Longtime employee Keith Watson has been promoted to superintendent of Sports for THPRD. 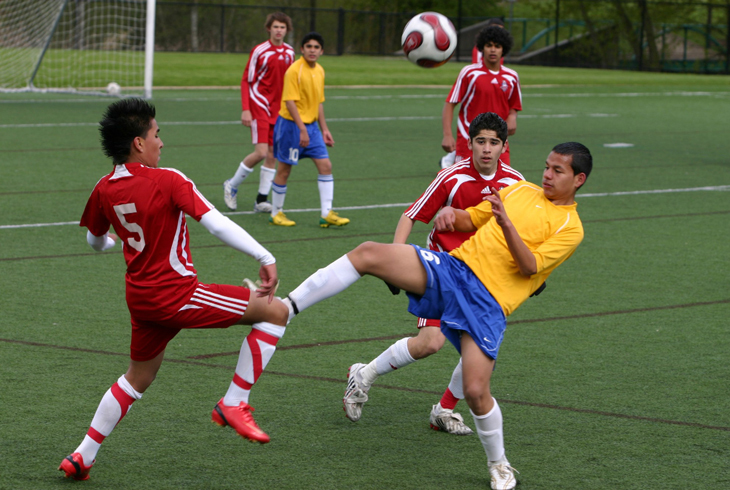 Watson will oversee programming and fiscal management for the Sports Department, coordinate partnerships with the Beaverton School District and affiliated sports leagues; and recruit tournaments and other sporting events. 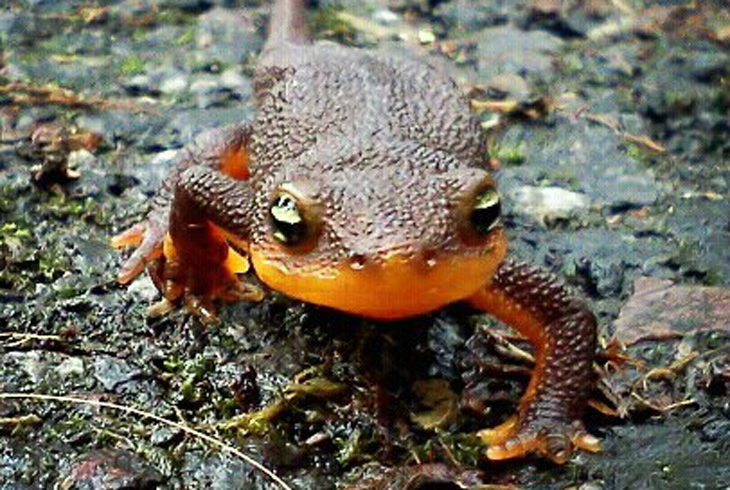 Newt Day is back! 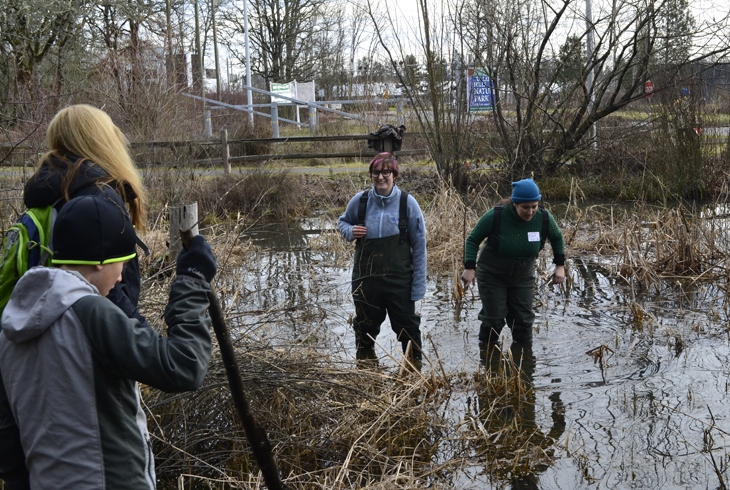 THPRD’s annual homage to the rough-skinned amphibian returns on Saturday, Nov. 5, from noon to 4 p.m. at the Tualatin Hills Nature Center. Admission is just $2. 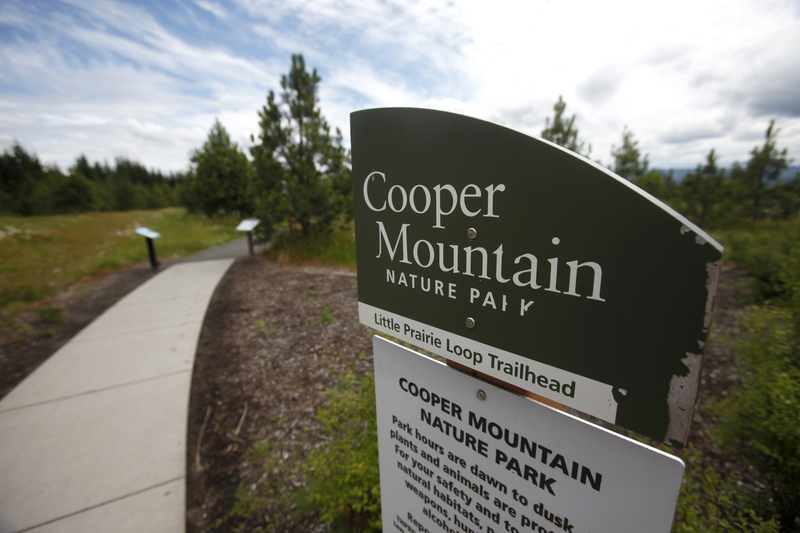 Cooper Mountain Nature Park will close on Wednesday, Sept. 27, for a controlled burn that is designed to reduce the risk of wildfire and help restore habitat for wildlife and plants. 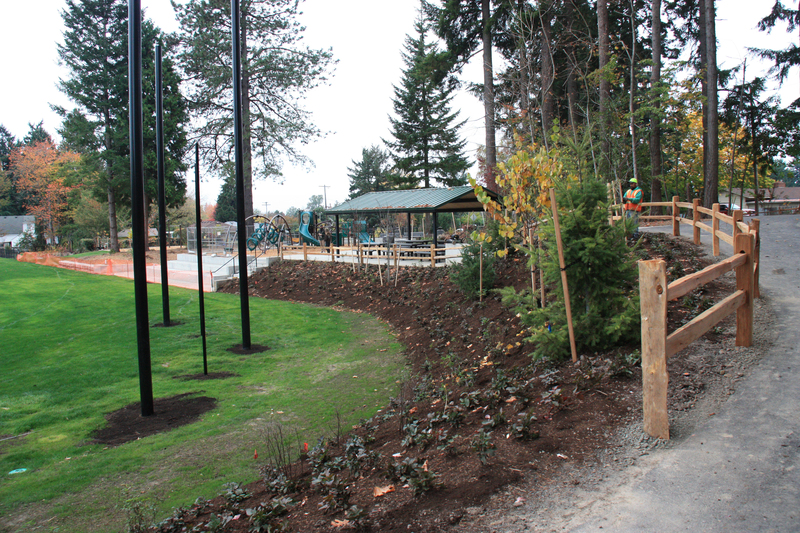 The park is expected to re-open on Saturday, Sept. 30. 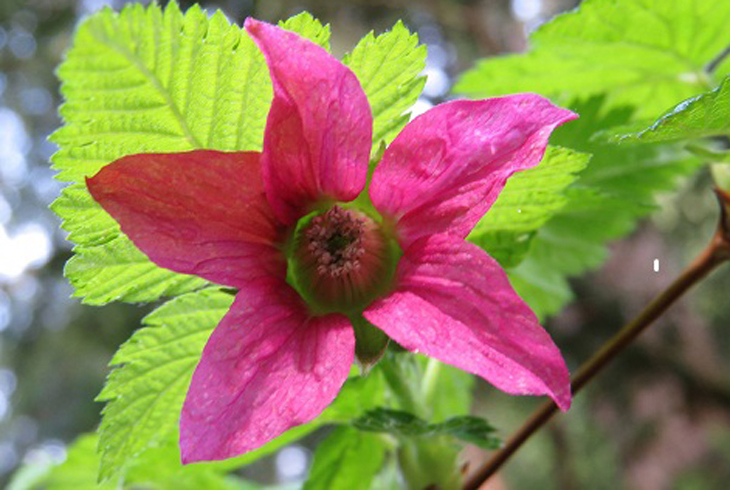 More than 100 varieties of native trees, shrubs, ground covers and perennials will be available at THPRD's 11th Annual Fall Native Plant Sale on Oct. 8. 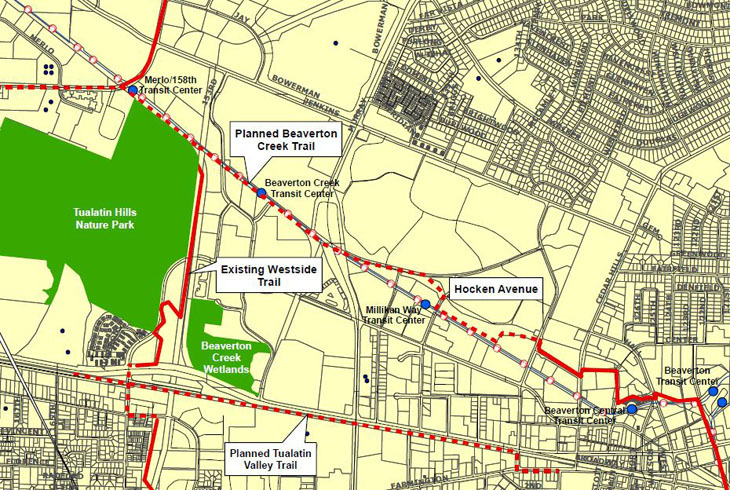 The Oregon Transportation Commission has awarded THPRD a $400,000 grant to help pay for one of the final links of the Waterhouse Trail, a system that will ultimately extend 10 miles through the heart of greater Beaverton. 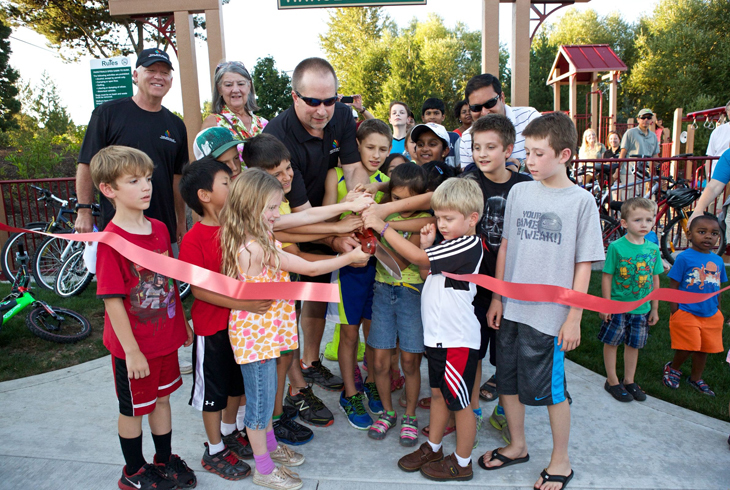 On Sept. 20, THPRD and the Tualatin Valley Water District celebrated the reopening of Ridgewood View Park. 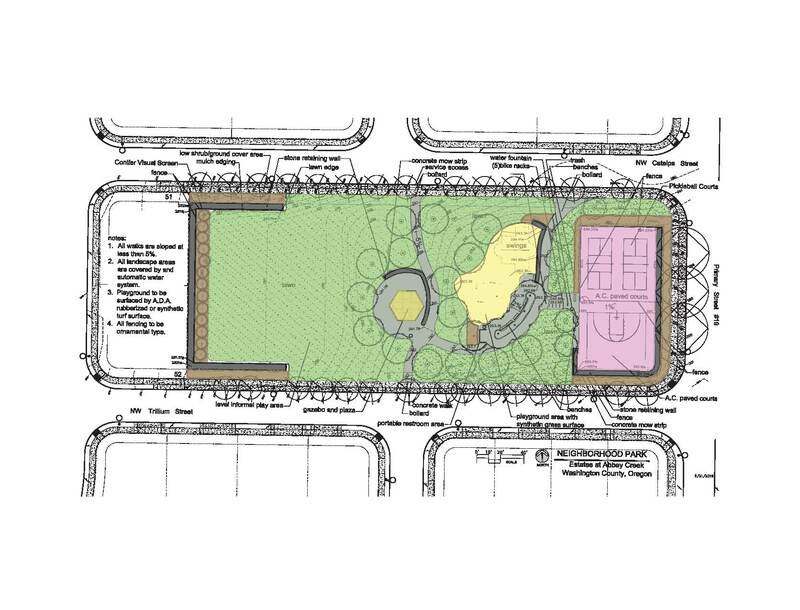 In addition to a new reservoir and pump station, the site will include tennis, pickleball and bocce courts. 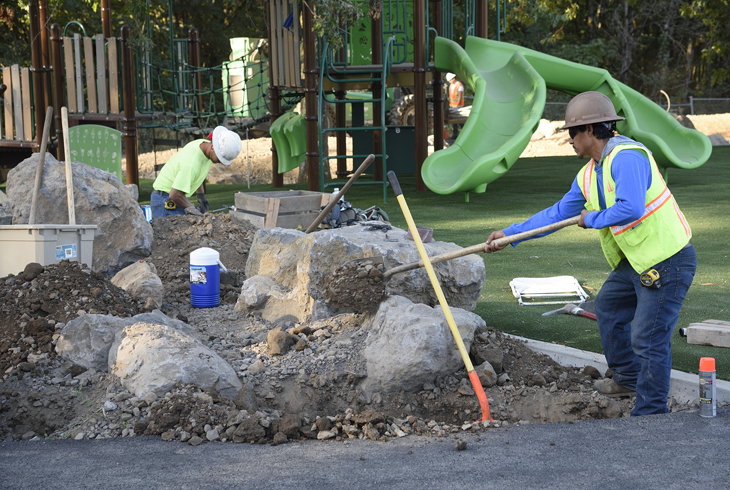 Within the next six weeks, the park maintenance department will have a contractor remove the hitting wall that sits between the basketball courts adjacent the Harman Swim Center. 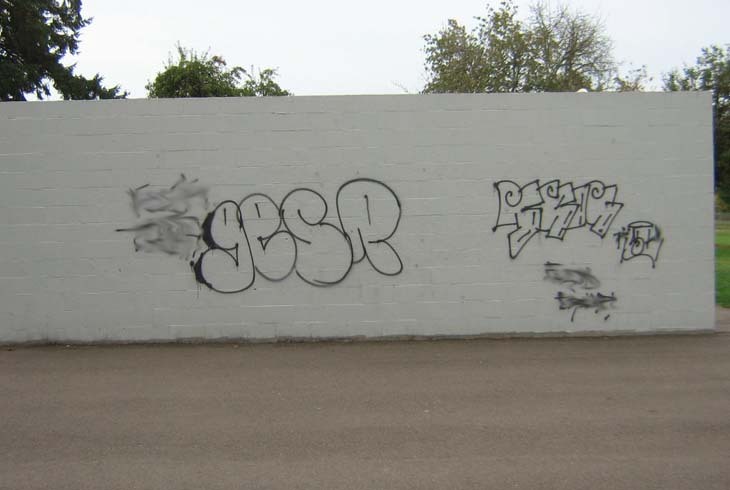 The wall has been the target of repeated acts of vandalism. 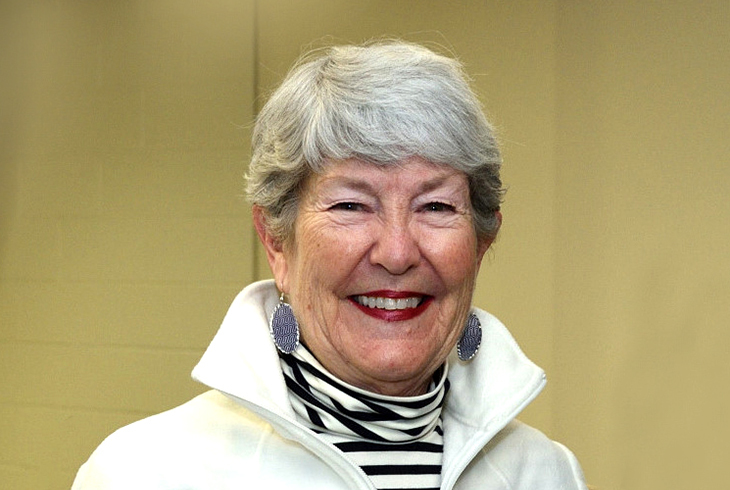 THPRD is changing the name of its Tennis Center to honor longtime board member/tennis advocate Babette Horenstein. 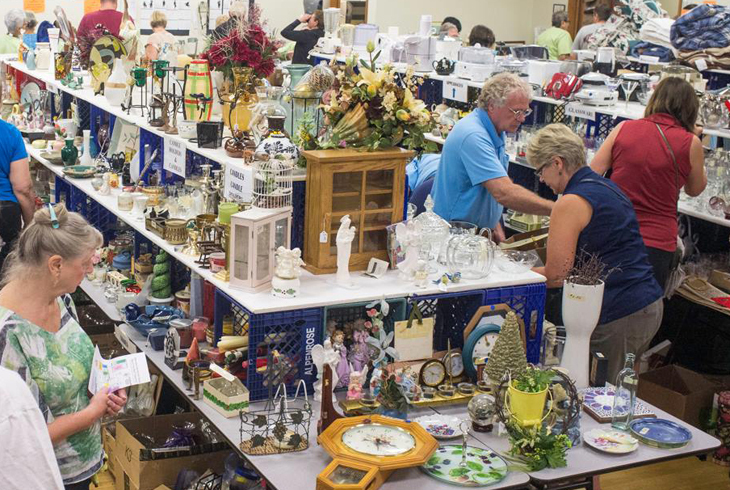 The Elsie Stuhr Center is asking residents to support its annual fundraiser by donating gently-used items, including home goods, jewelry, antiques, clothing, collectibles, sporting goods, garden items, toys and holiday décor to be sold at the Harvest Bazaar. 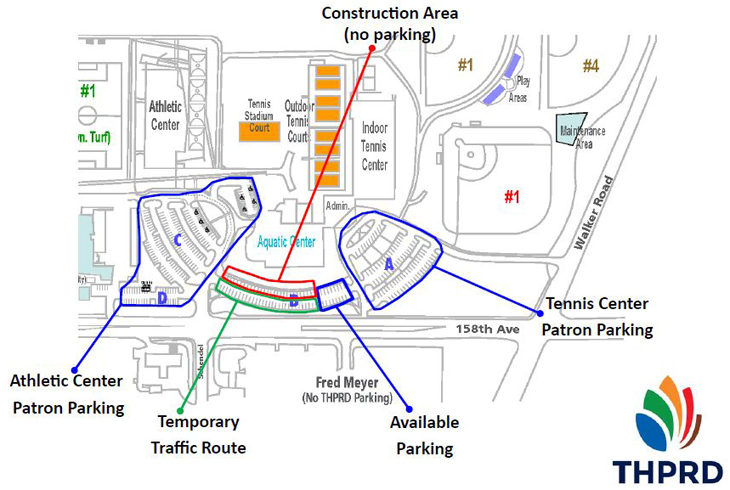 A project to replace the roof at the Tualatin Hills Aquatic Center will affect traffic and parking at the HMT Recreation Complex. This project is scheduled to be completed by the end of November. 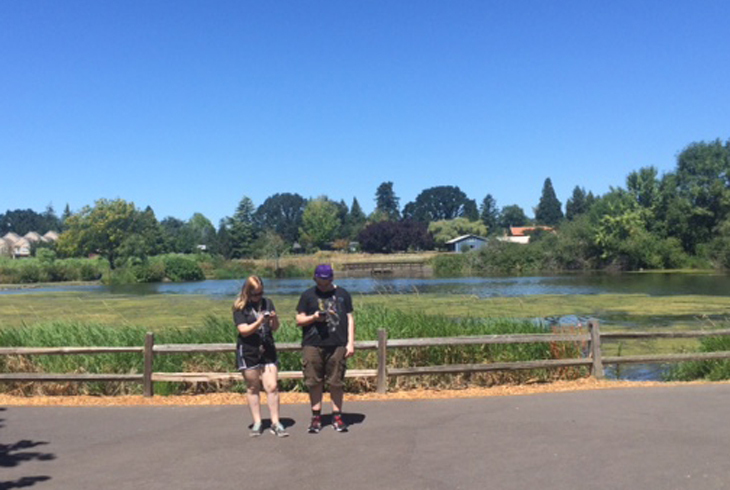 THPRD is a virtual hotbed of Pokémon Go activity! Before you start collecting bats and Weedles, we’ve got some training tips to keep you safe and successful in your quest to catch ‘em all. 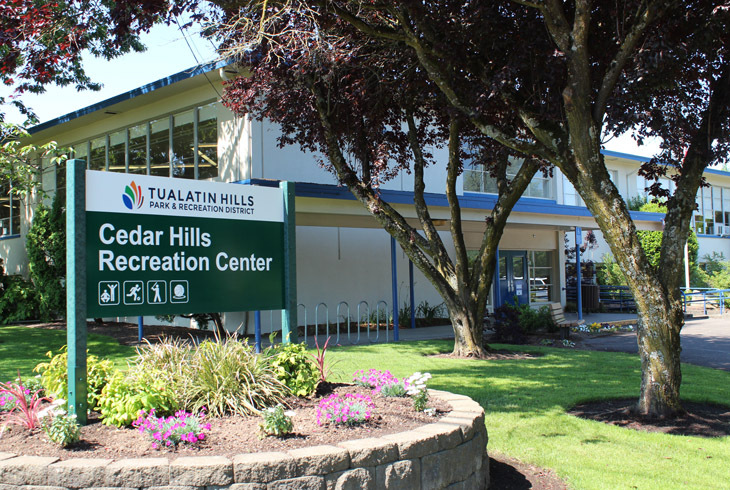 The Tualatin Hills Aquatic Center, the largest of THPRD's eight swimming pools, will close on Aug. 1, so that the facility’s roof and structural roof deck can be replaced. Work is expected to be completed at the end of November. 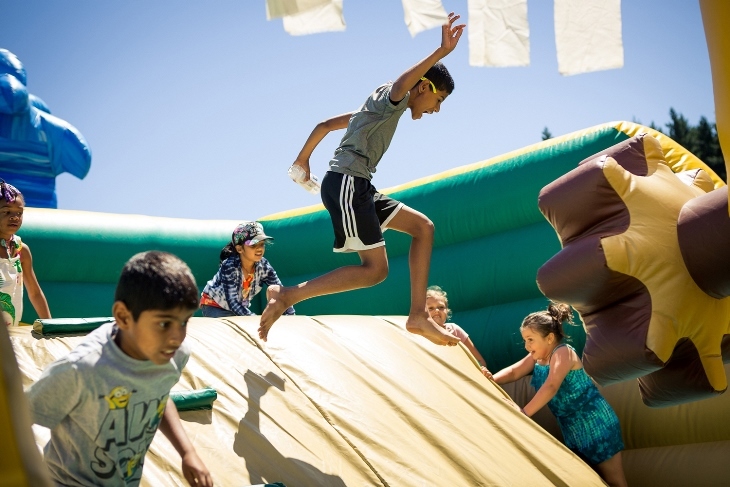 Party in the Park, the Tualatin Hills Park & Recreation District’s biggest community event of the year, returns to Beaverton on Saturday, July 30. 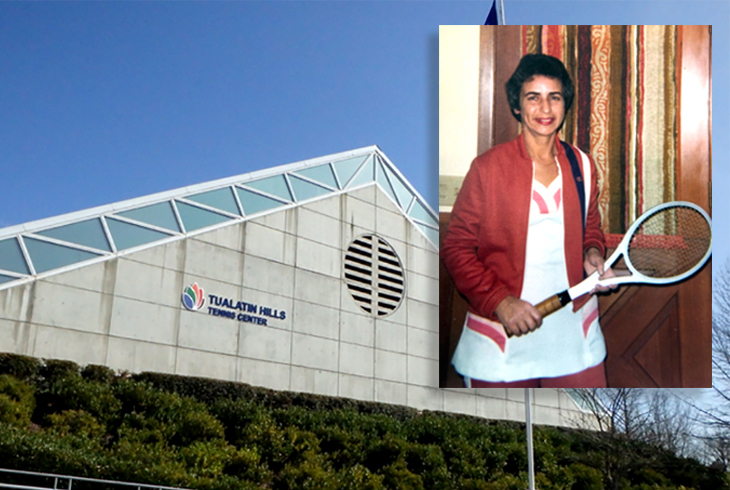 THPRD has scheduled a public meeting for the evening of July 14 to discuss a proposal that would rename its Tennis Center after longtime contributor Babette Horenstein. Blues giant Curtis Salgado opens THPRD’s free Concert & Theater in the Park series with a July 7 show at Garden Home Park. The series includes six events throughout July & August. 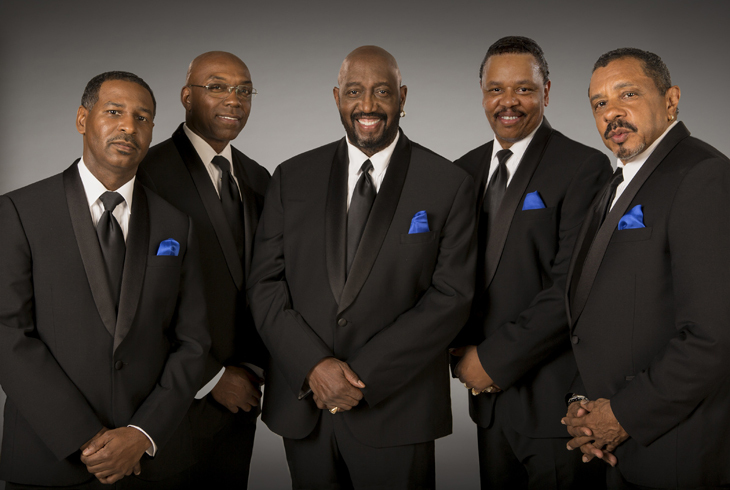 The Temptations, whose soulful vocal harmonies skyrocketed them into the Rock 'n Roll Hall of Fame, will headline THPRD's 6th annual Groovin' on the Grass concert event on Saturday, Aug. 20. There are a lot of things that THPRD does well. Touting our accomplishments isn’t always one of them. As a finalist for the National Gold Medal Award, we’re taking a moment to puff out our chest a little. THPRD is committed to being a water conservation leader. Responsible water use is critical as the State of Oregon experiences drought conditions, which may persist or grow worse in future years. A $114.1 million budget for the 2016-17 fiscal year was approved by the Budget Committee and is expected to be adopted by the board of directors on June 20. 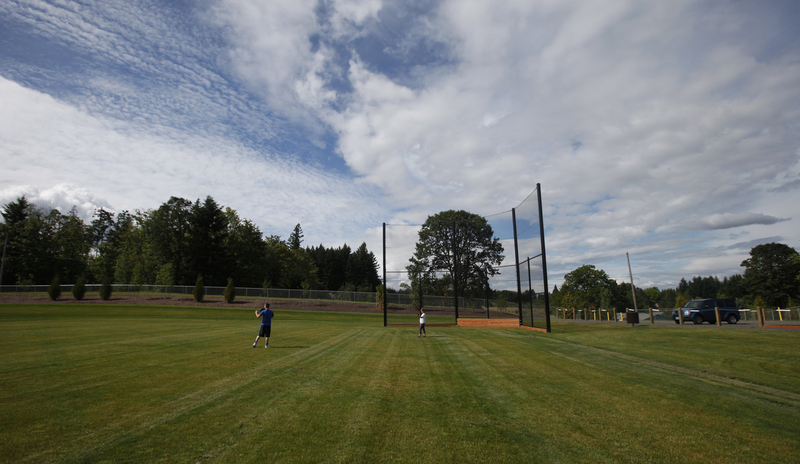 The Tualatin Hills Park & Recreation District has been named a finalist for the coveted 2016 National Gold Medal Award for Excellence in Park and Recreation Management. 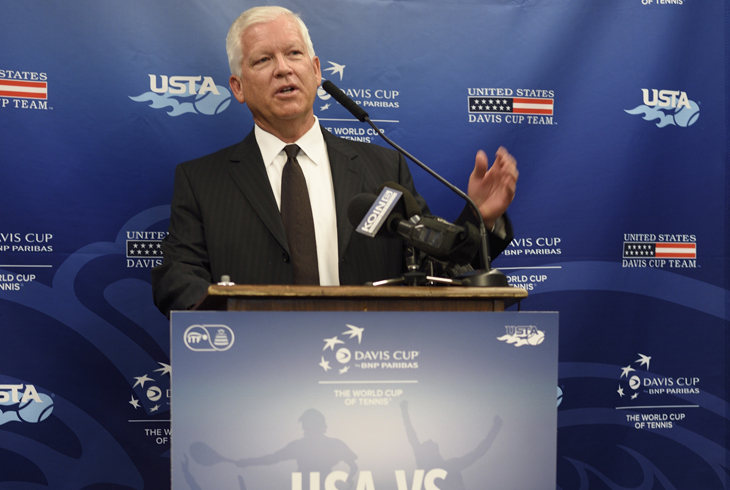 Beaverton will be the center of the tennis universe for three days in July, when Tualatin Hills Park & Recreation District hosts a Davis Cup quarterfinal between the United States and Croatia. 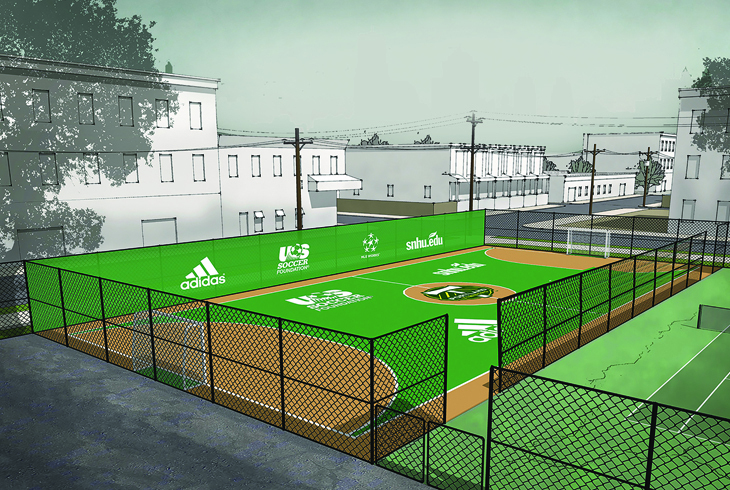 Futsal at Center Street Park? 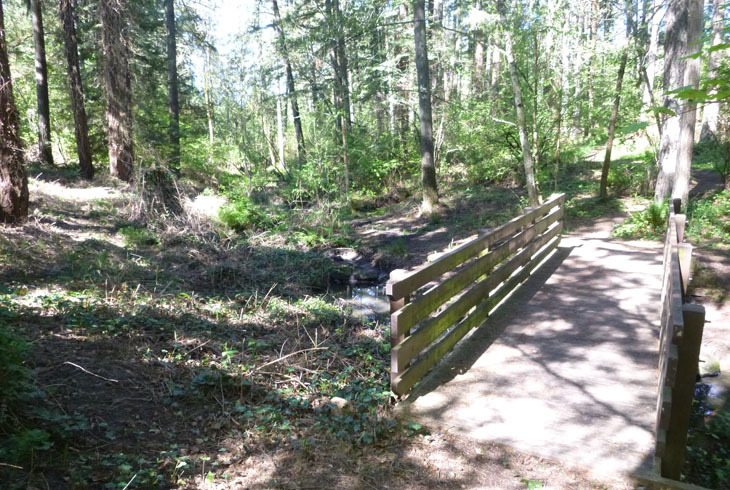 Trail maintenance is scheduled on the Rock Creek Trail between the Stoller Creek Trail and West Union Blvd., April 26-29. 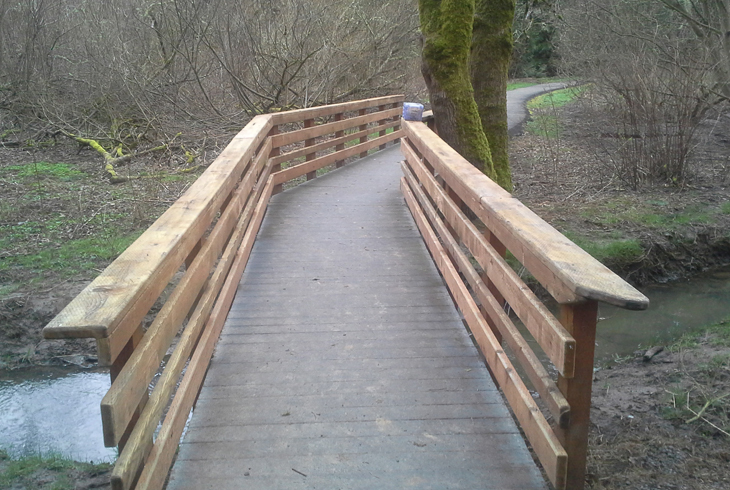 To complete repairs on the trail, this trail segment will be closed on Tuesday, April 26, from 7 am - 6 pm. 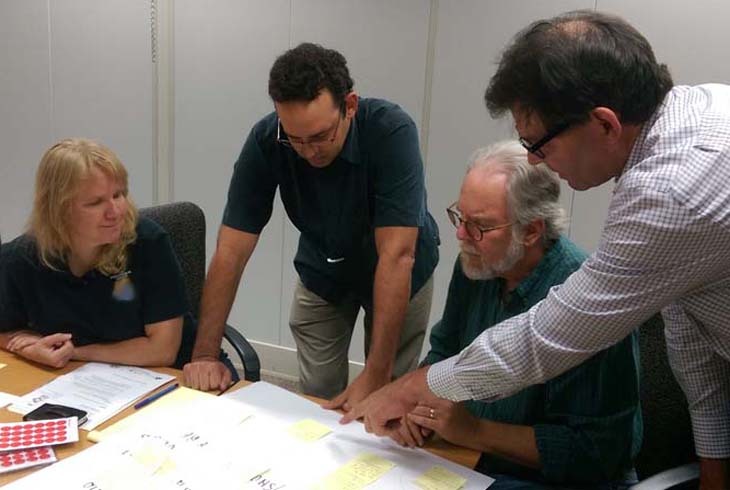 In an achievement that took 10 years but significantly reduced employee injuries in the process,THPRD has graduated from a prestigious safety program run by the Oregon division of the federal Occupational Safety and Health Administration (OSHA). Online and phone registration for THPRD summer classes, camps and activities will be open to in-district residents starting Saturday, April 16, from 8 am to 6 pm. 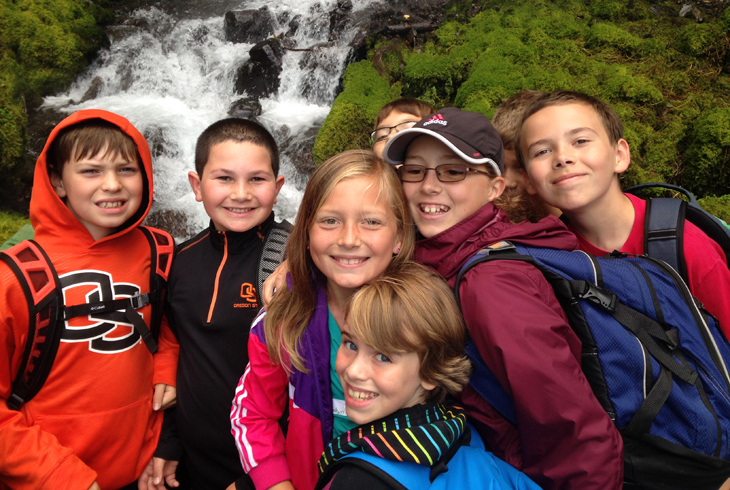 Class descriptions and schedules, along with registration instructions and forms, are in THPRD’s 2016 summer activities guide. Want to attract birds and butterflies to your backyard this spring and summer but don’t know where to start? 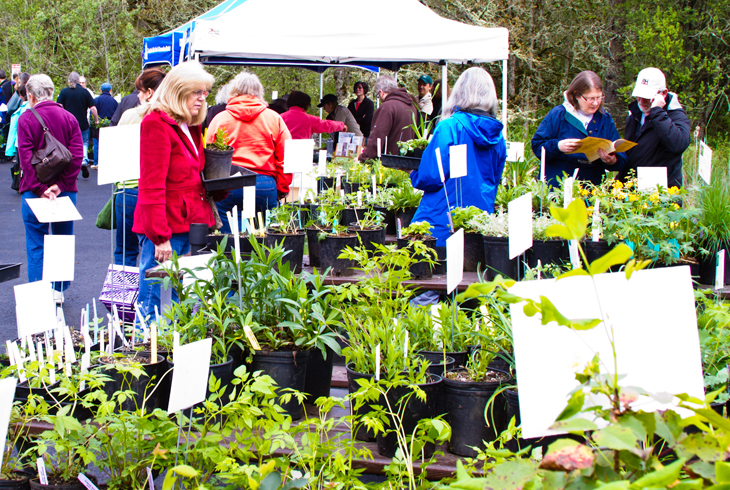 Native plants are the answer, and THPRD will have more than 150 varieties available at its Spring Native Plant Sale and Resource Fair on Saturday, April 16, 10 am - 2 pm. 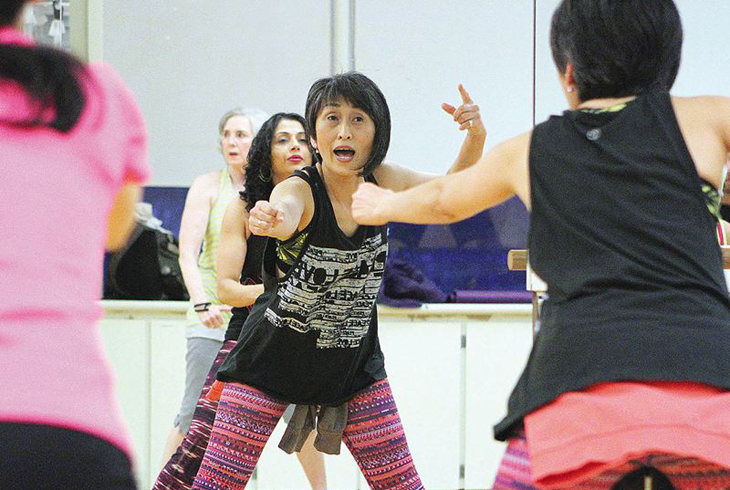 Group fitness instructor Kimo Metzler is kind of a big deal. In a story recently published by Northwest 50 Something, the 53-year-old said she is the best shape of her life. THPRD has a great new amenity in place for cyclists. 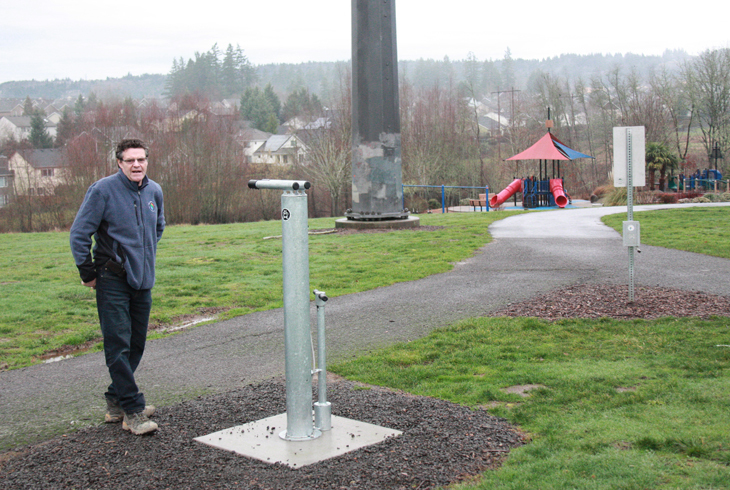 The district has installed its first self-service bike repair station near popular Pirate Park, where the Waterhouse Trail meets the Rock Creek Trail. The deck boards on the Hideaway Park bridge will be replaced this month. The project will begin on March 23 and is expected to be completed by March 30. Over the past decade, THPRD has emerged as a reliable meal source for those who need it most. 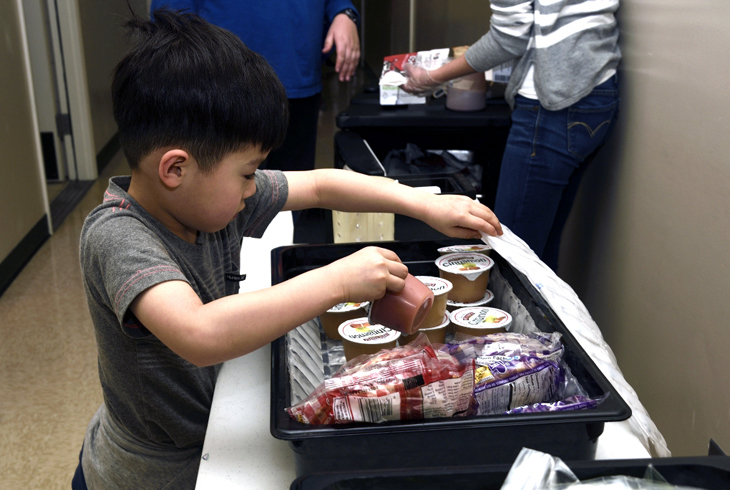 The district is expected to serve more than 50,000 free meals to Beaverton-area kids in need this year. 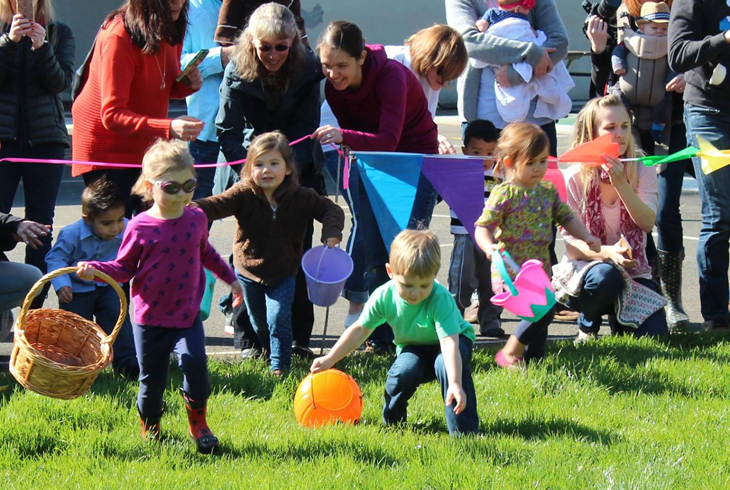 Eager kids of all ages won’t have to wait much longer to enjoy THPRD’s annual spring egg hunts – they arrive early this year! Preregistration is recommended at all events because space is limited; hop online to secure a spot, or call the host center. 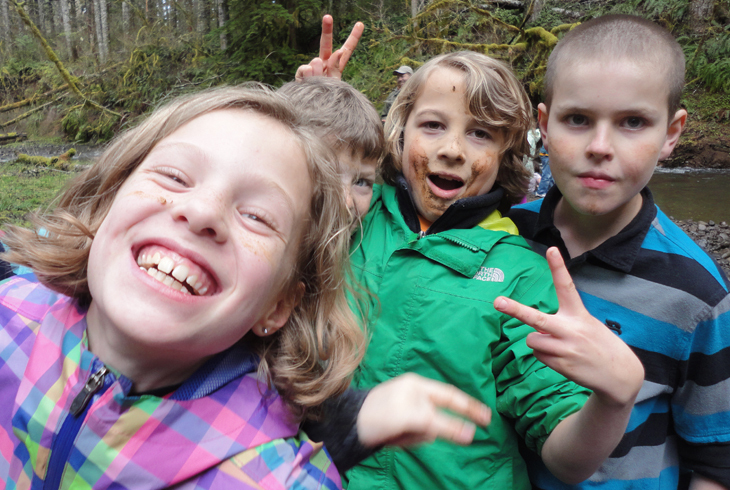 Registration for THPRD's spring programs will be open to in-district residents on Saturday, March 5, at 8 am. For residents living outside the district, registration will begin Monday, March 7. 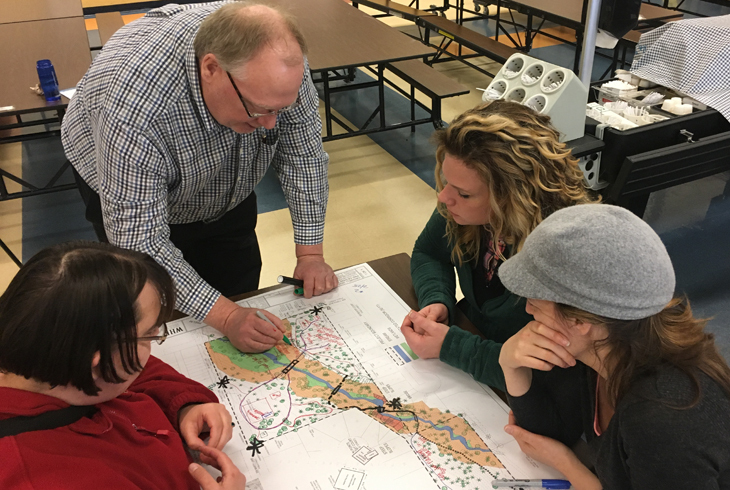 Larry Pelatt, President of THPRD's Board of Directors, weighs in on the value of five new functional plans developed during the recent comprehensive plan update. 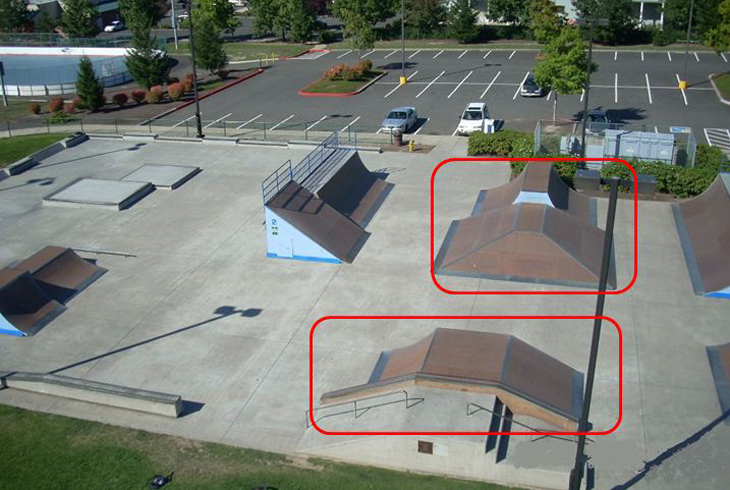 Beginning in March, THPRD will be renovating three of the wood ramps at the HMT Complex skate park, requiring sections of the skate park to be temporarily shut down. THPRD's budget, which serves as a financial plan, operational plan and operations guide for all district activities, is currently being prepared for the 2016-17 fiscal year, which begins July 1, 2016. 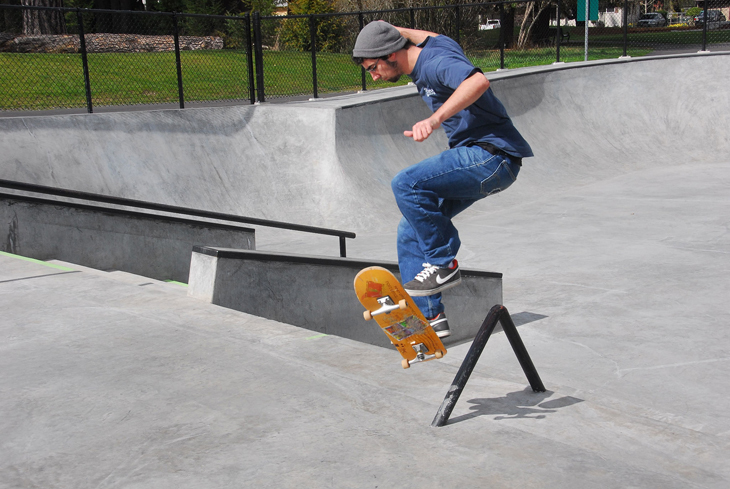 The budget informs THPRD's decision-making process and ensures funds are available for the programs, maintenance, and special projects that serve your recreational needs. It gives us confidence your property tax dollars are being managed and spent responsibly. For the 11th straight year, THPRD has been honored for the quality of its budgeting process. 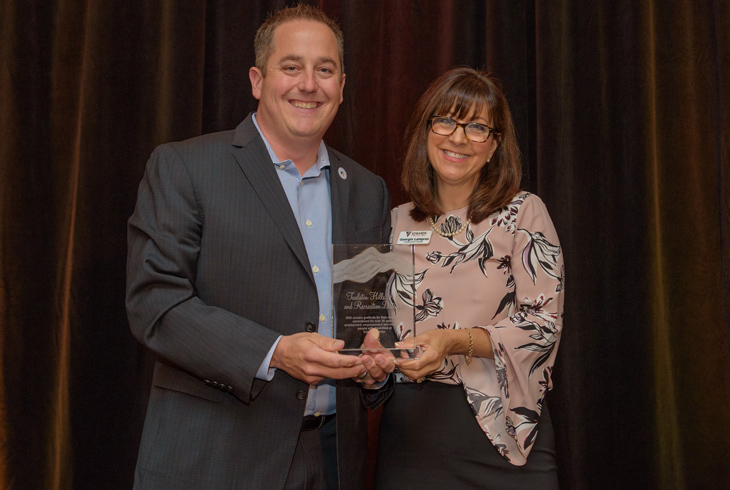 The district received the Distinguished Budget Presentation Award from the Government Finance Officers Association of the United States and Canada (GFOA). 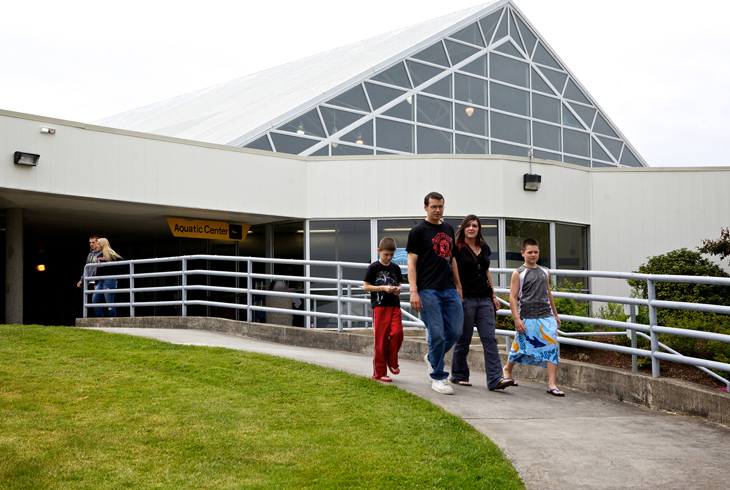 Harman Swim Center, which has been closed for extensive renovation, will reopen on Monday, Feb. 8. 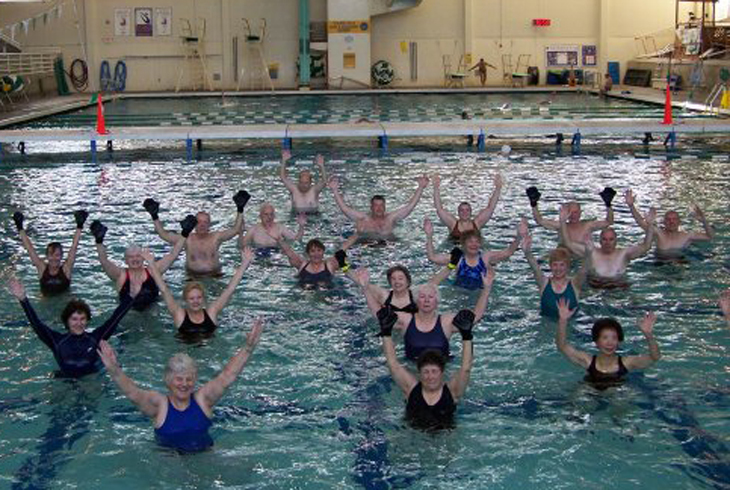 A public open house on Sunday, Feb. 7, will include a free open swim from 3 to 5 pm. 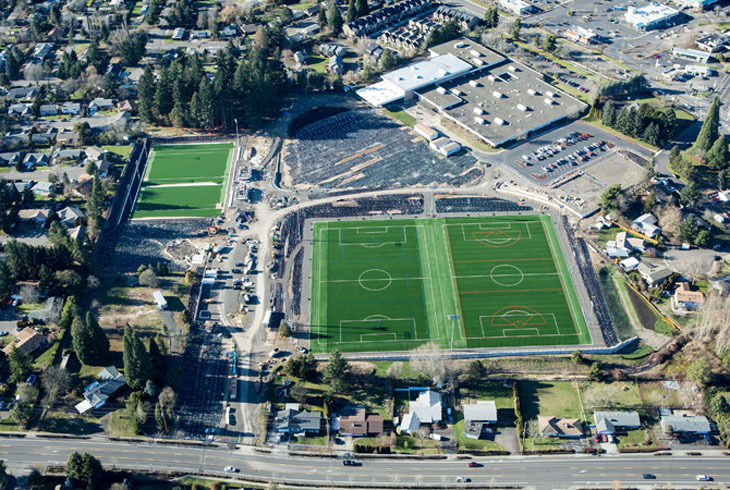 THPRD is seeking public feedback on the Athletic Facilities functional plan, which is scheduled to be presented to the Board of Directors for adoption at the regular meeting on March 7. 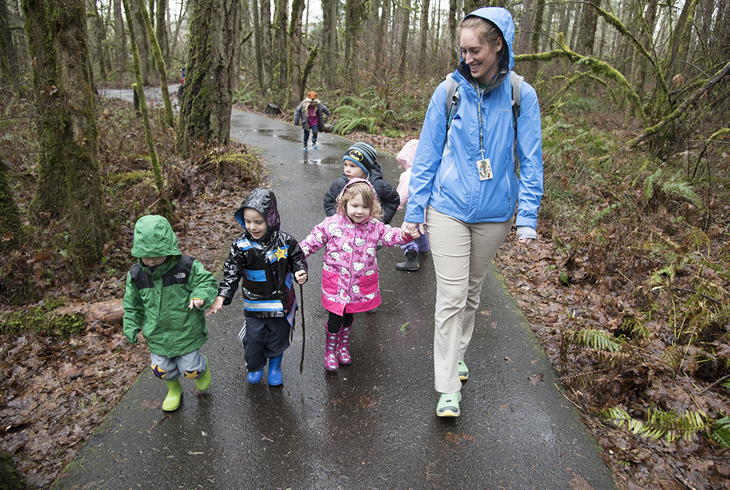 The Tualatin Hills Nature Center will accept new registrants for its popular nine-month nature preschool program at an open house on Saturday, Feb. 6, from 10 am to noon. Miles Glowacki has been newly appointed and Stephen Pearson reappointed to THPRD's Budget Committee. Each will serve a three-year term. 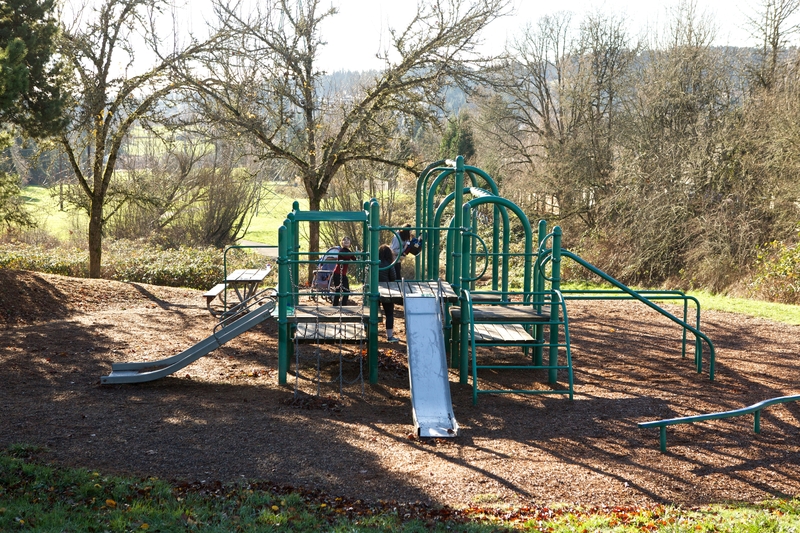 The Tualatin Hills Park & Recreation District Board of Directors voted unanimously on Tuesday, Jan. 12, to rescind a previous decision to rename Hideaway Park in the Garden Home area. 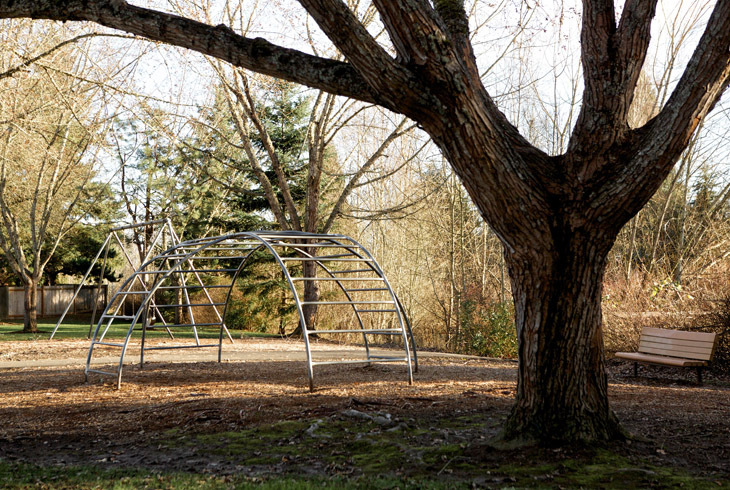 On Thursday, January 28th at 6:00 pm, attend a public meeting to provide feedback on the proposed expansion at Eichler Park. Join us - children are welcome! 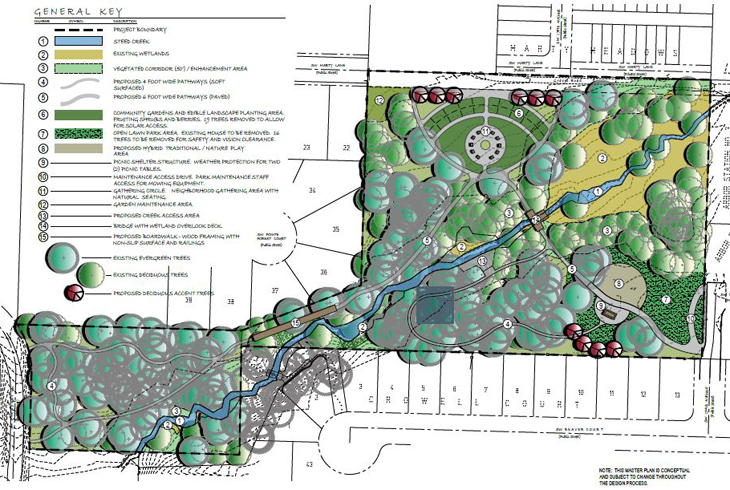 - to review master plan designs, ask questions and provide your input on the proposed expansion. 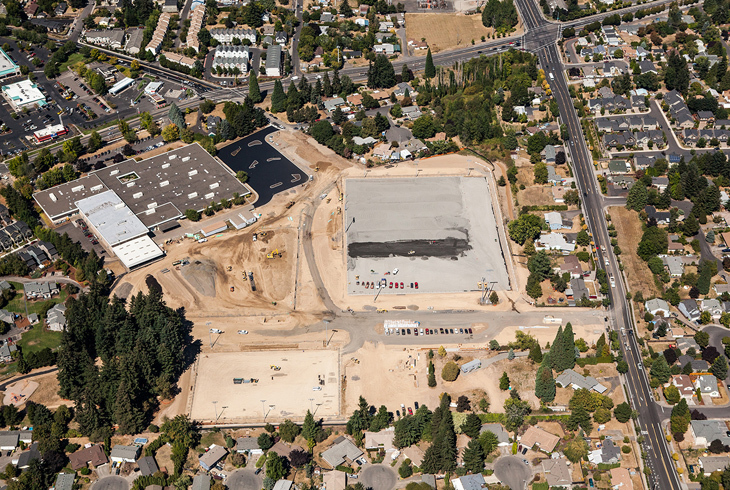 THPRD is creating a master list of capital improvement projects. To prioritize upcoming projects, the district is seeking public input at two meetings in January. The district's Board of Directors approved the appointment of 27 community volunteers -- including 13 new appointees -- to the district’s reorganized advisory committees. 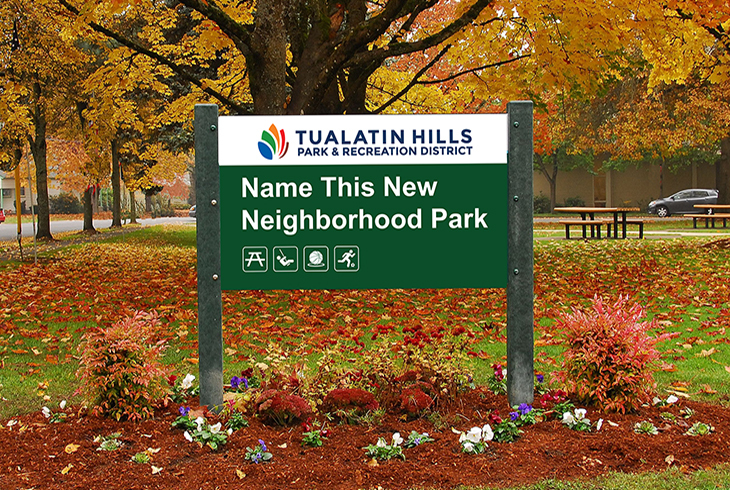 THPRD's Board of Directors approved the names of three new park sites; one in south Beaverton and two in Cedar Mill. All three sites were acquired from developer Polygon Northwest within the last two years. 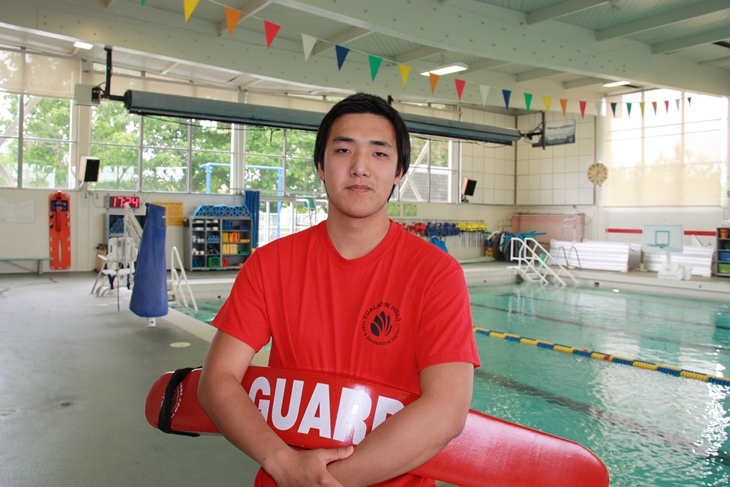 Daniel Howse began lifeguarding when he was only 12 years old. He was hired by THPRD at 16. Now 20, Howse hasn't had to look hard for work like many of his peers. Registration for THPRD's winter term will be open to district residents starting at 8 am on Saturday, Dec. 12. The district’s 2016 winter/spring activities guide is available online and in print at numerous community locations. 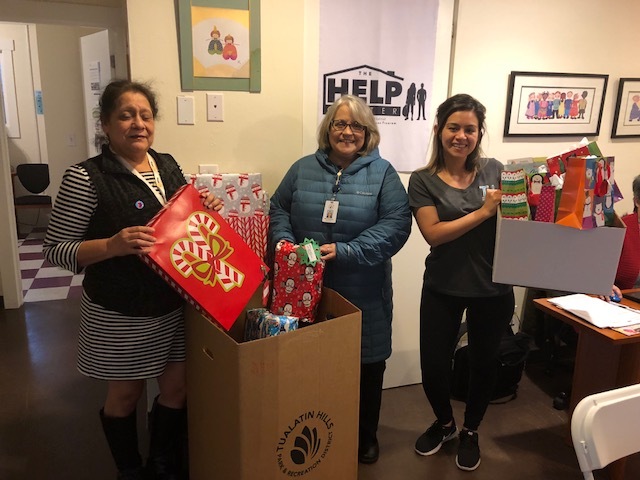 THPRD will once again work to create a brighter holiday season for low-income children and families in the Beaverton area by collecting toys, clothing and other items. 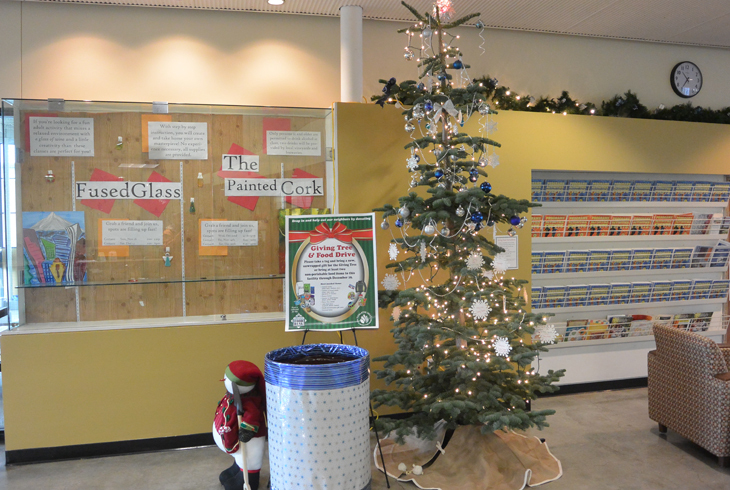 The park district will also collect food for the Oregon Food Bank. 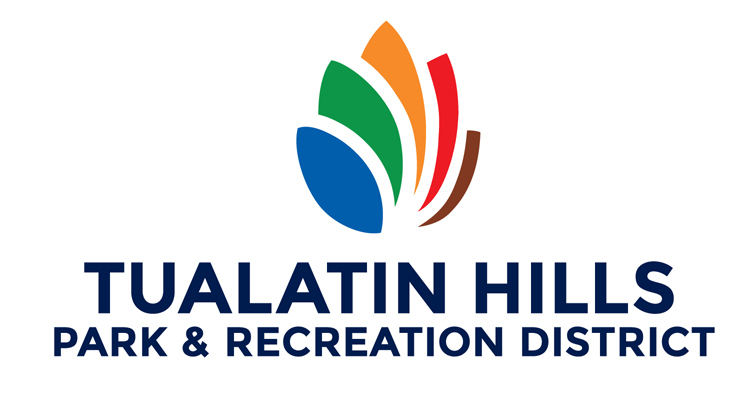 The Tualatin Hills Park & Recreation District is now accepting applications to fill one citizen position on its Budget Committee. The deadline is 5 pm Friday, Nov. 20. 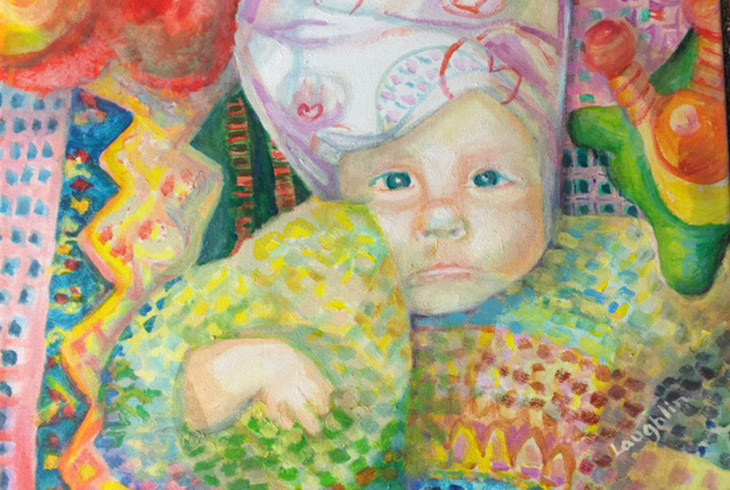 The Stuhr Center’s second annual Artisan Fine Arts Sale, Nov. 13-14, from 10 am to 4 pm, will feature more than 300 original works from Stuhr Center art students. 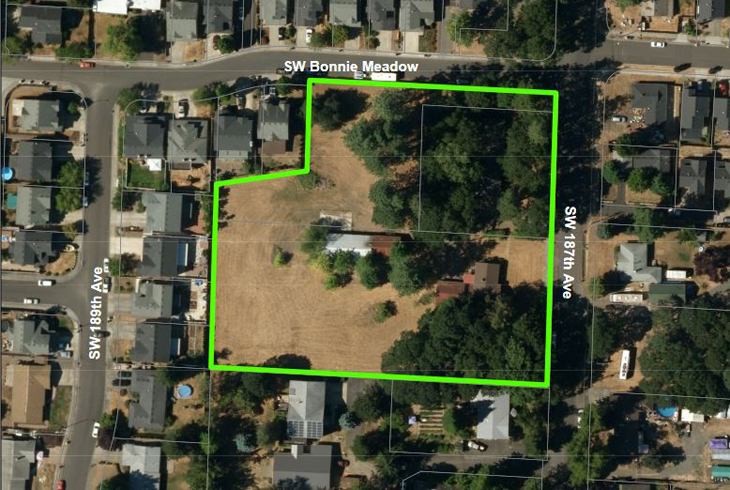 At its December 7th meeting, THPRD's Board of Directors will consider a proposal that would name a newly-acquired park site within the South Beaverton neighborhood Steeplechase Park. 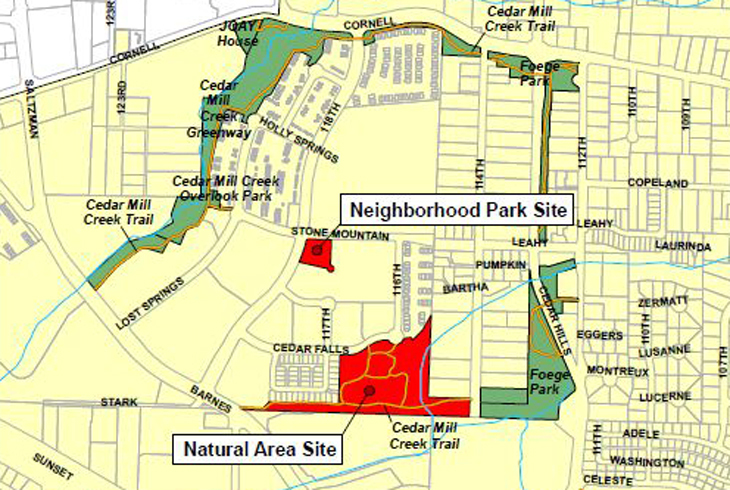 At its December 7 meeting, THPRD's Board of Directors will consider proposed park names for two newly-acquired sites within the Timberland development in Cedar Mill. 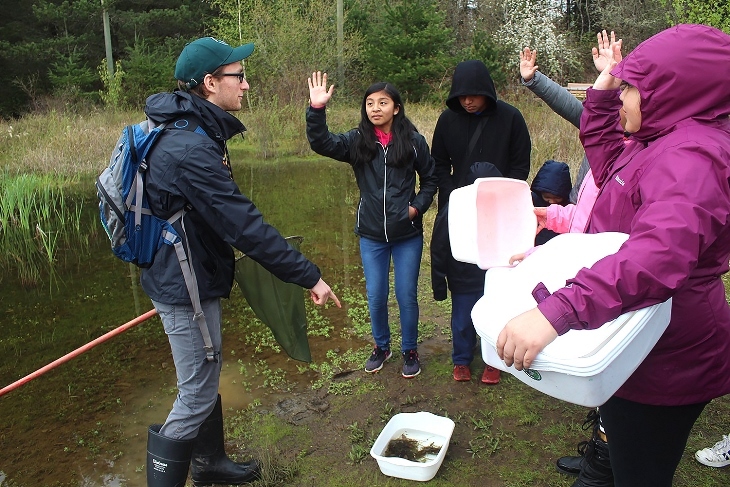 THPRD’s 14th annual celebration of the newt will return on Saturday, Nov. 7, to the Tualatin Hills Nature Center (15655 SW Millikan Way, Beaverton). 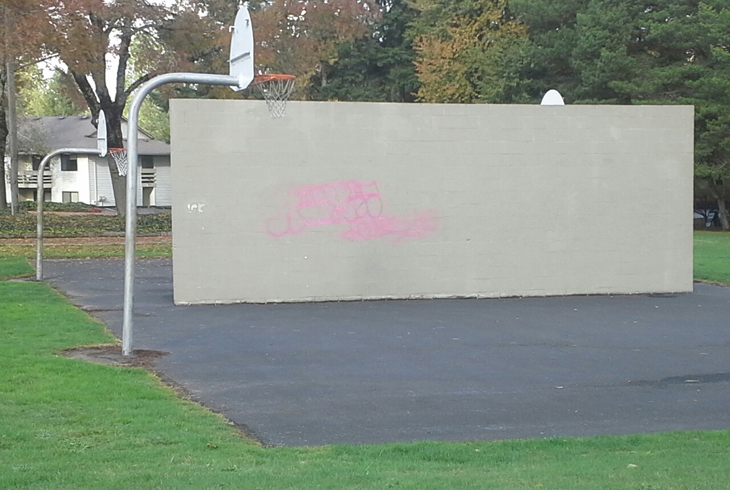 Due to repeated acts of vandalism on the hitting wall at Hazeldale Park, THPRD will have a contractor remove the wall and perform an asphalt patch on the existing basketball court. The spirit of the season is alive at THPRD, where a haunting good time awaits visitors at a number of fall events on the October schedule. 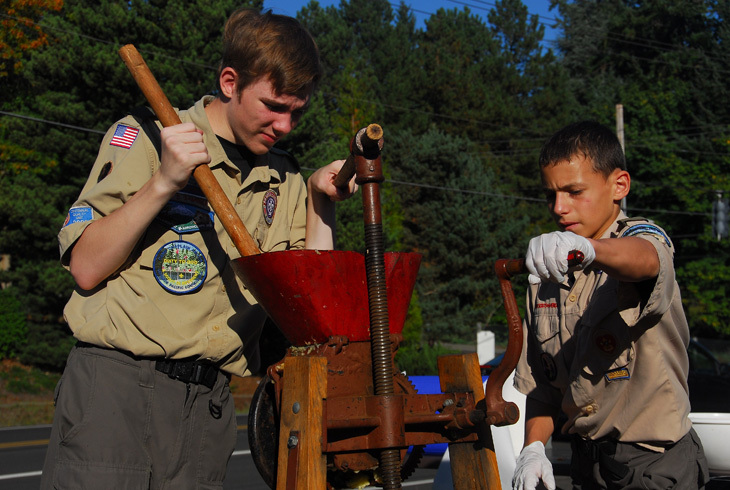 The Cedar Mill Cider Festival returns for its ninth year on Sunday, Oct. 18, from 1 to 4 pm at the historic John Quincy Adams Young House. 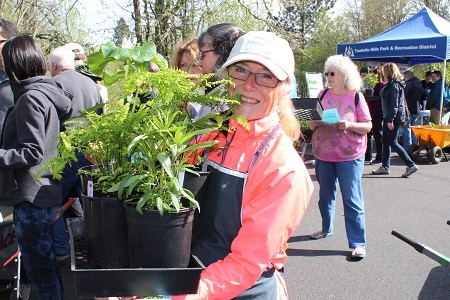 A large variety of native trees, shrubs, ground covers and perennials will be available at the Tualatin Hills Park & Recreation District's 10th Annual Fall Native Plant Sale. 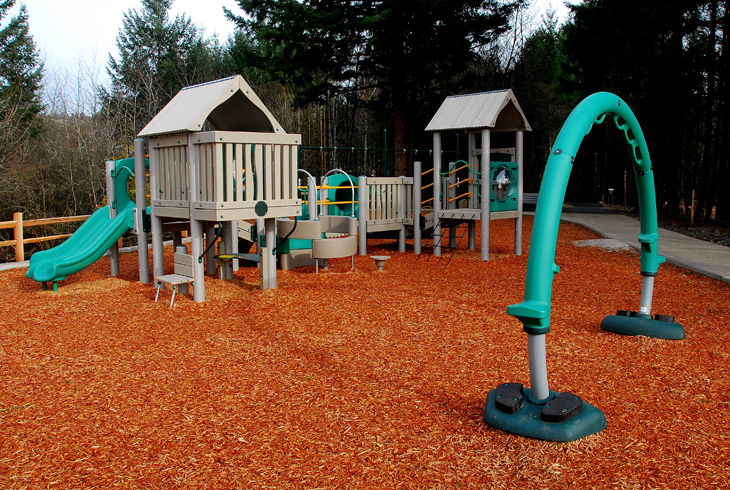 THPRD invites greater Beaverton and Aloha communities to help build a 5,000 square-foot inclusive play area through donations of all sizes. 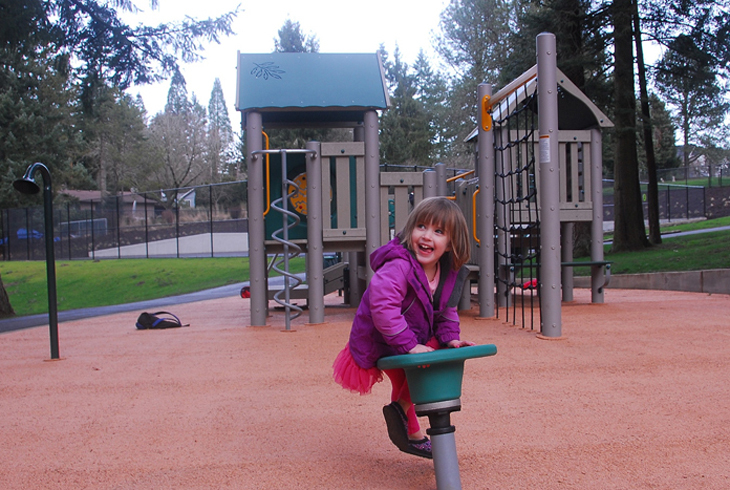 After carefully considering public input, the Tualatin Hills Park & Recreation District Board of Directors have voted unanimously to rename Hideaway Park in the Garden Home area in honor of the late Babette Horenstein. 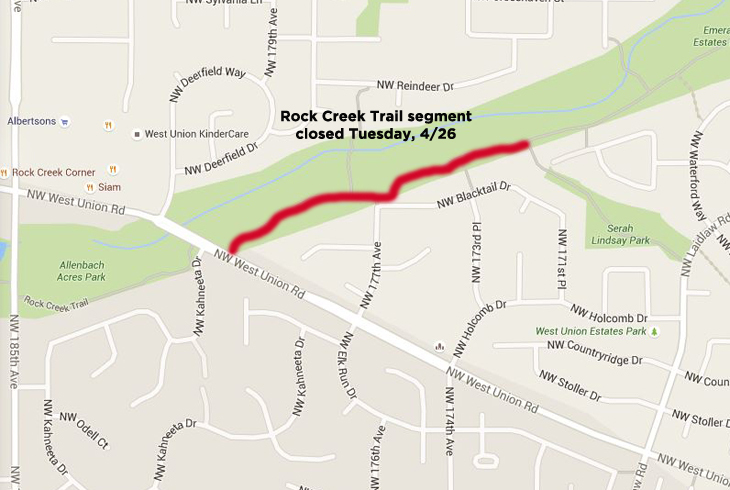 Heads up, Rock Creek Trail users. 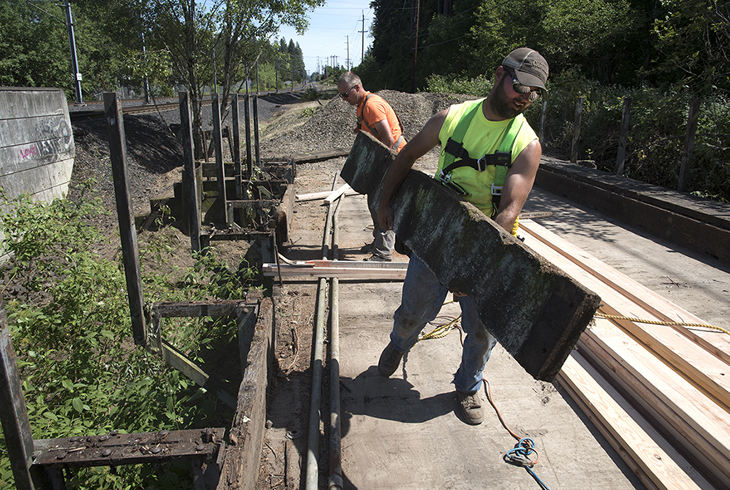 Your route is about to be disrupted by a substantial construction project that will re-route a portion of the regional trail system through October. 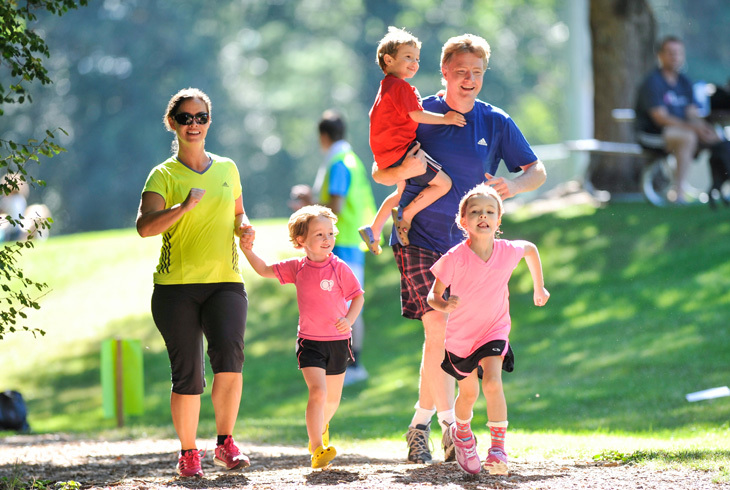 Registration for the Tualatin Hills Park & Recreation District’s fall classes and programs will be open to in-district residents starting Saturday morning, Aug. 15. 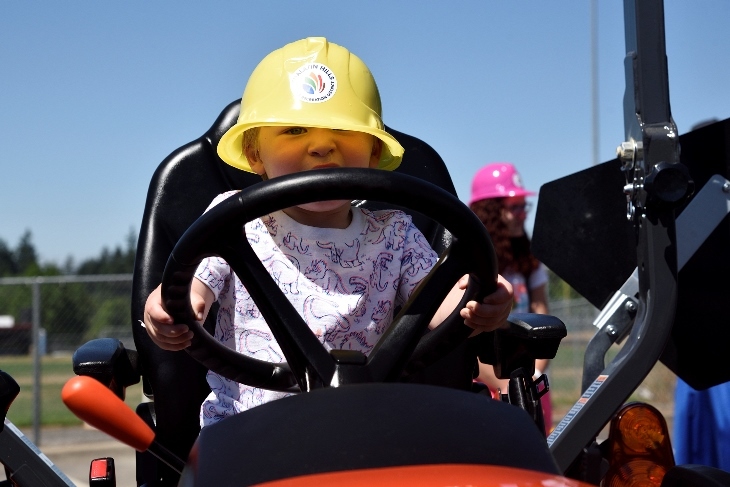 More than two dozen vehicles will be on display at the Conestoga Recreation & Aquatic Center when THPRD hosts its 17th annual Big Truck Day on Saturday, Aug. 8. THPRD's Board of Directors is requesting your help. To help them effectively communicate matters of interest to park district residents, please complete the brief survey below by August 23. You could win a $50 THPRD gift card! 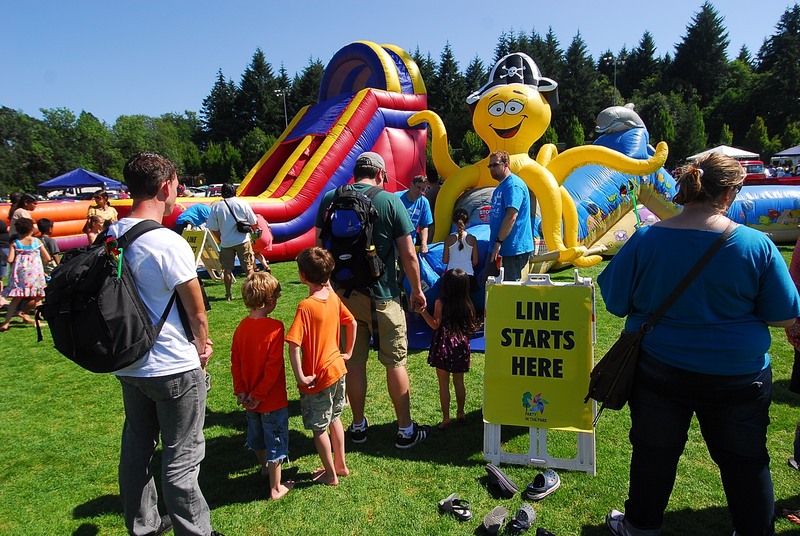 One of Beaverton’s top summer traditions returns on Saturday, July 25, when THPRD stages its 10th annual Party in the Park, a day-long festival of free, family-oriented fun at the Howard M. Terpenning Recreation Complex. As a public service in response to forecasts of continuing hot temperatures this week, THPRD will offer six of its Beaverton-area facilities as “cooling centers” through this Sunday, July 5. 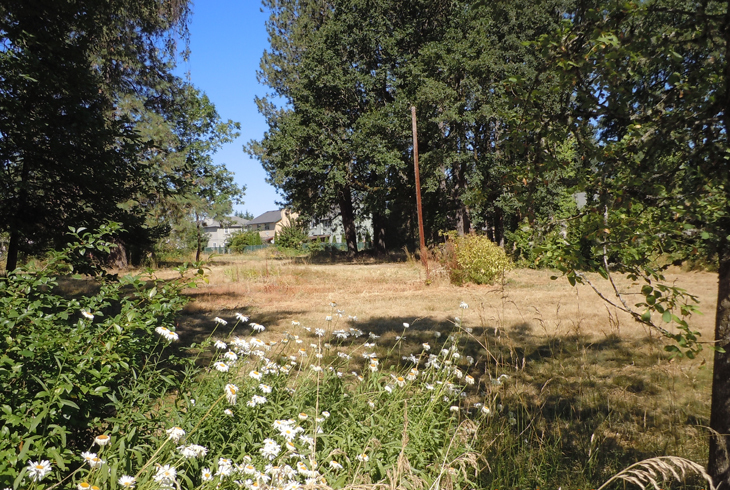 Thanks to the recent efforts of THPRD’s Maintenance Operations department, residents of Portland’s West Slope area are enjoying better access to their neighborhood park. As he departs today after 35 years at THPRD, Jim McElhinny is more inclined to enjoy a good laugh than to reflect on the legacy of his work as the district’s director of Park & Recreation Services. 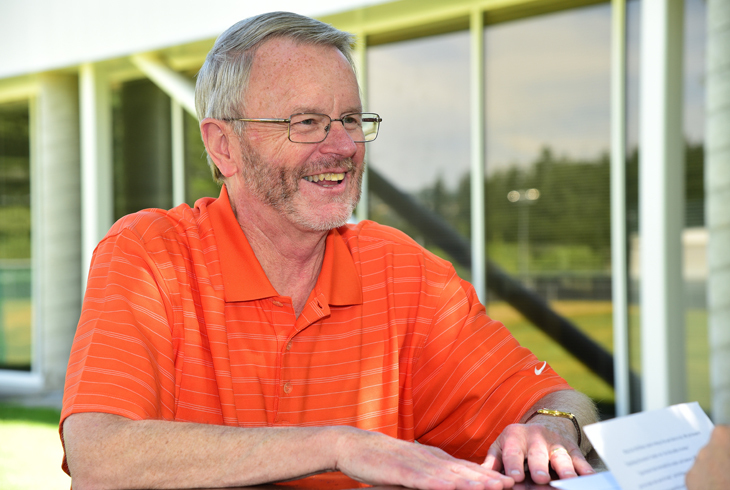 Jim McElhinny, one of the Tualatin Hills Park & Recreation District’s most accomplished employees, will retire on June 30. 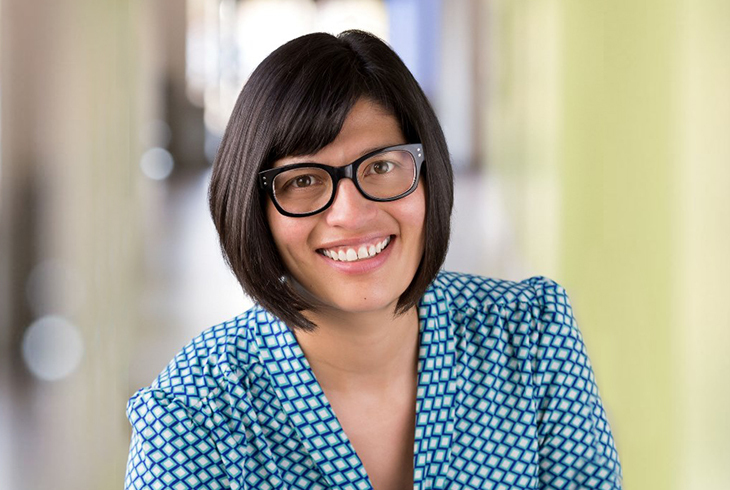 Aisha Panas, THPRD’s director of Planning since July 2014, has been selected to succeed McElhinny. 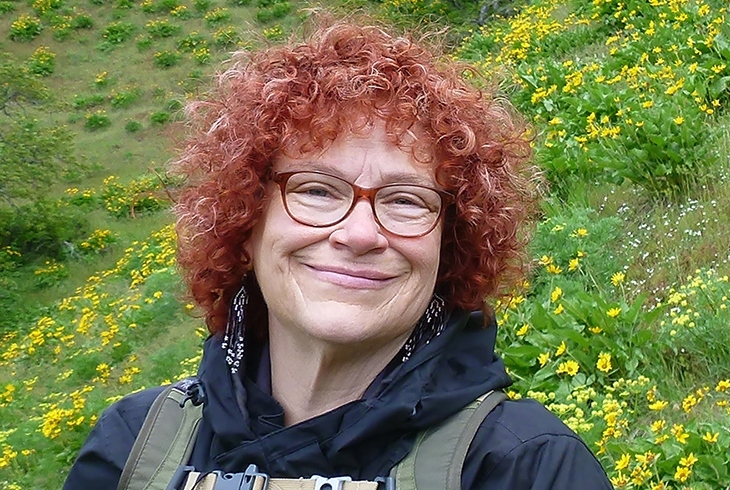 The THPRD Board of Directors is considering a request to change the name of Hideaway Park in the Garden Home area to Babette Horenstein Memorial Park, in honor of the longtime THPRD board member. 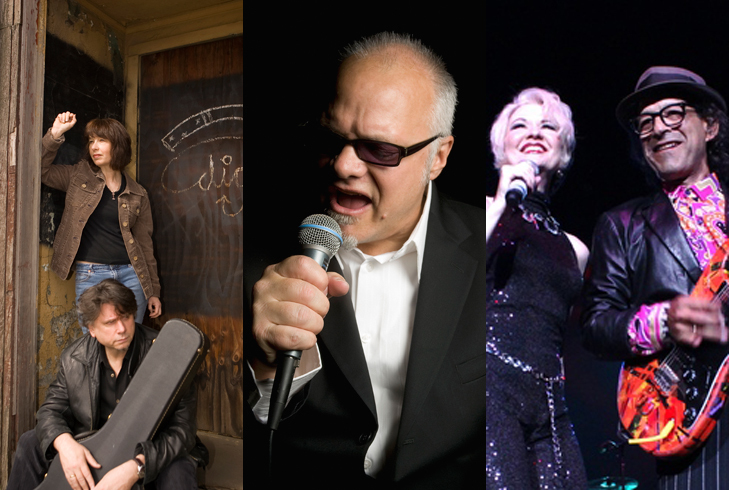 Four concerts and one stage show comprise this year’s Concert & Theater in the Park lineup. All shows, 6-8 pm, will feature free activities for children, including the Rec Mobile and Nature Mobile. 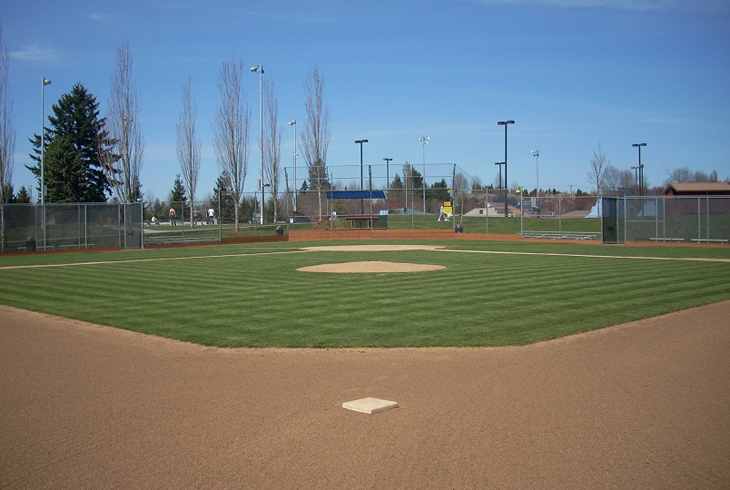 The series debuts on July 2 at Arnold Park. 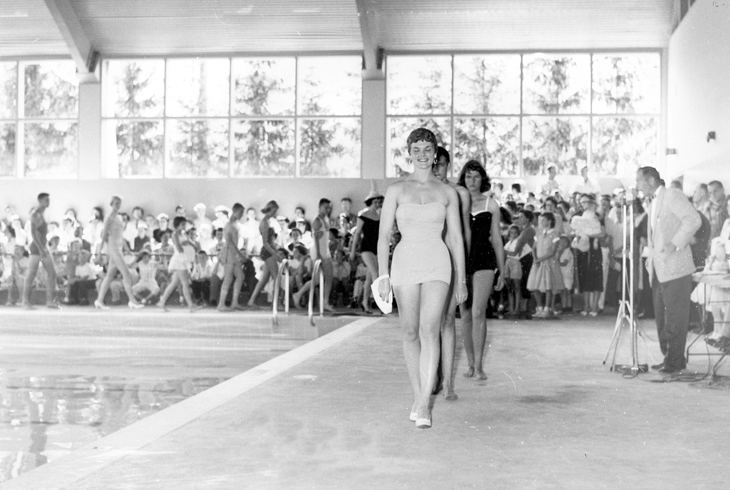 "Back to the '50s," a special event for children and adults to celebrate the Tualatin Hills Park & Recreation District's 60th anniversary, will be held Saturday, June 27, at the historic Beaverton Swim Center, 2-4 pm. 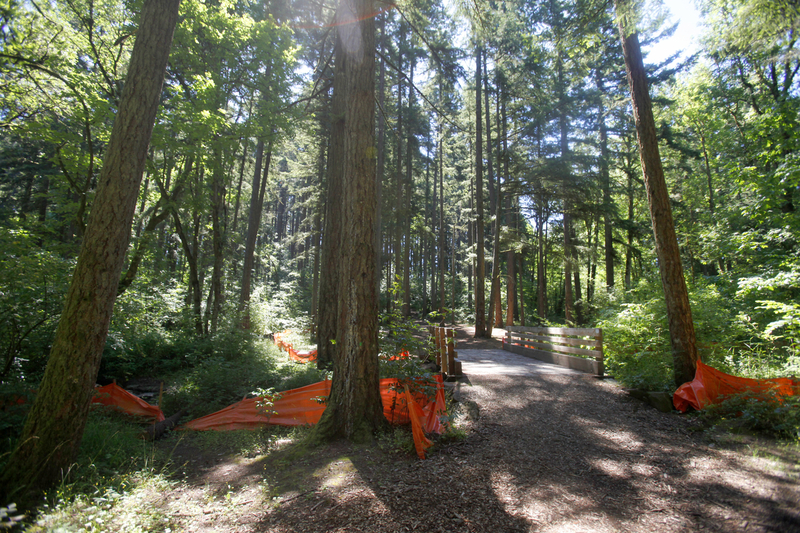 By June 1, THPRD will reopen a portion of the loop path in Greenway Park that has been closed since October 2014. 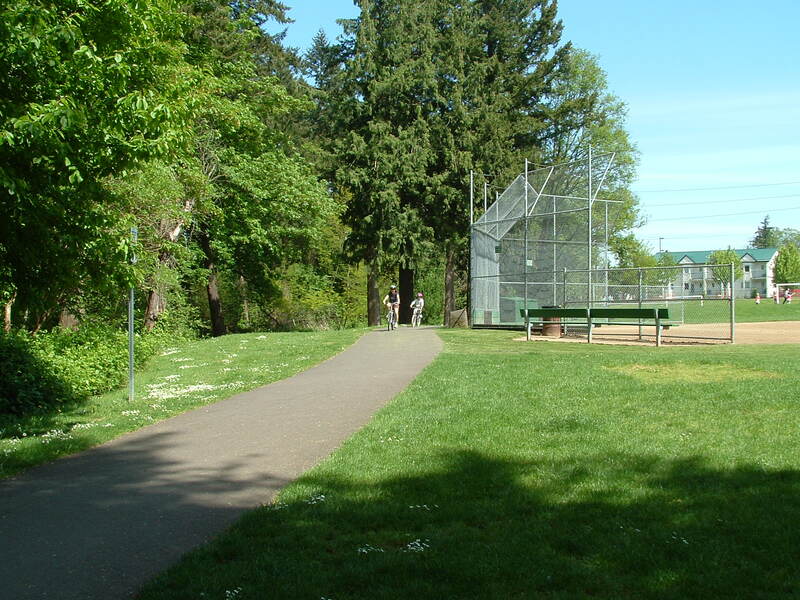 The tennis courts at Cedar Mill Park will be closed, May 14-23, in order that the courts can be surfaced. We apologize for the inconvenience. Please visit the outdoor courts at other THPRD sites until the conclusion of this project. 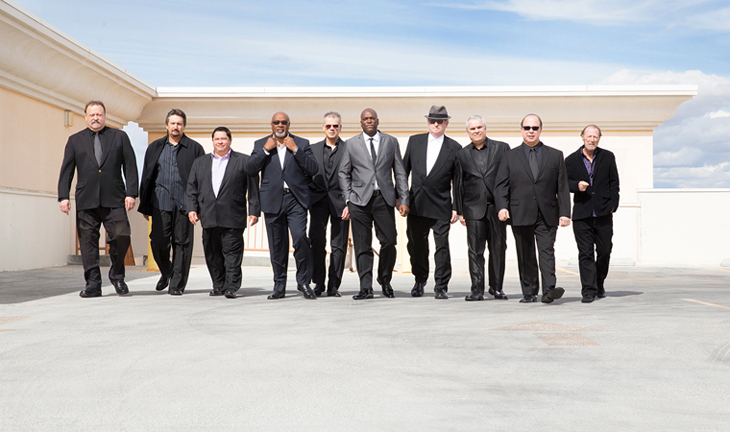 Tower of Power, the iconic 10-piece ensemble that has wowed audiences for nearly 50 years – will headline THPRD’s annual Groovin’ on the Grass concert event on Saturday, Aug. 15, 6-8:30 pm. 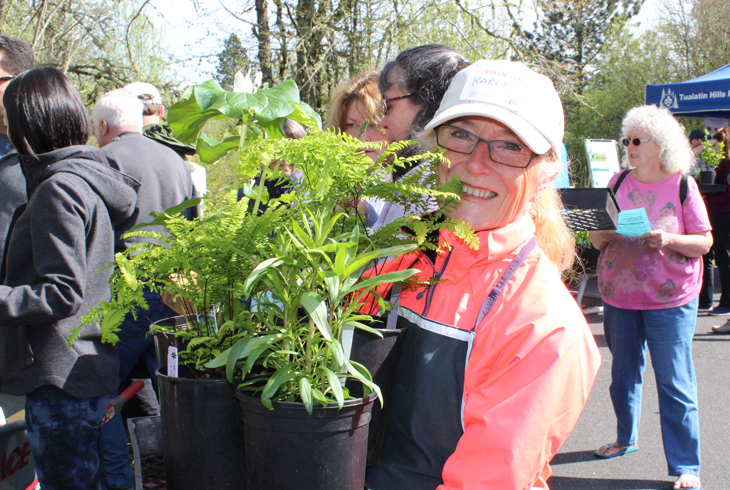 The Tualatin Hills Park & Recreation District hosts its 15th annual Spring Native Plant Sale on Saturday, April 25, at the Tualatin Hills Nature Center (15655 SW Millikan Way, Beaverton). The free event takes place from 10 am to 2 pm. 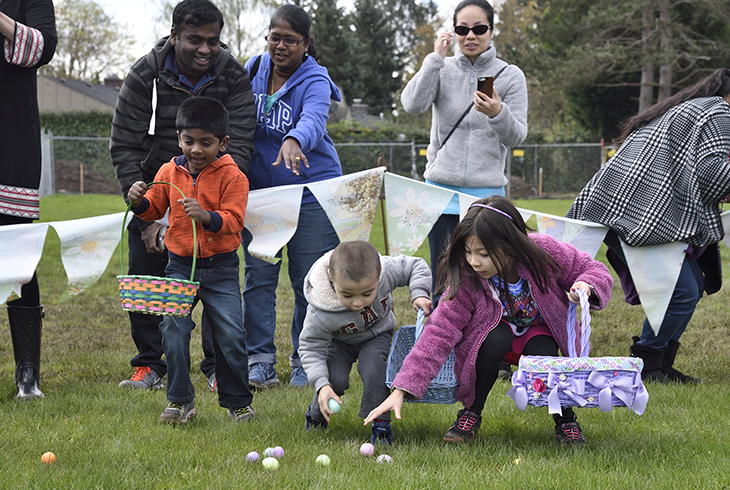 THPRD staff have rounded up a parcel of eggs and one floppy-eared host for three highly anticipated egg hunts, April 3-4, at the district’s recreation centers. 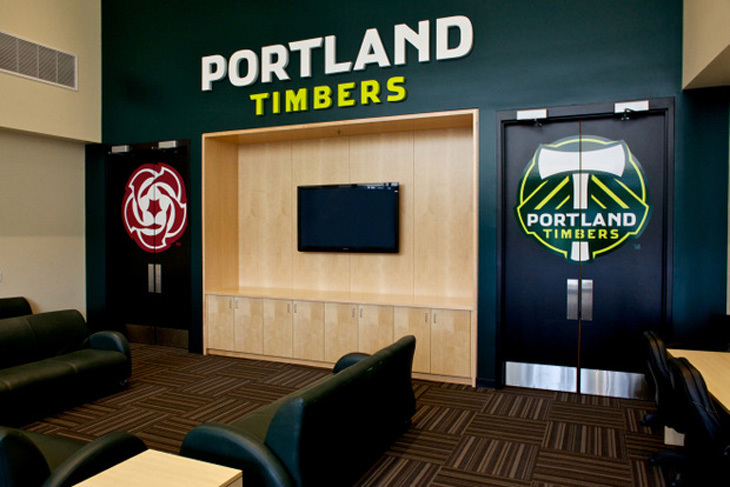 The Portland Timbers have completed a 2,600-square-foot expansion of the adidas Timbers Training Center in Beaverton as part of a new agreement with THPRD. 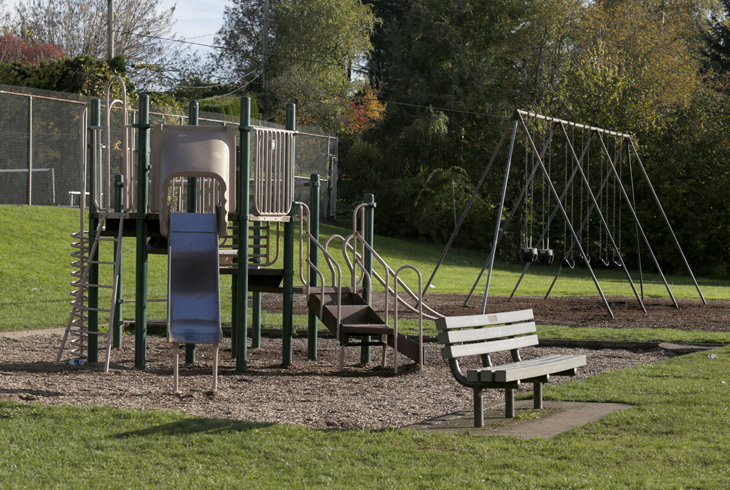 The Tualatin Hills Park & Recreation District will host an open house on Tuesday, March 3, to provide residents the opportunity to review and comment on functional plans recently drafted to guide the district’s oversight of parks and recreational programs. For most public agencies, March 4 is just another date. 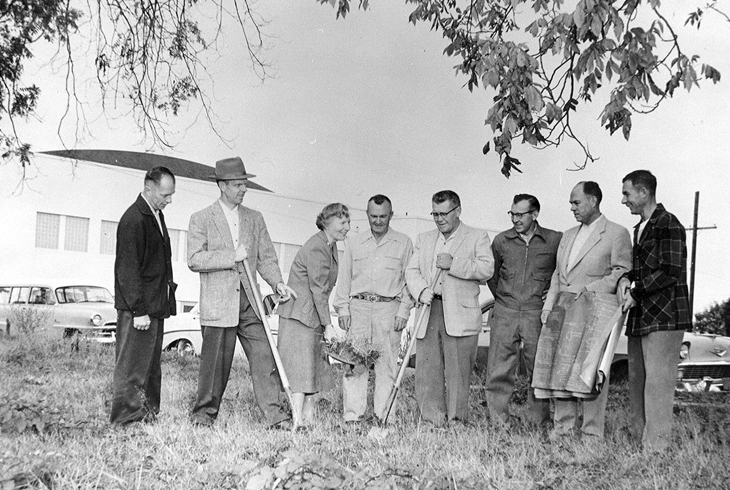 Not for the THPRD, which will celebrate the 60th anniversary of the day -- in 1955 -- that voters in the Beaverton area approved a taxing structure for the district, and the agency was officially born. 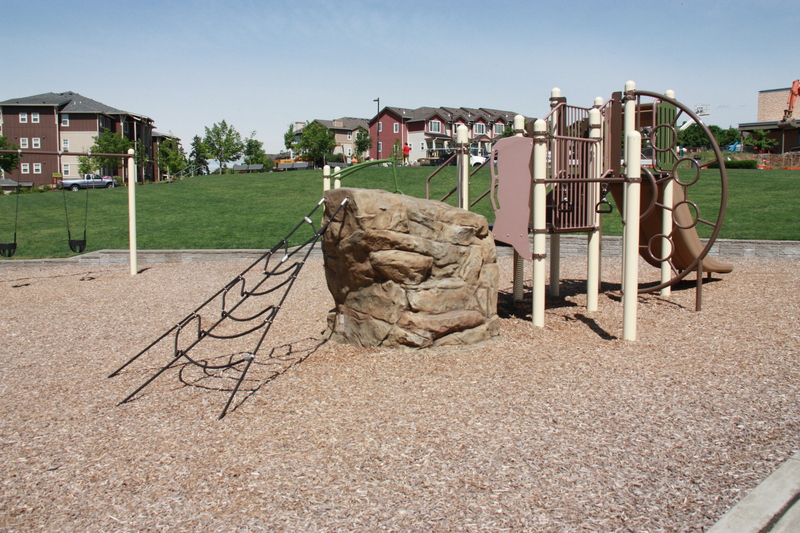 THPRD will host an open house on Tuesday, March 3 (6-7:30 pm), to provide residents the opportunity to review and comment on functional plans recently drafted to guide the district’s oversight of parks and recreational programs. 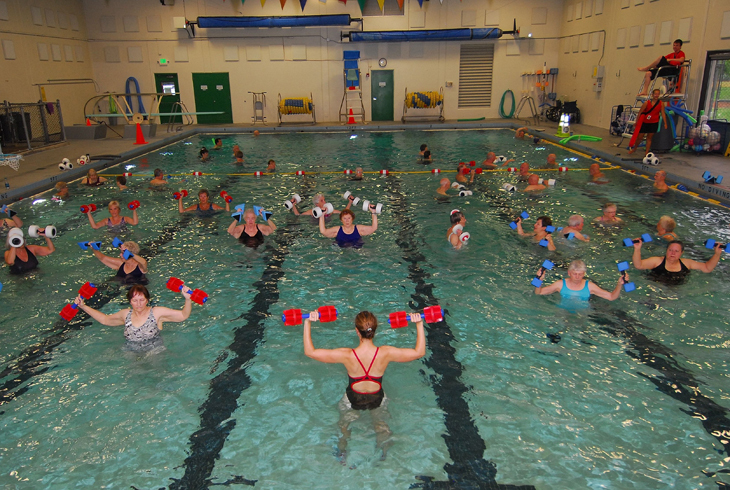 THPRD is reinstating its Aquatics Fitness Pass, which entitles the user to participate 20 times in any water exercise class the park district offers at its eight pools. 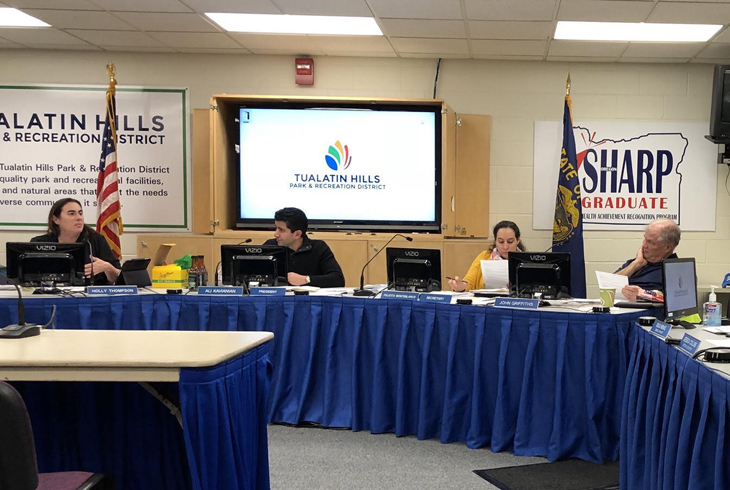 Anthony Mills and Shannon Kennedy have been reappointed to new three-year terms on the Tualatin Hills Park & Recreation District’s Budget Committee. 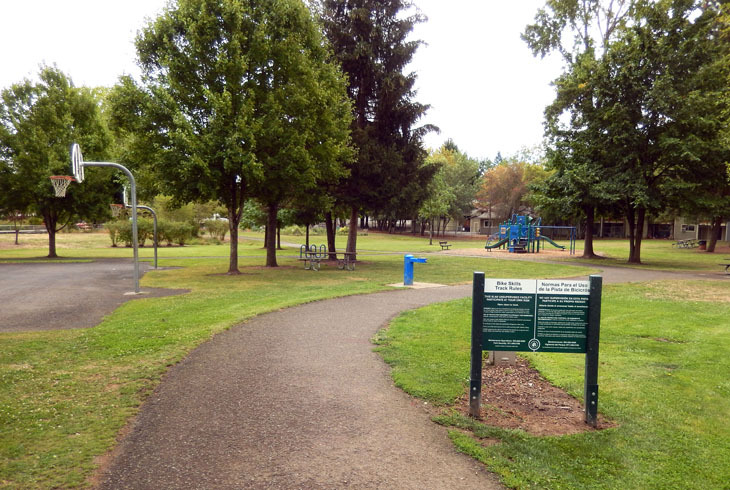 The Tualatin Hills Park and Recreation District has completed the acquisition of two properties in Aloha to be used for future parks. 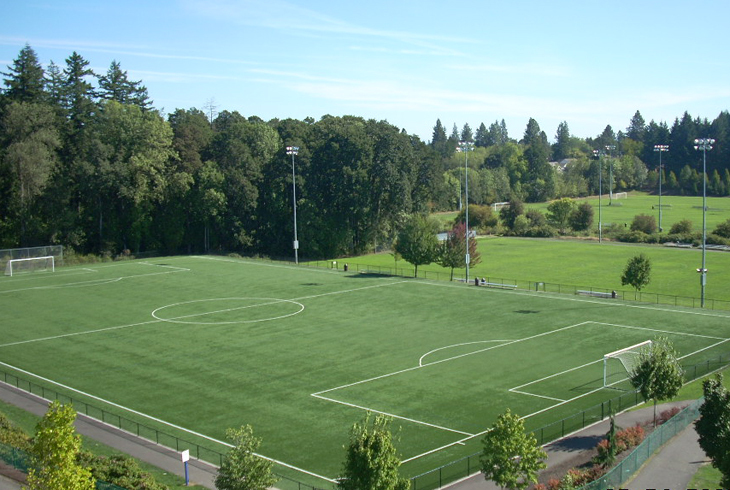 The Tualatin Hills Park &amp; Recreation District and Beaverton School District have signed an agreement that will allow the park district to build a new synthetic turf athletic field at Conestoga Middle School, 12250 SW Conestoga Drive, Beaverton. 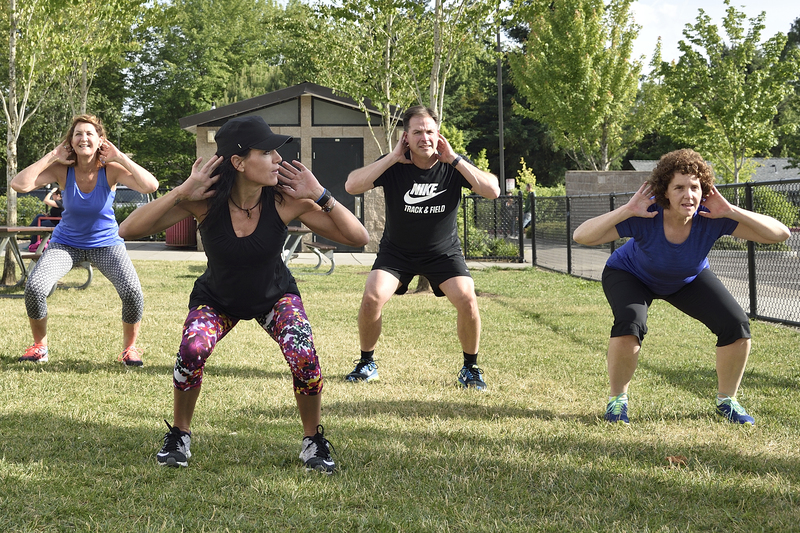 The Tualatin Hills Park & Recreation District will implement changes starting Jan. 1 that will benefit many fitness enthusiasts, military families, and participants who live outside THPRD boundaries. 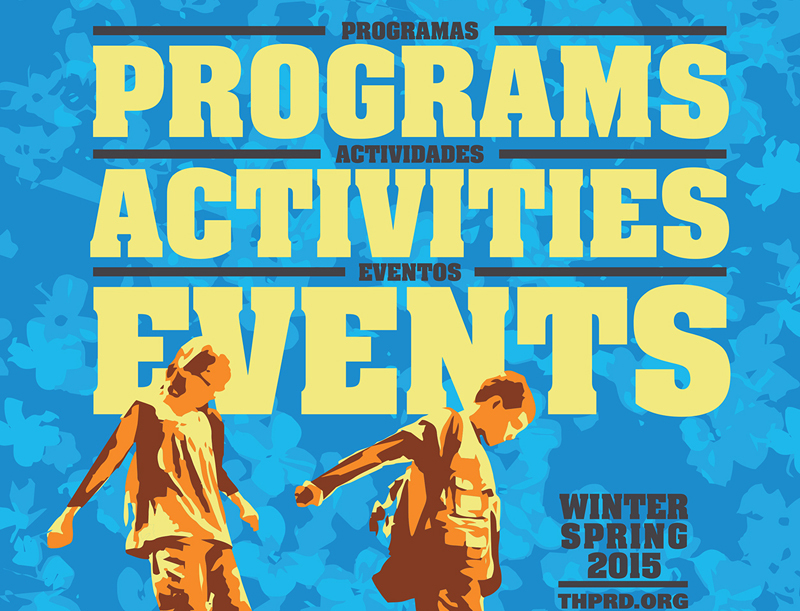 With registration for THPRD's winter programs starting soon, a summary follows to help patrons understand the changes. 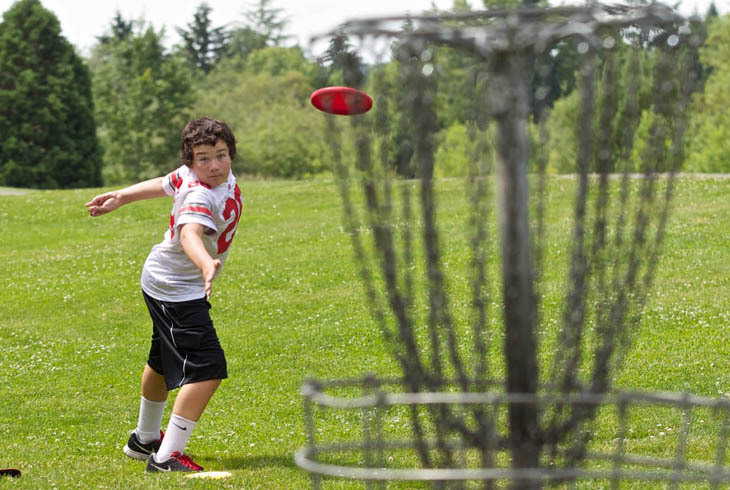 The Tualatin Hills Park & Recreation District's winter/spring 2015 activities guide is now available online and in print at numerous community locations. 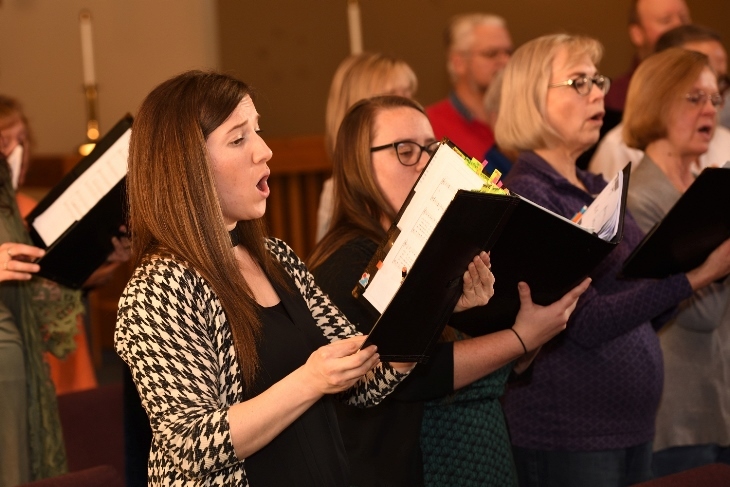 The new guide includes registration information, schedules and fees for hundreds of winter classes, programs, and special events that start in January. 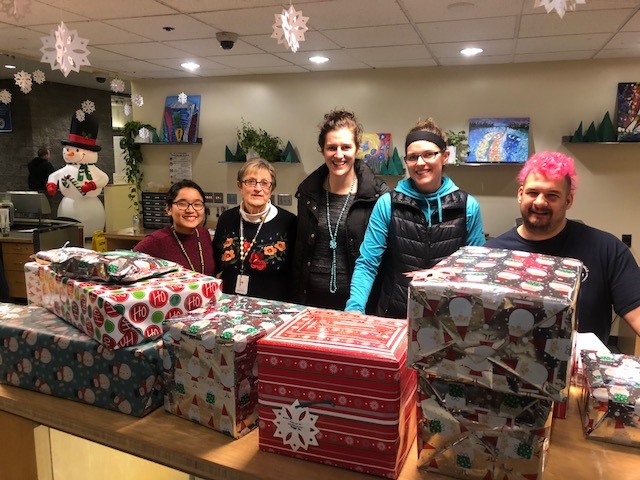 It's become a holiday tradition in the Beaverton area: Tualatin Hills Park & Recreation District employees working to create a brighter season for low-income children and families. 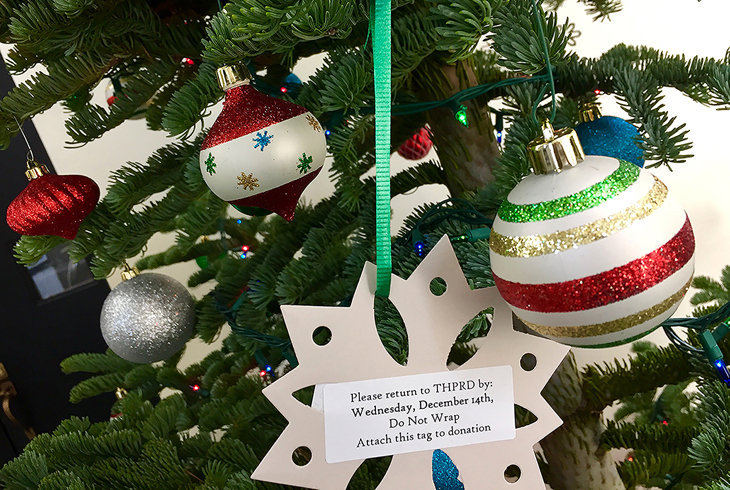 THPRD will again collect toys, clothing and other items for selected families within its boundaries. 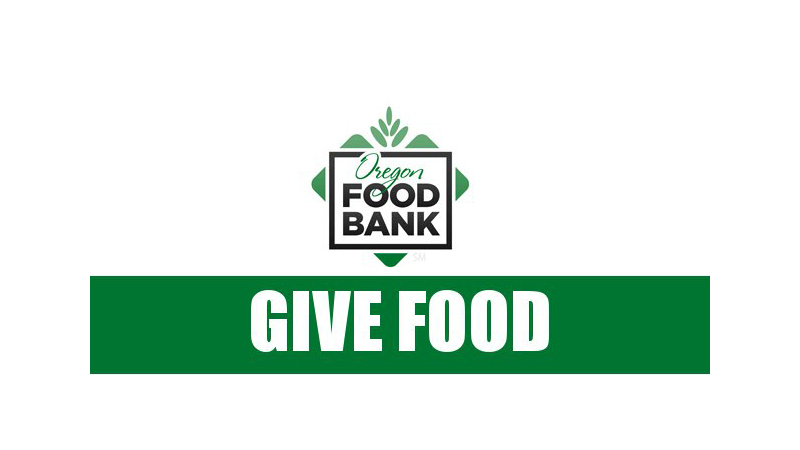 The park district will also collect food for the Oregon Food Bank.